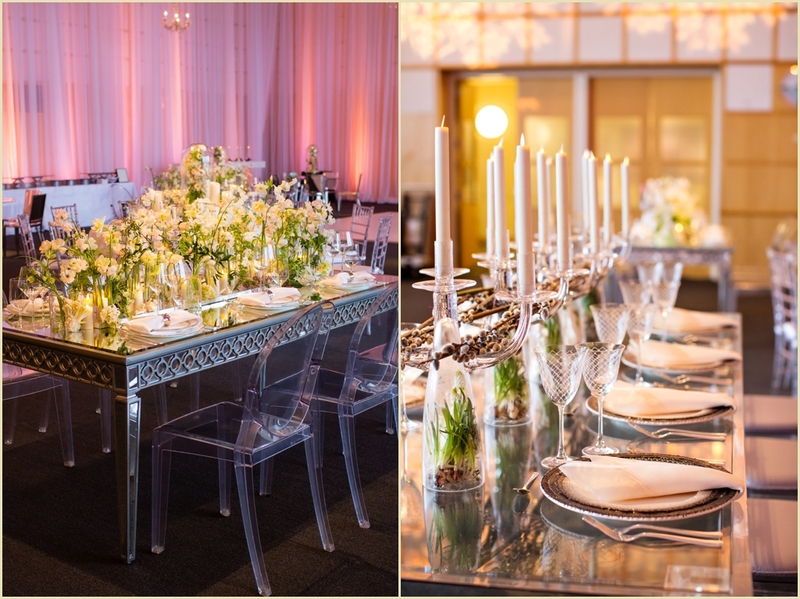 From weddings to private events to birthday soirees and everything in between — we always love working with Marc Hall Design. 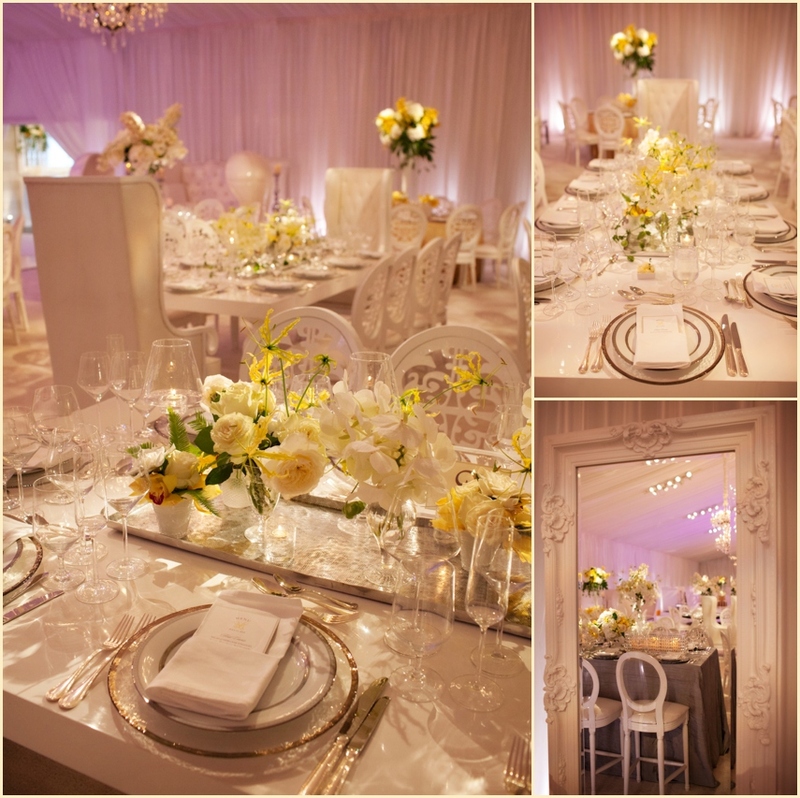 Marc and his team bring an element of elegance and sophistication to everything they do, no matter how big or small. 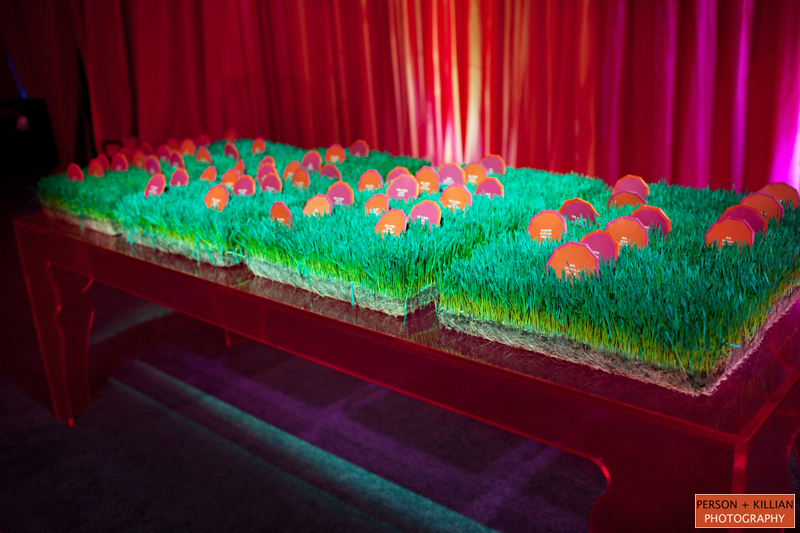 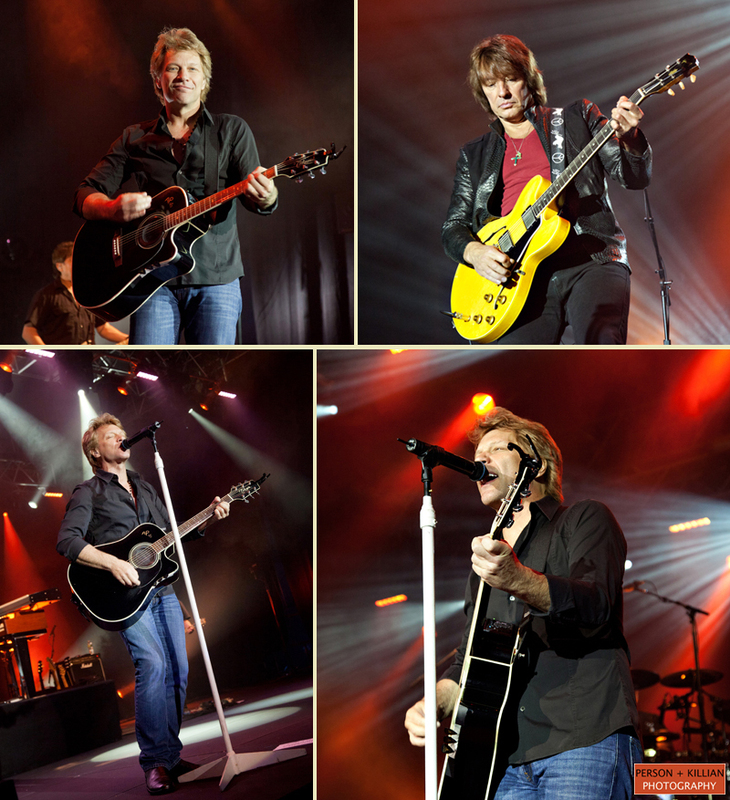 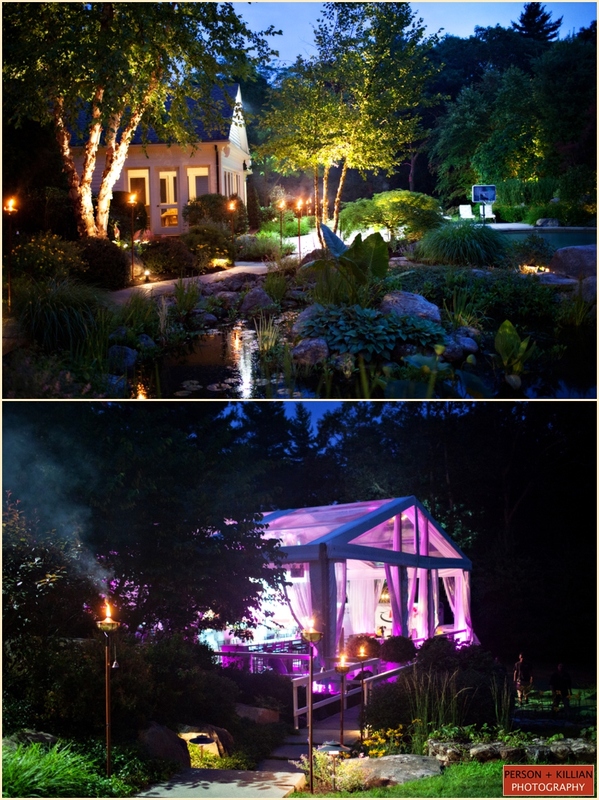 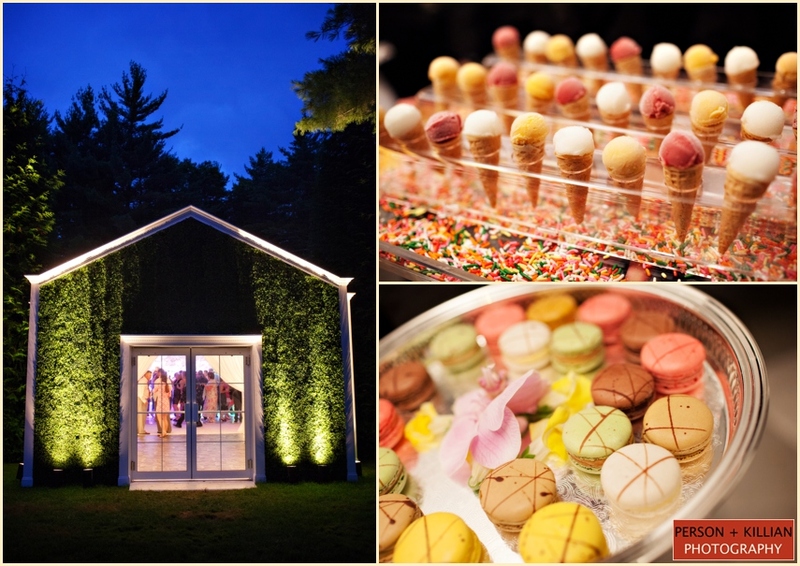 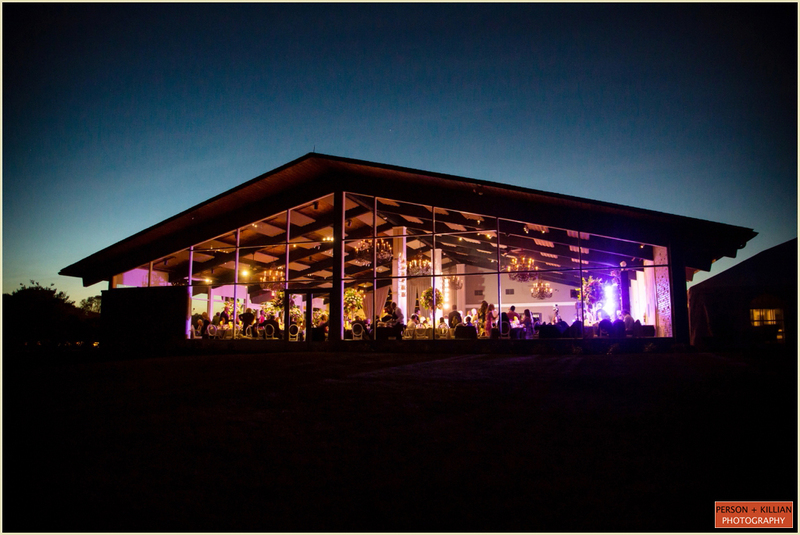 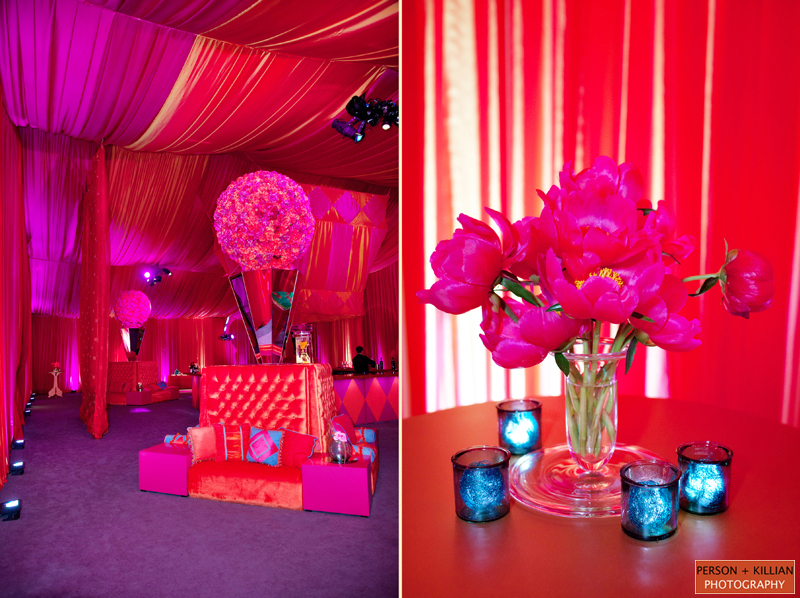 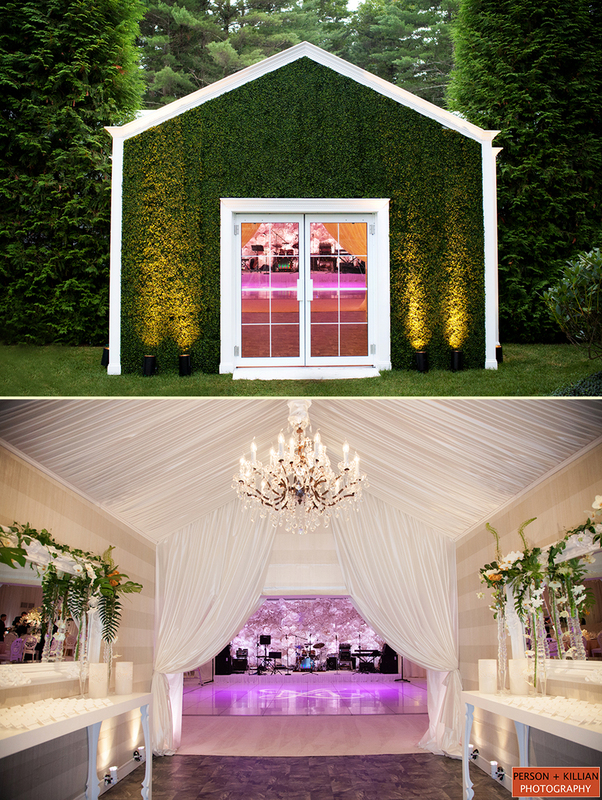 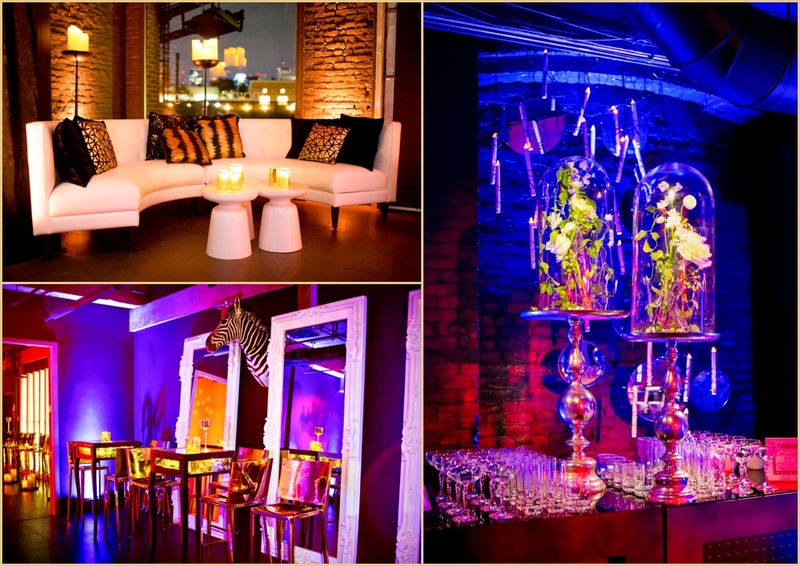 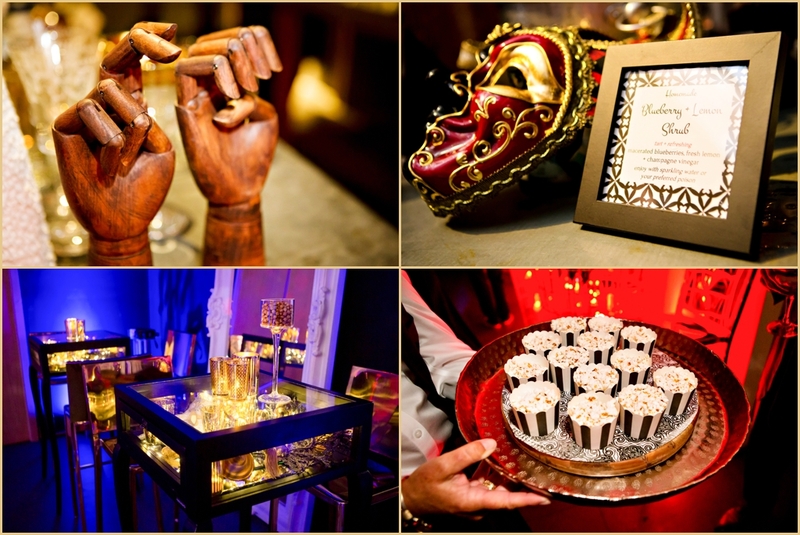 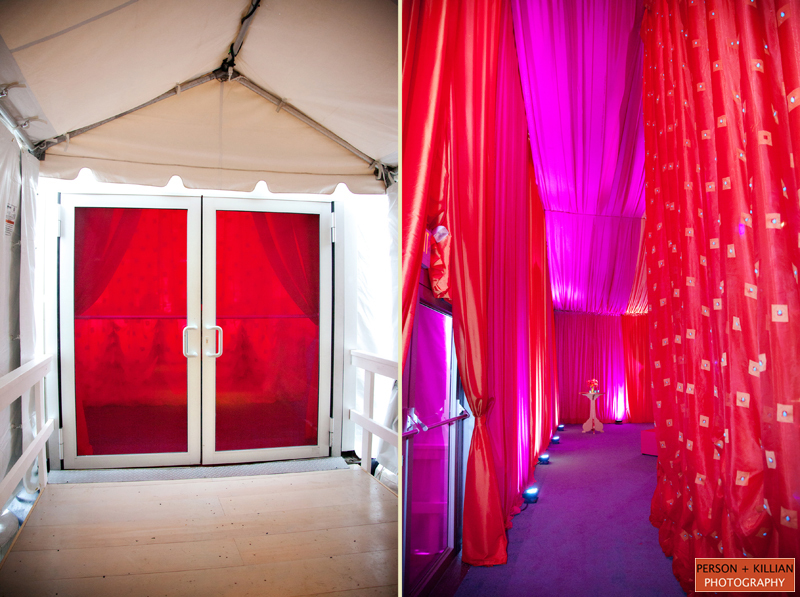 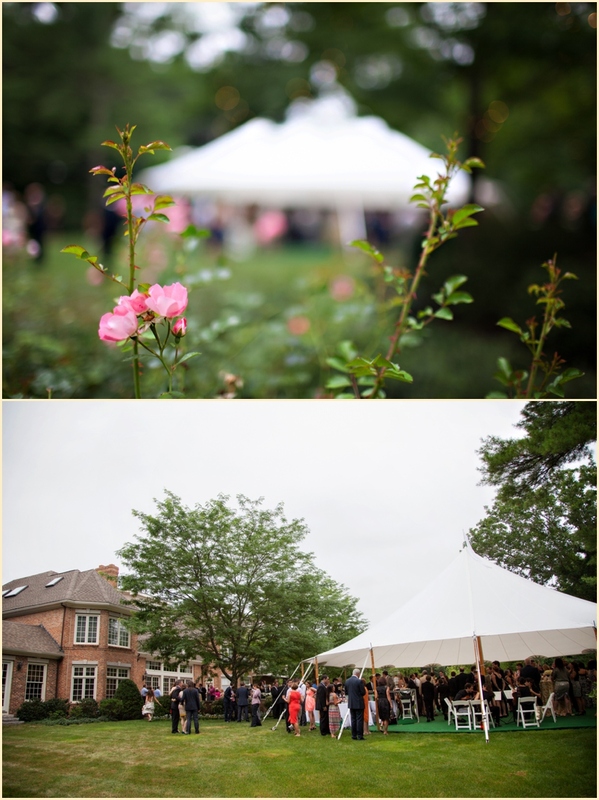 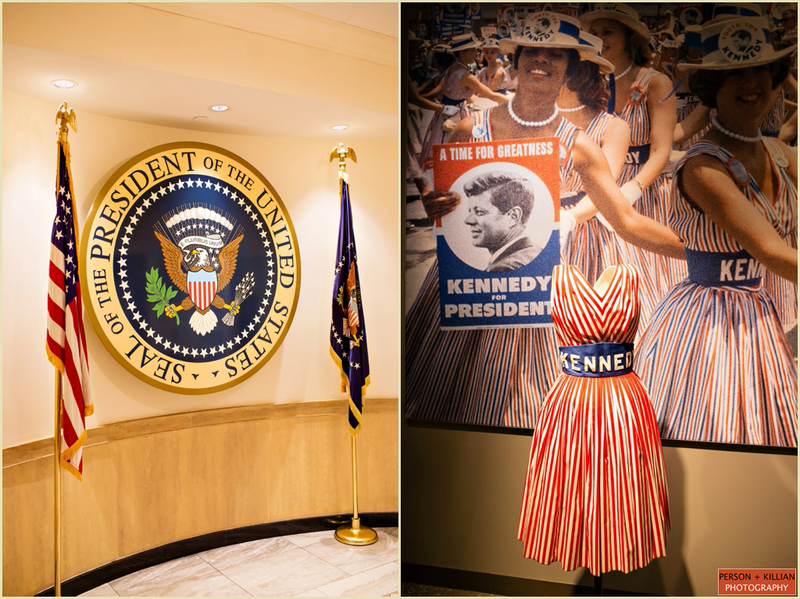 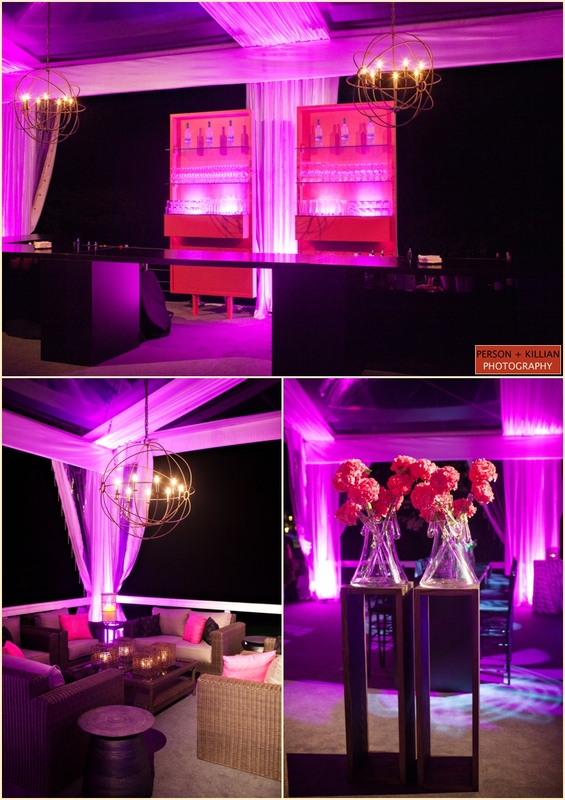 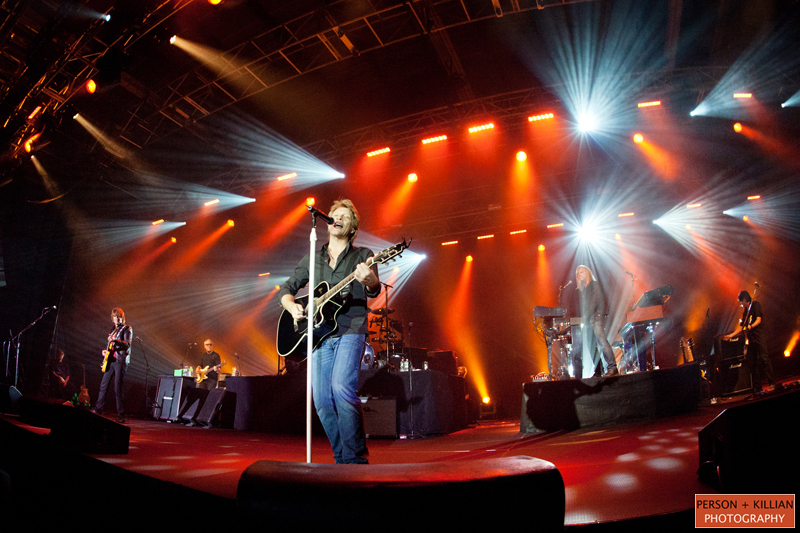 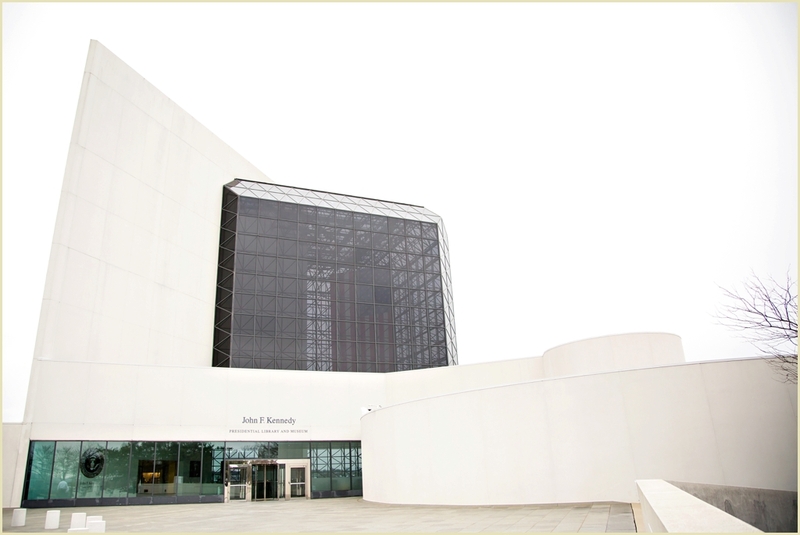 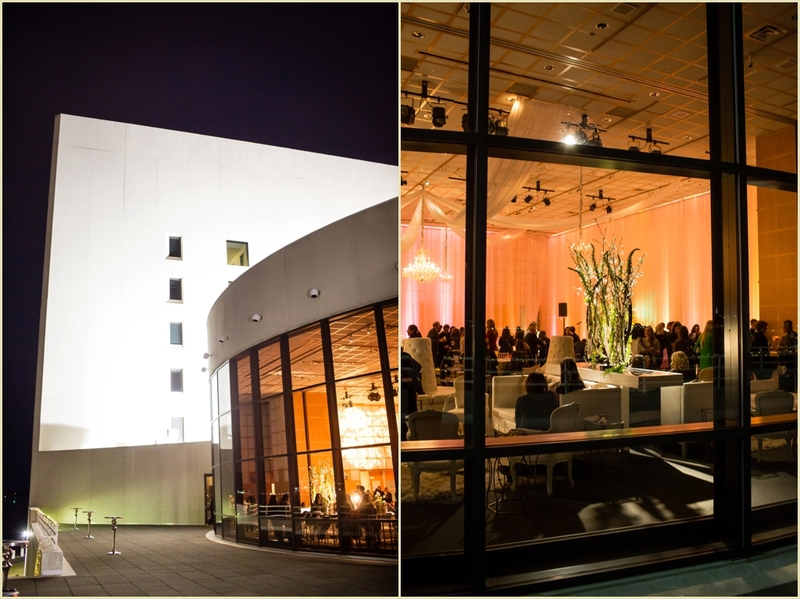 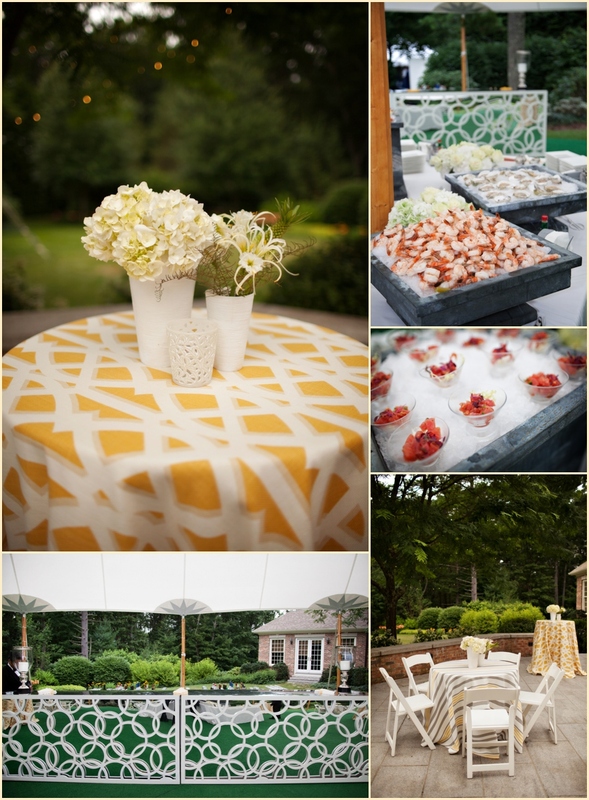 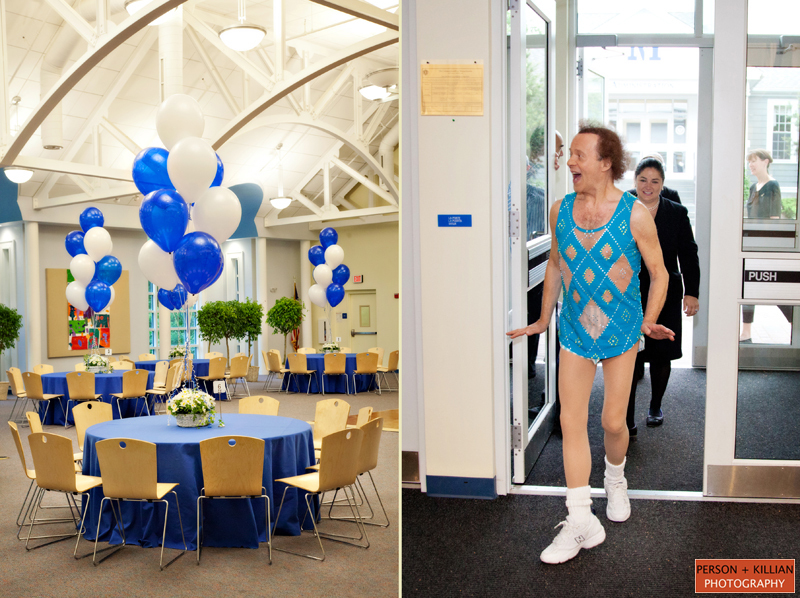 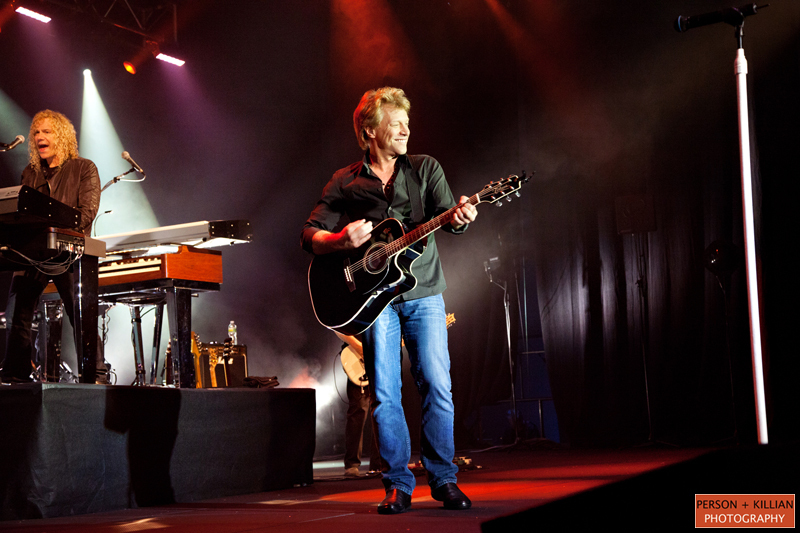 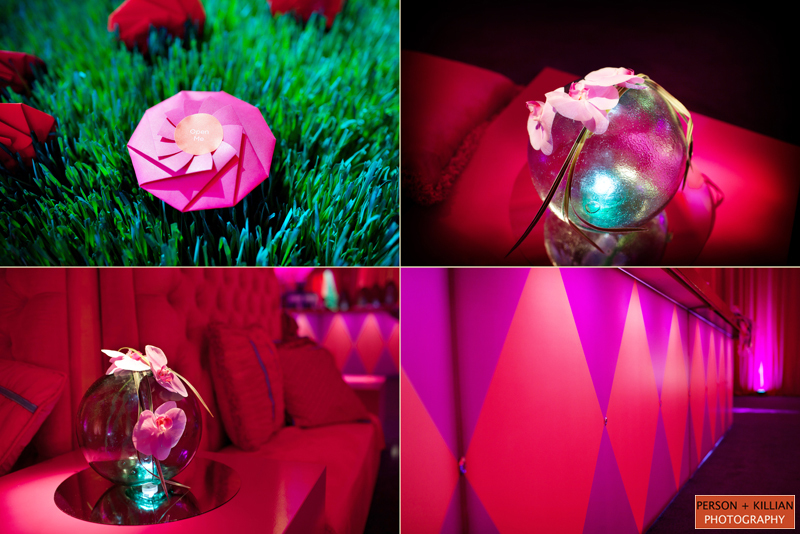 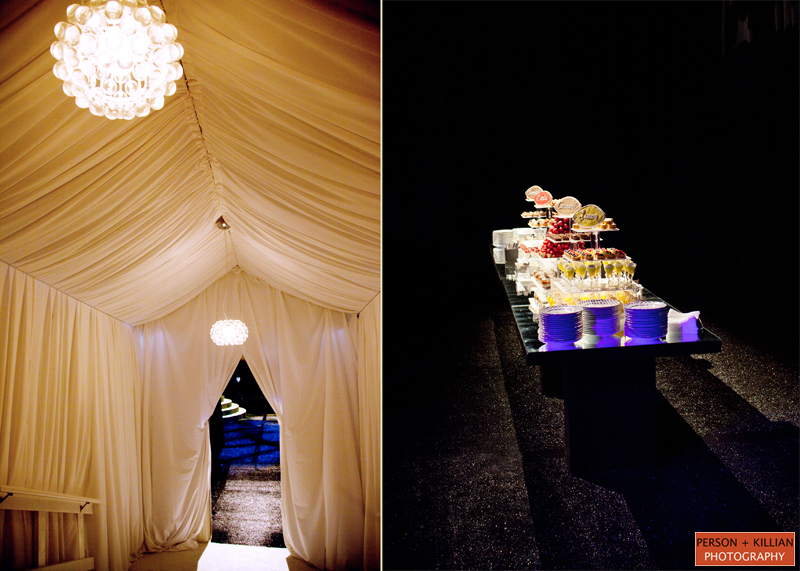 Today we’d like to highlight some of our favorite events with Marc Hall Design over the last year! 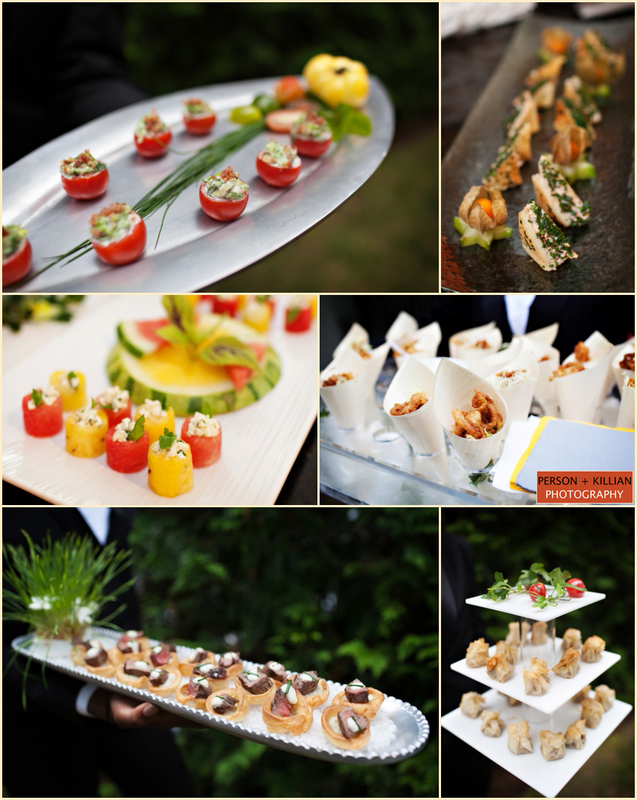 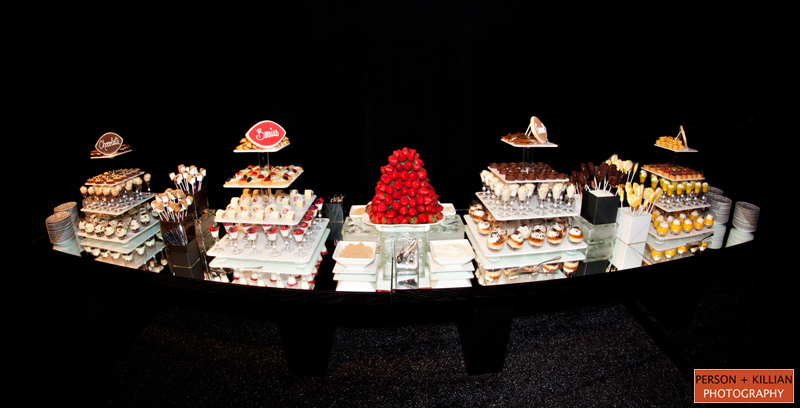 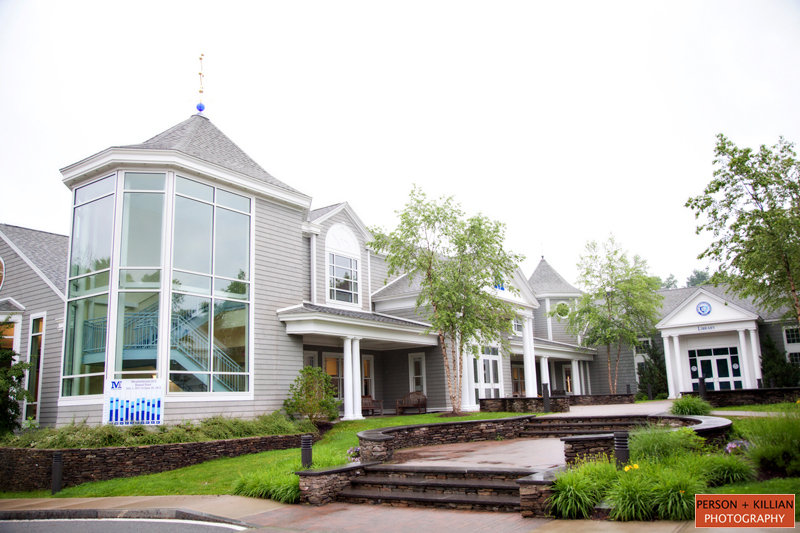 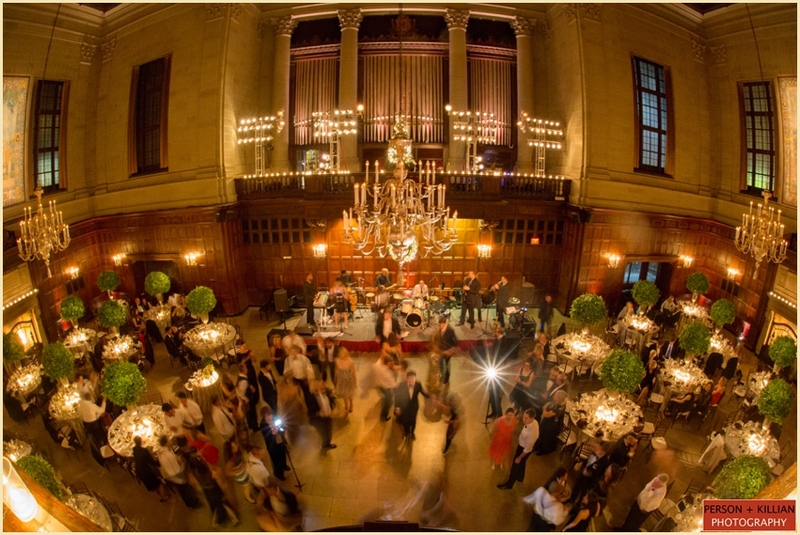 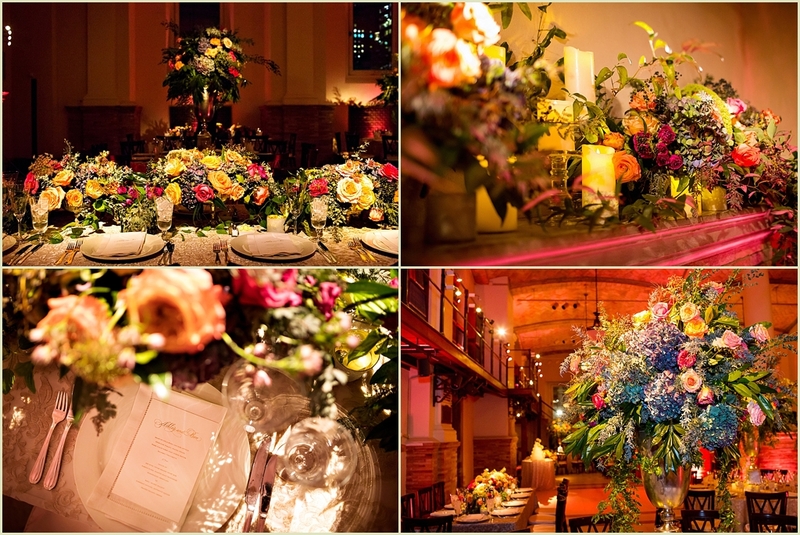 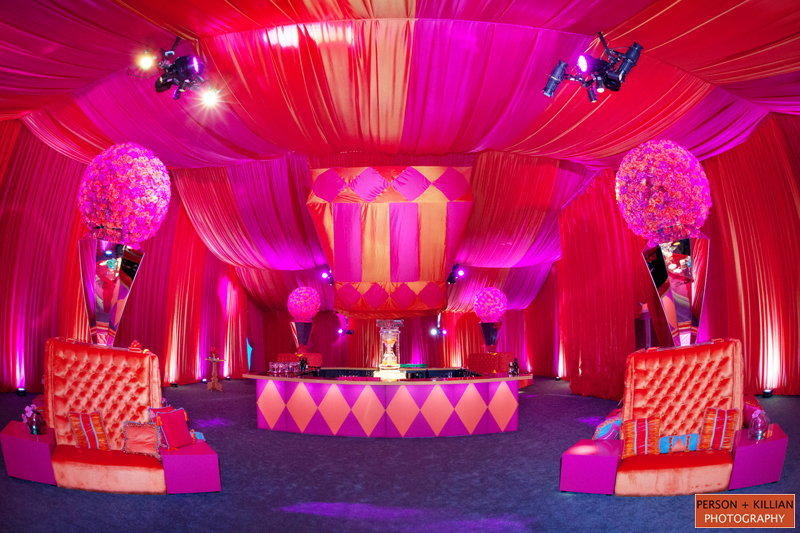 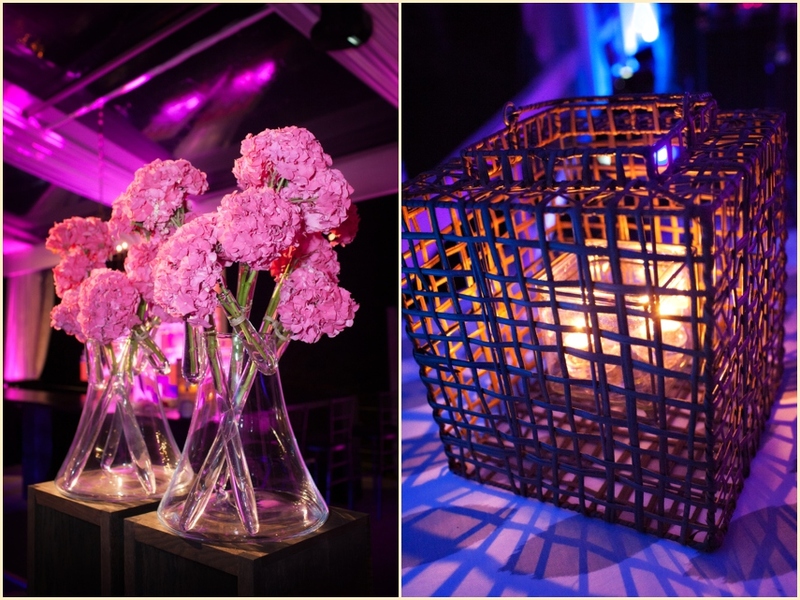 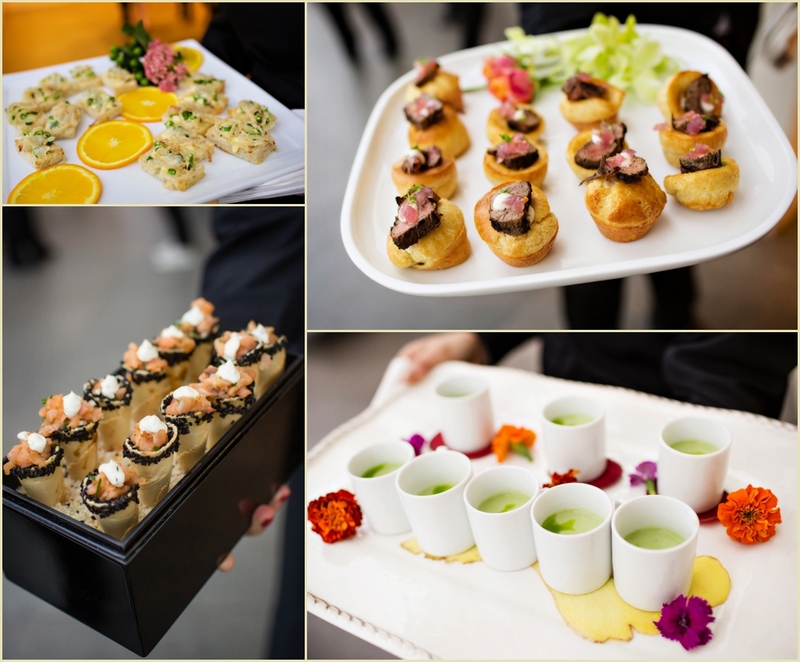 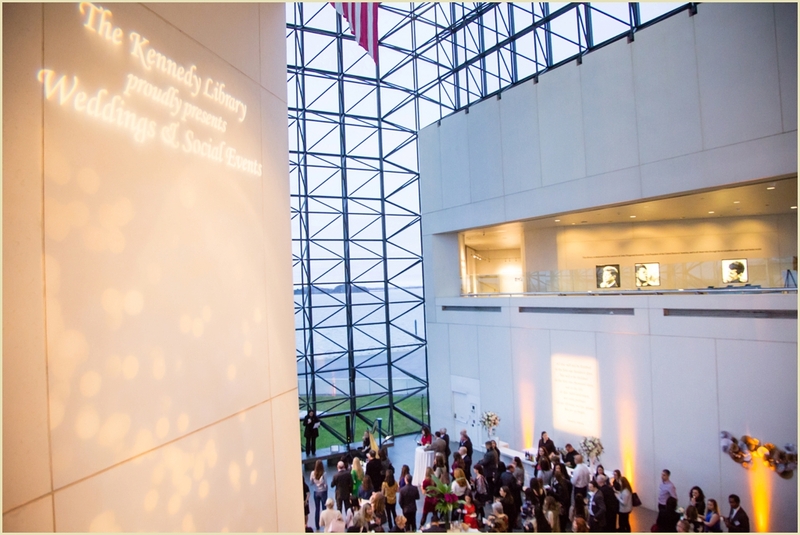 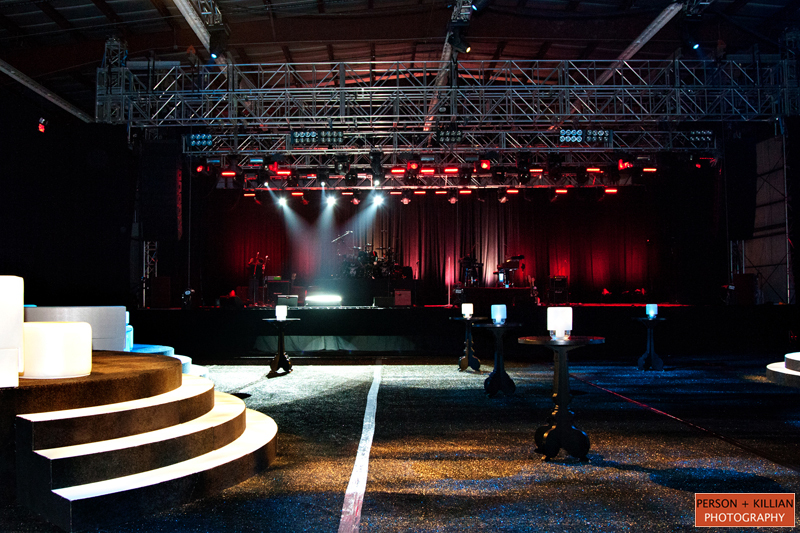 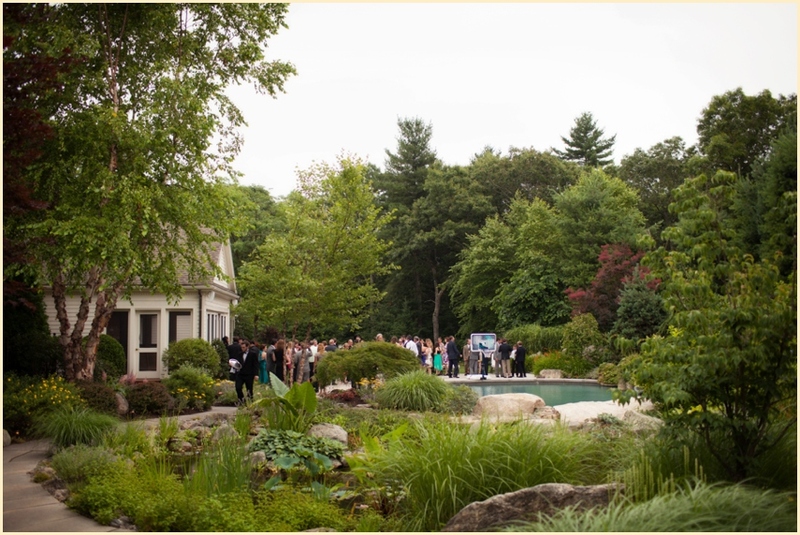 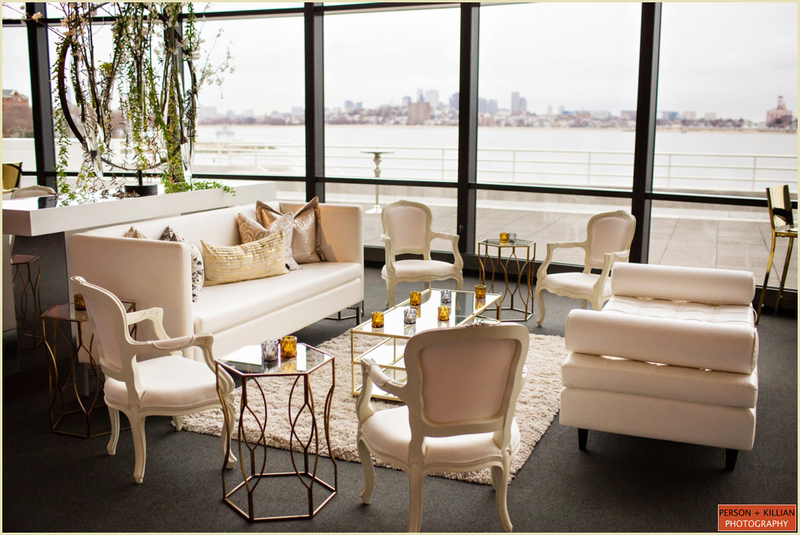 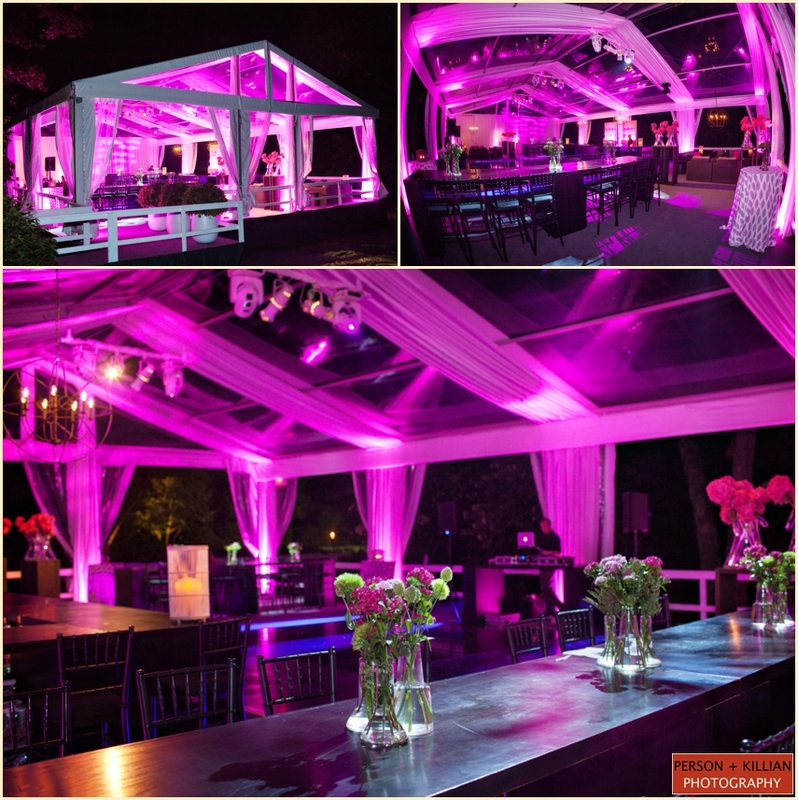 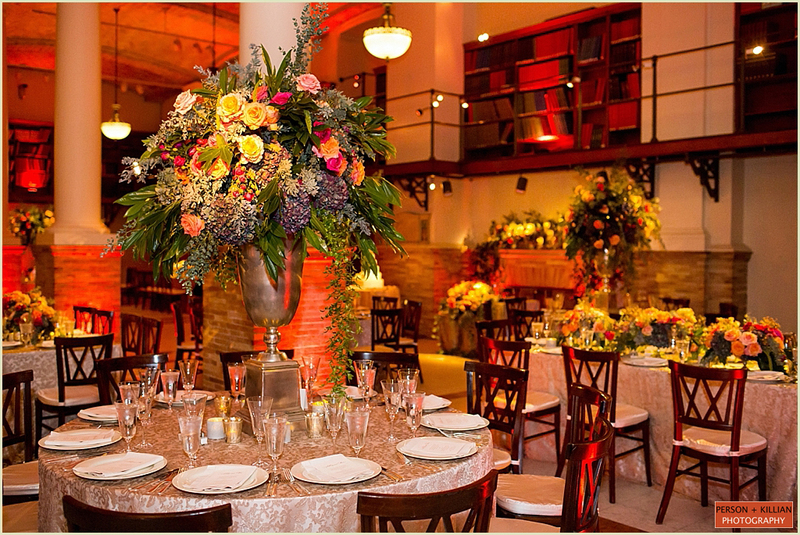 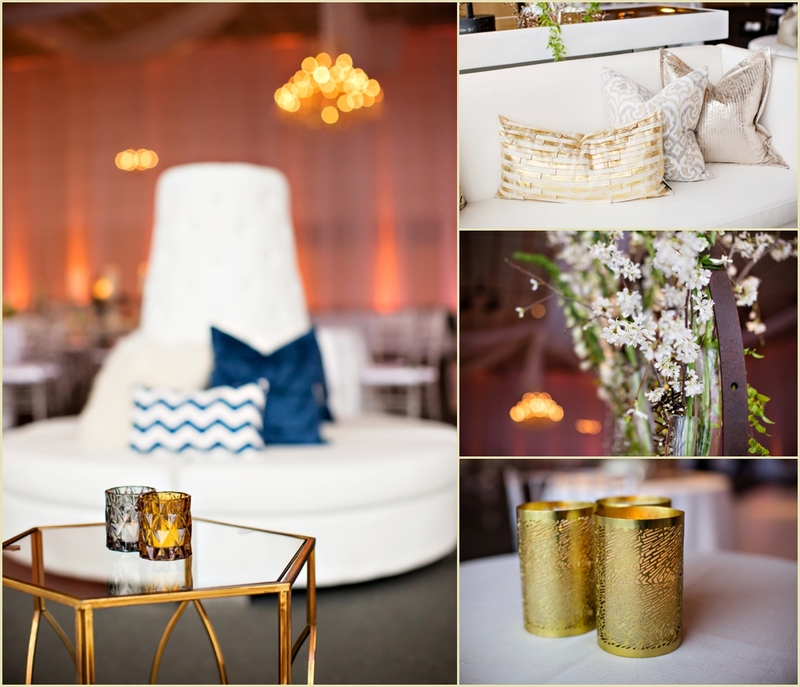 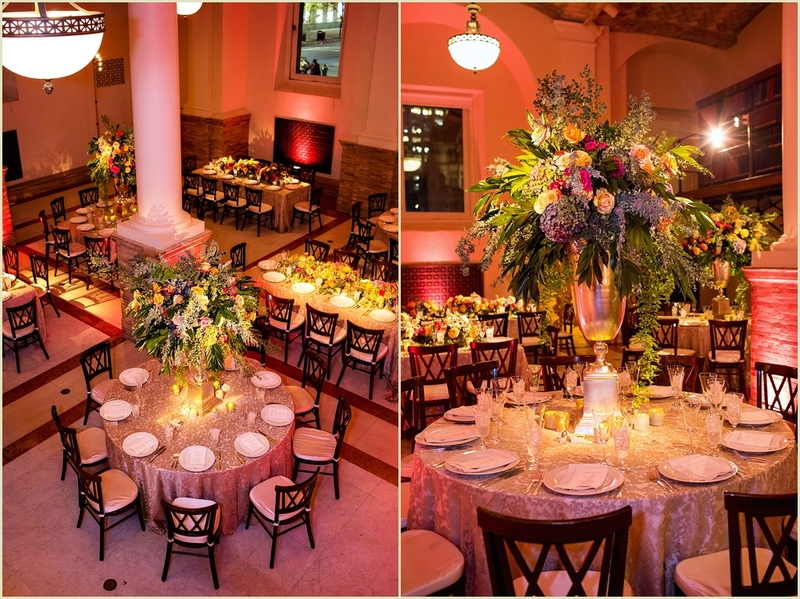 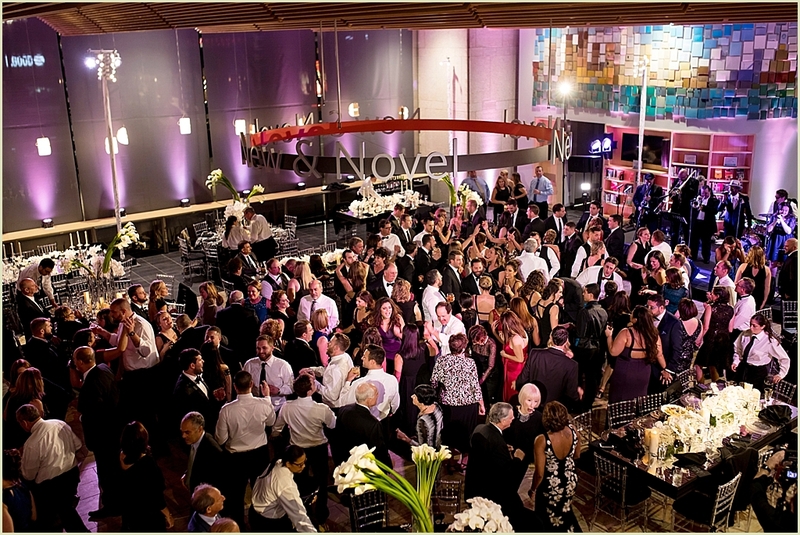 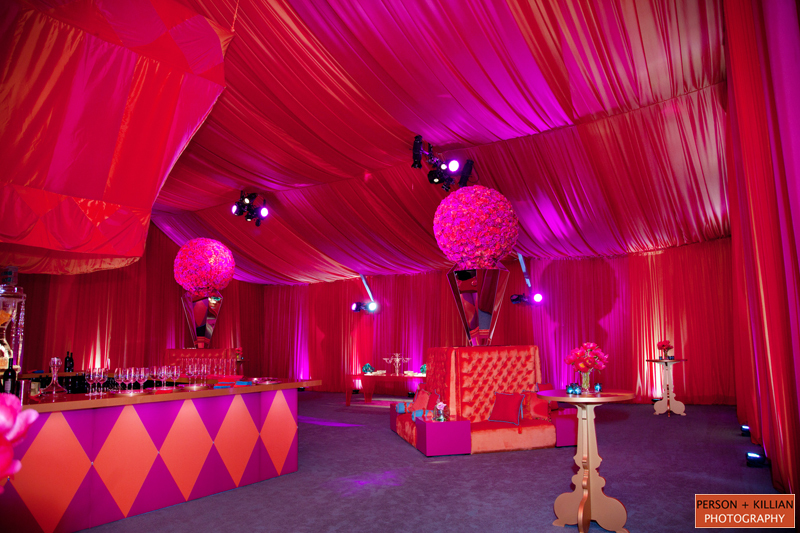 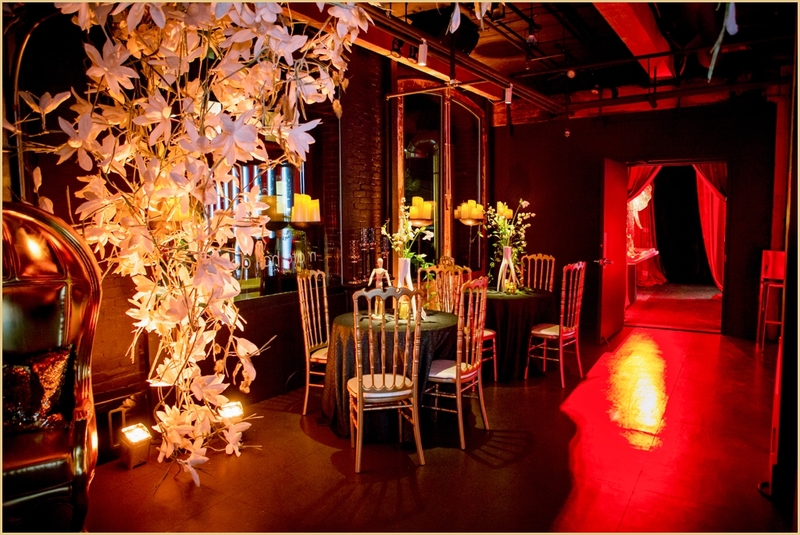 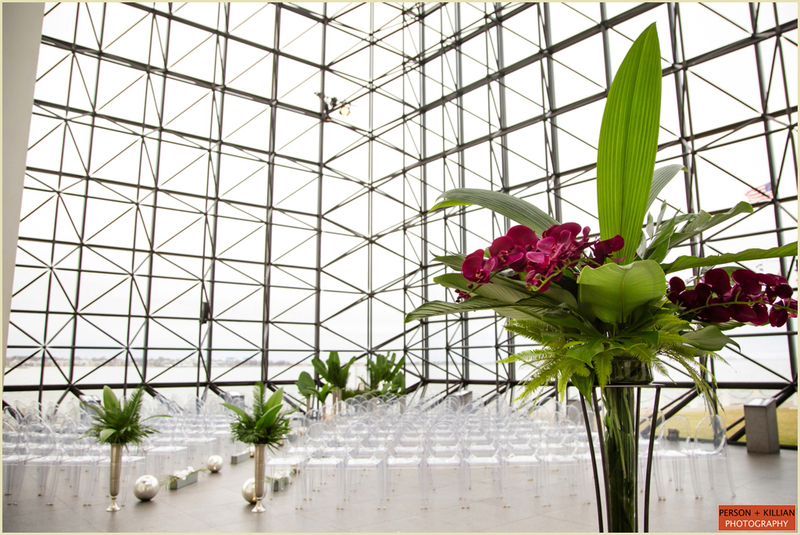 Marc Hall Design not only does full event design, but also works with the best of the best planners and venues in Boston to create the perfect event for each client. 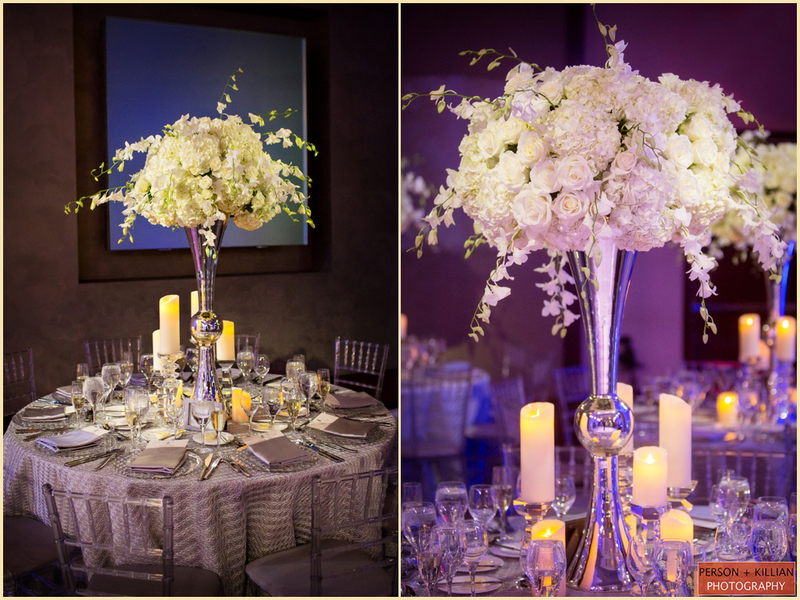 Marc is known for larger-than-life designs — from gorgeous floral chuppahs to overflowing centerpieces to towering accent pieces that often stand over 6 feet tall. 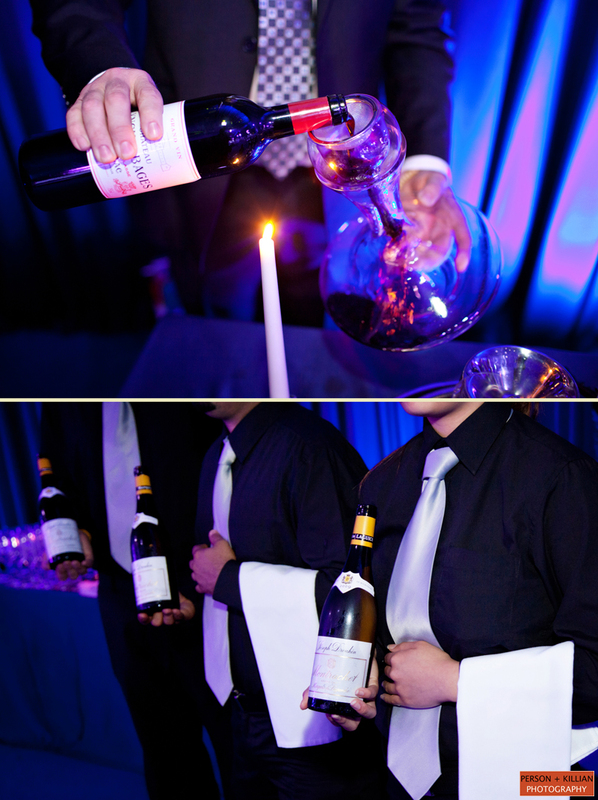 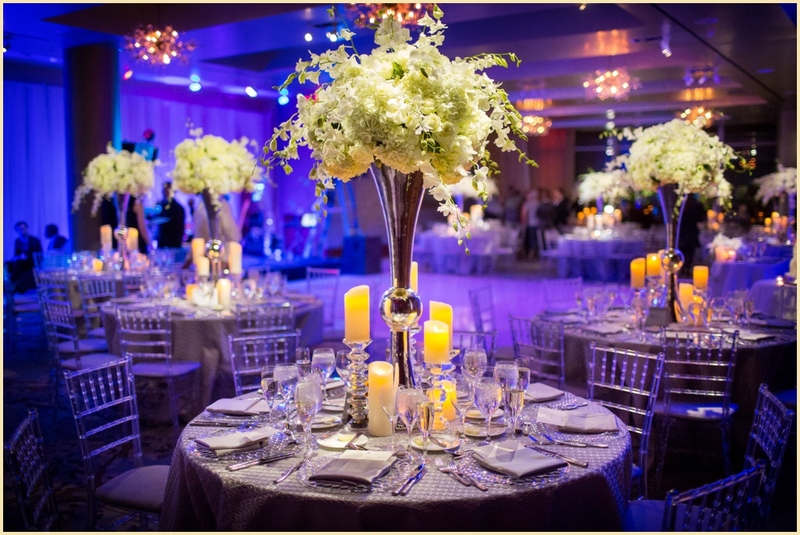 And they never forget all of the small details — elegant bridal bouquets, cocktail tables, and simple monochromatic designs for each unique taste. 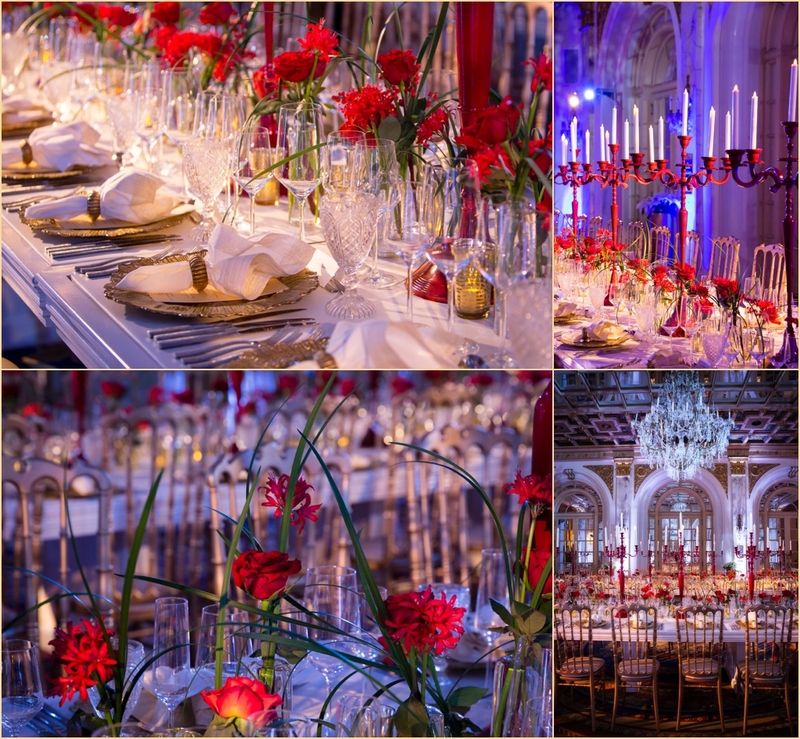 No matter the event or style, Marc and his team always manage to take our breath away. 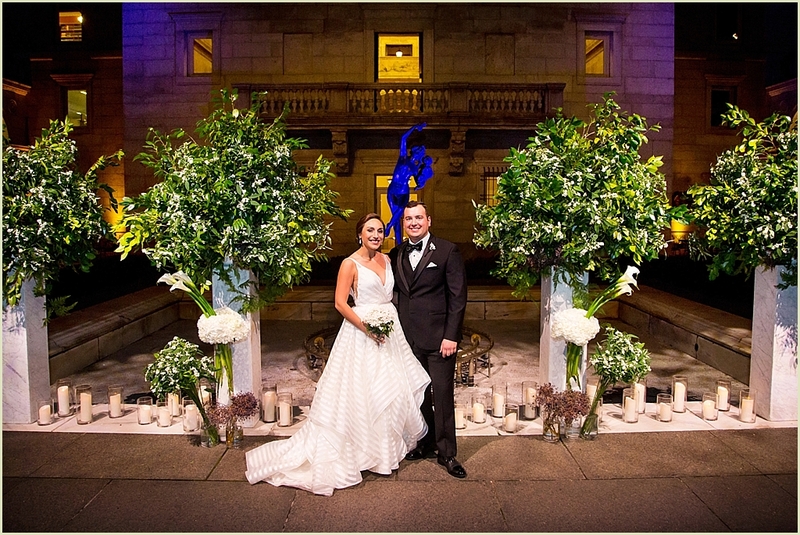 Thank you to Marc and the entire Marc Hall Design Team for being so great to work with, and for always making our mutual couples so happy on their special day! 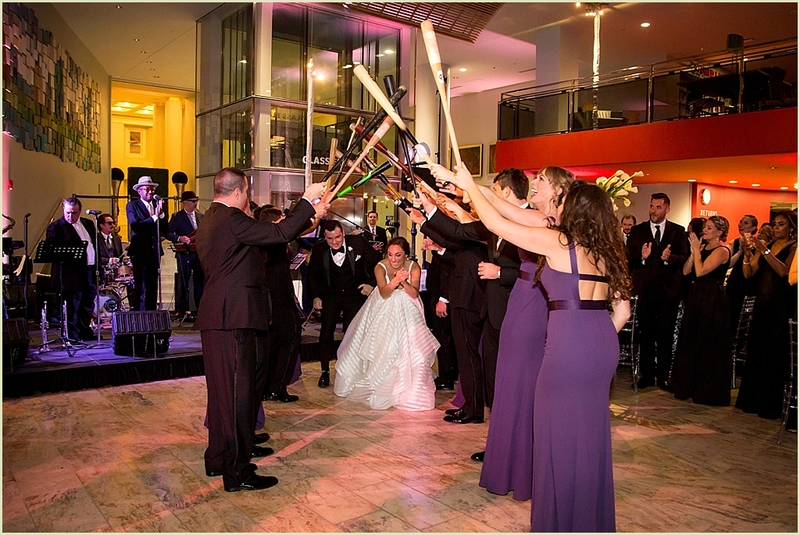 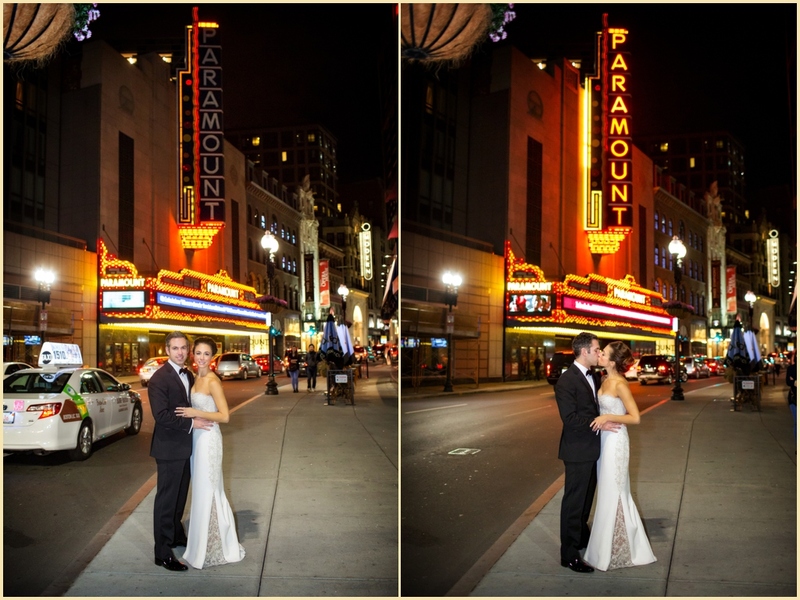 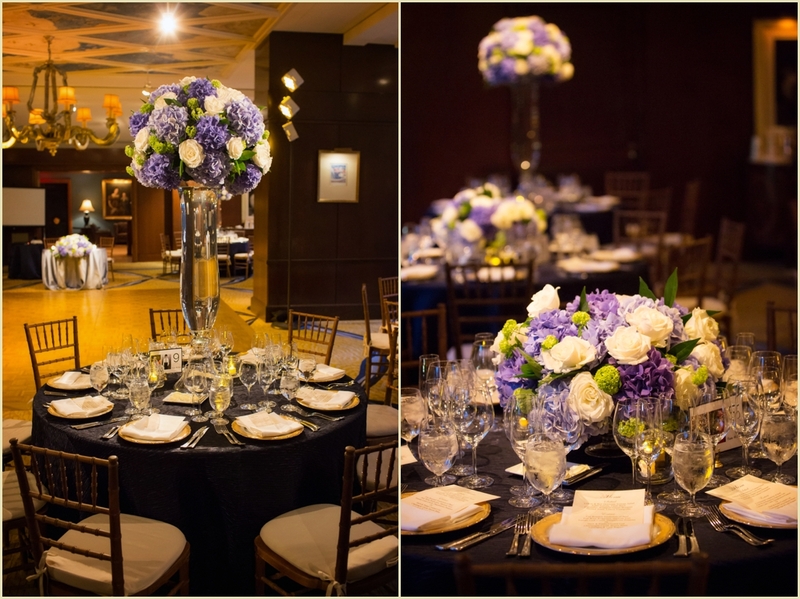 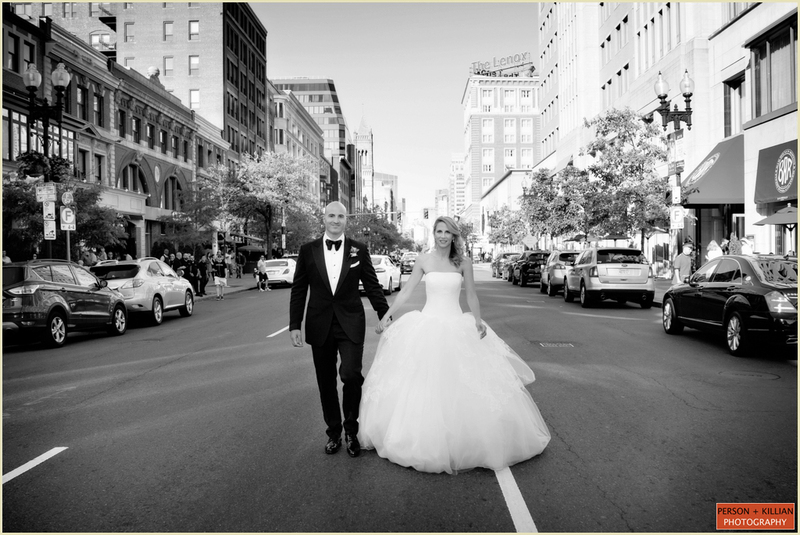 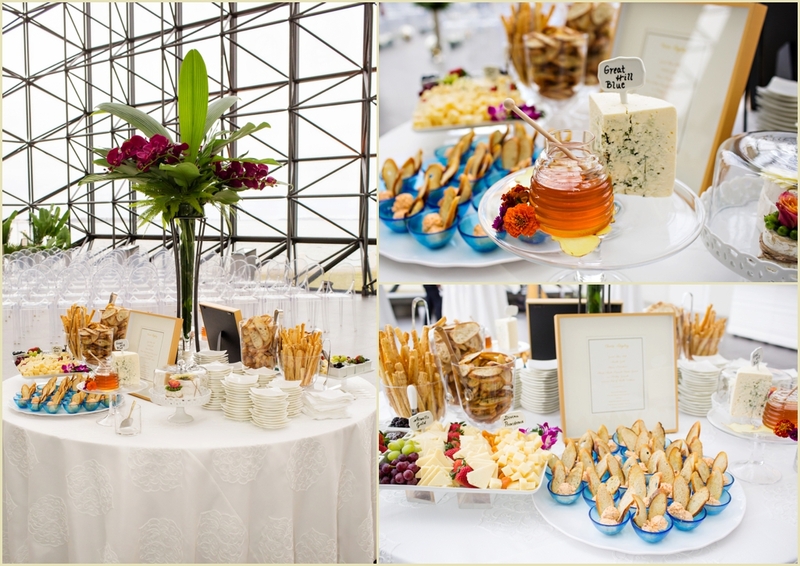 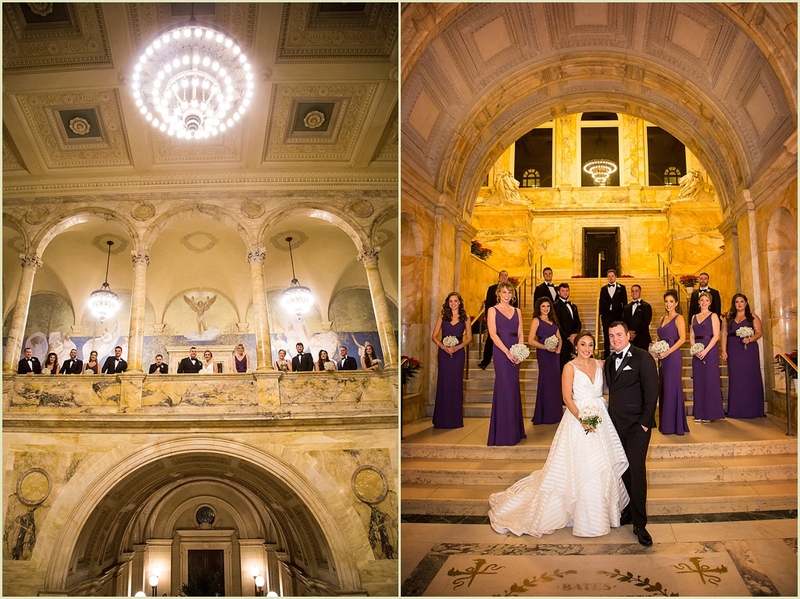 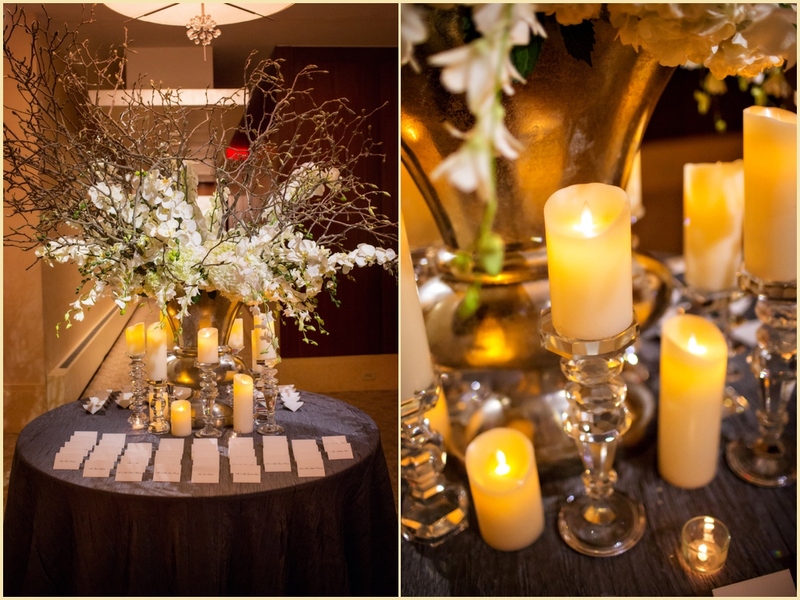 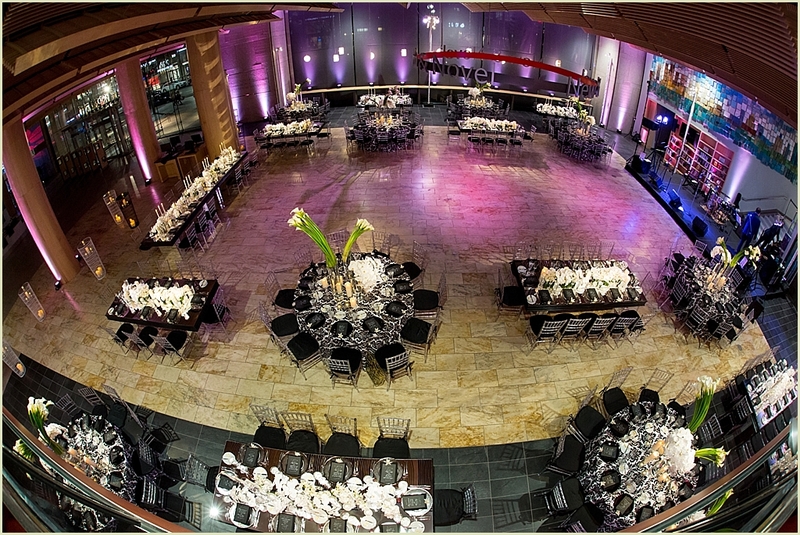 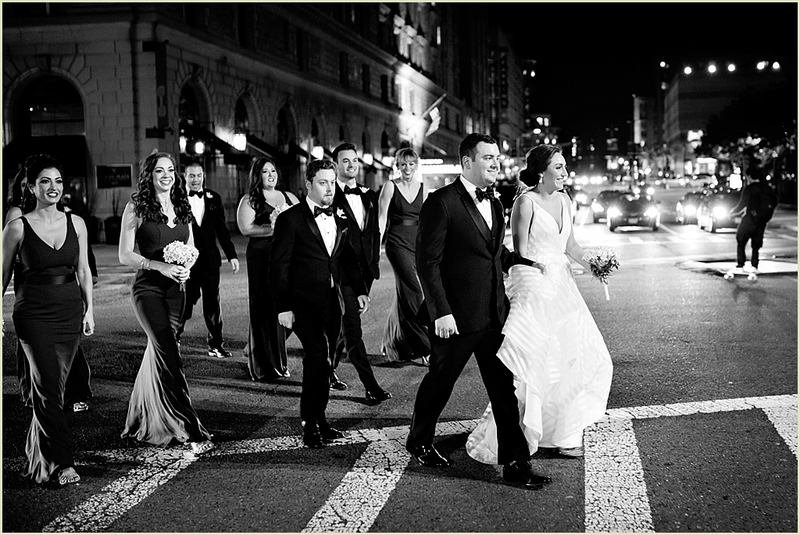 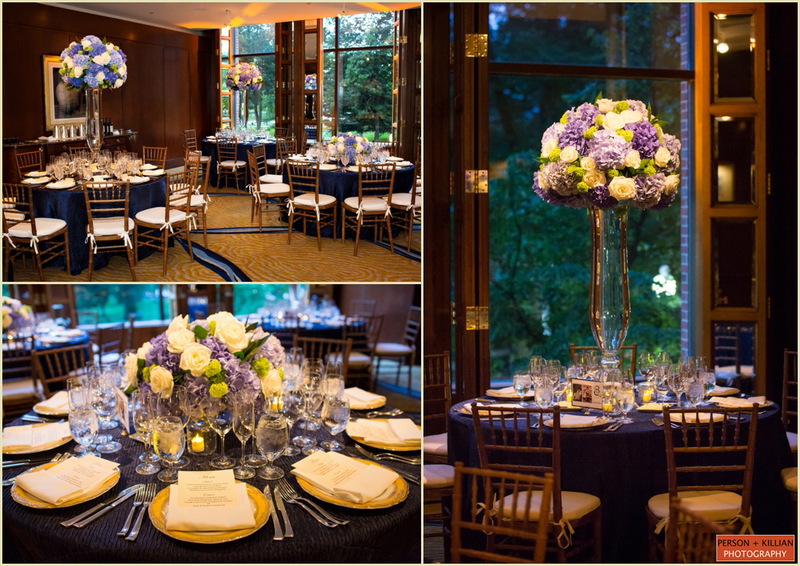 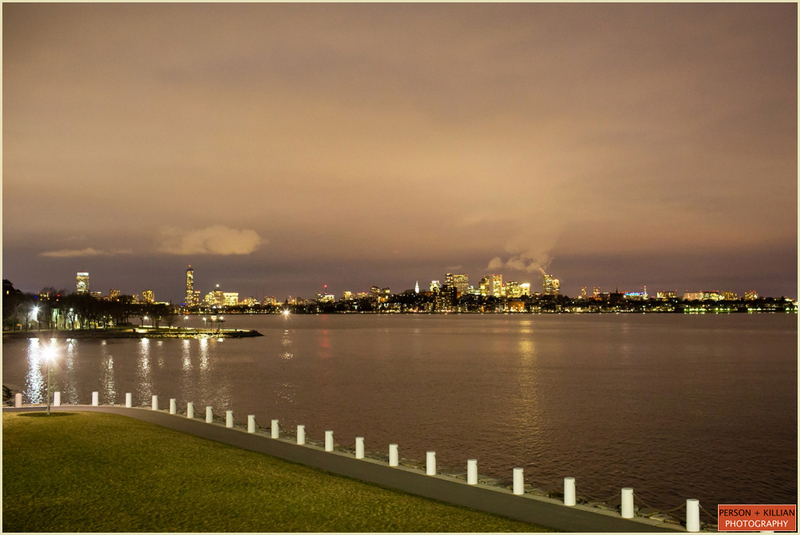 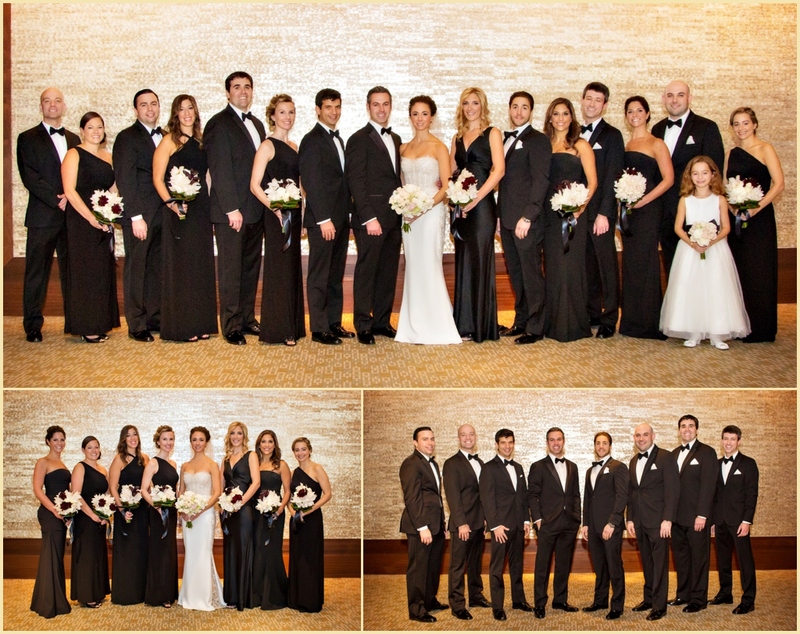 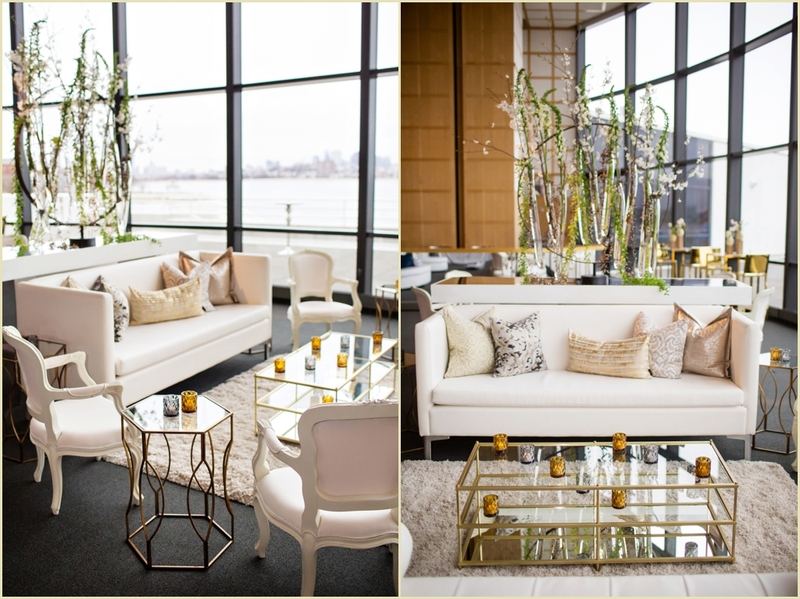 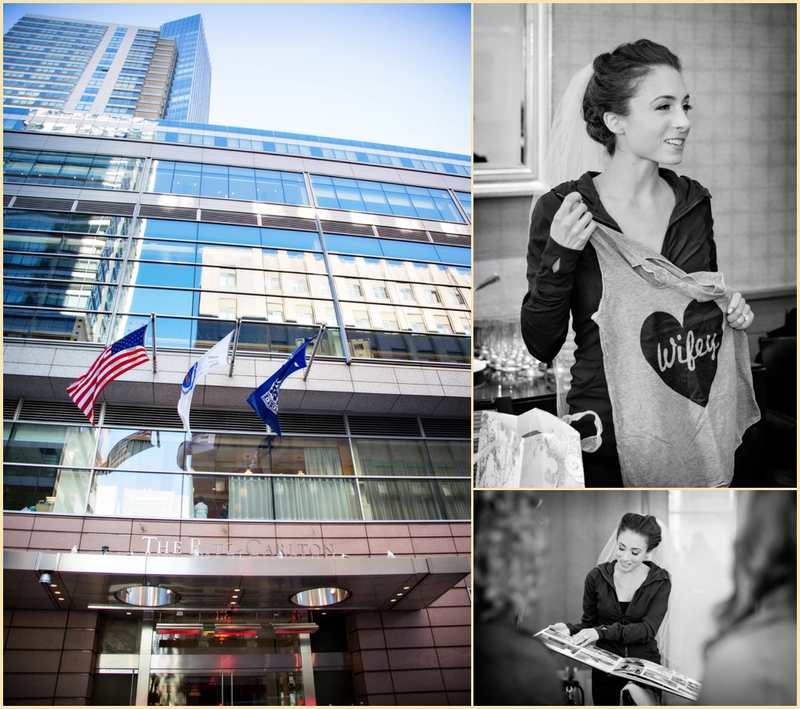 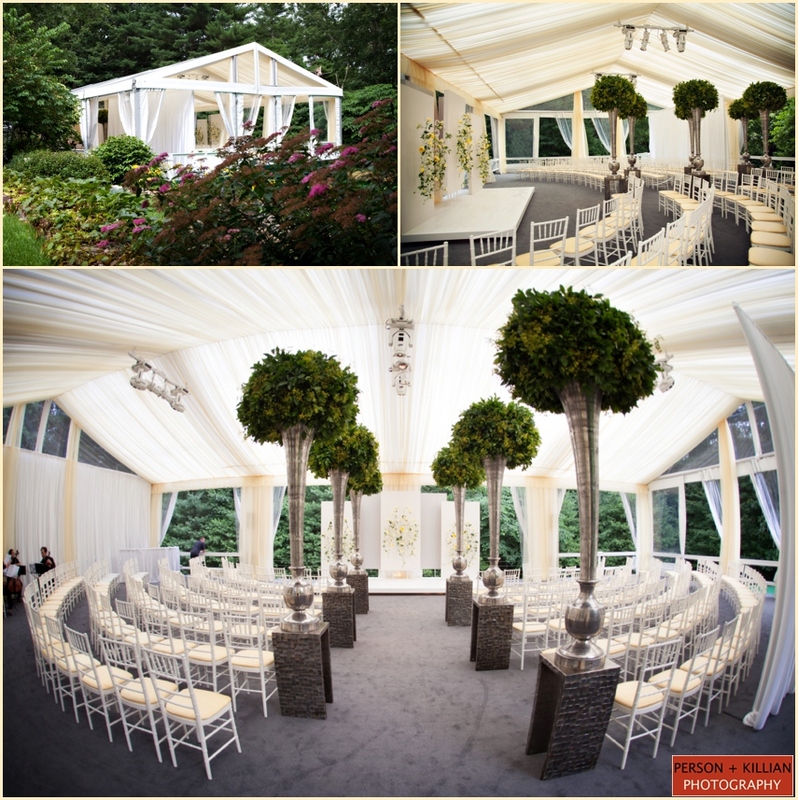 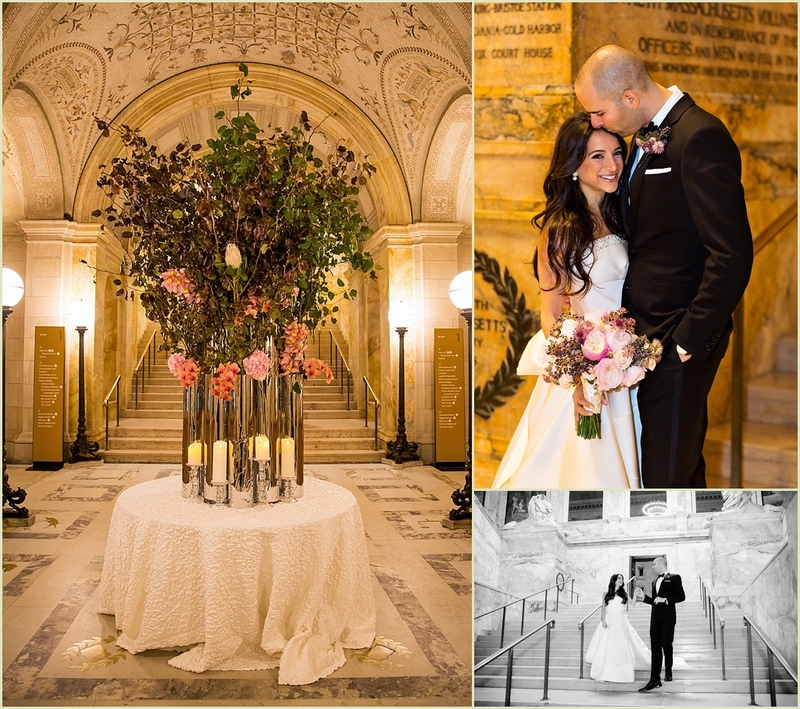 Ashley and Brian chose the Mandarin Oriental Boston for their recent destination wedding. 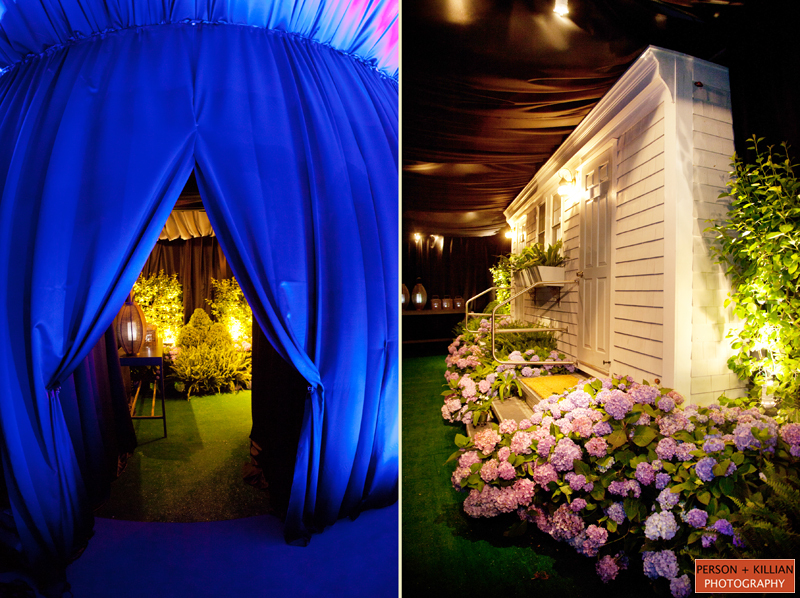 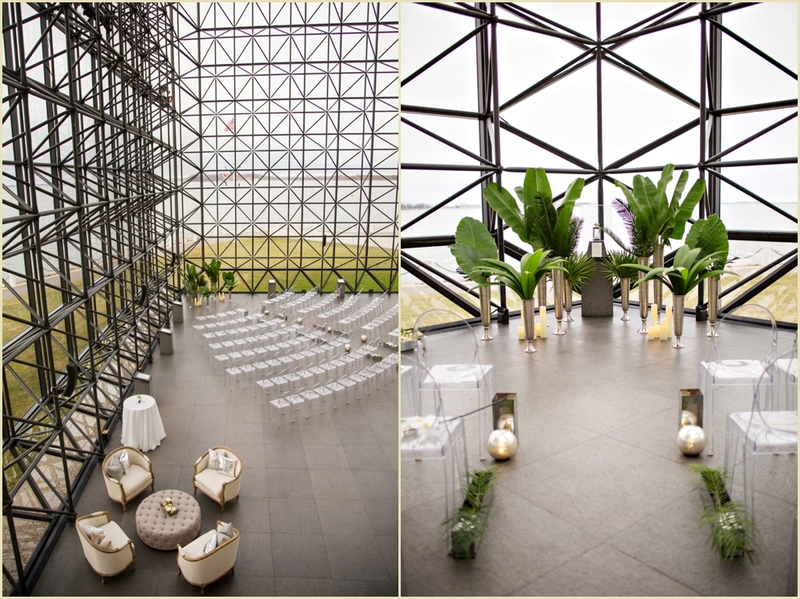 The couple who live in Nevada hired local Boston designer Eric Czerlonka of Czerlonka Event Design and Management to help bring their vision to life. 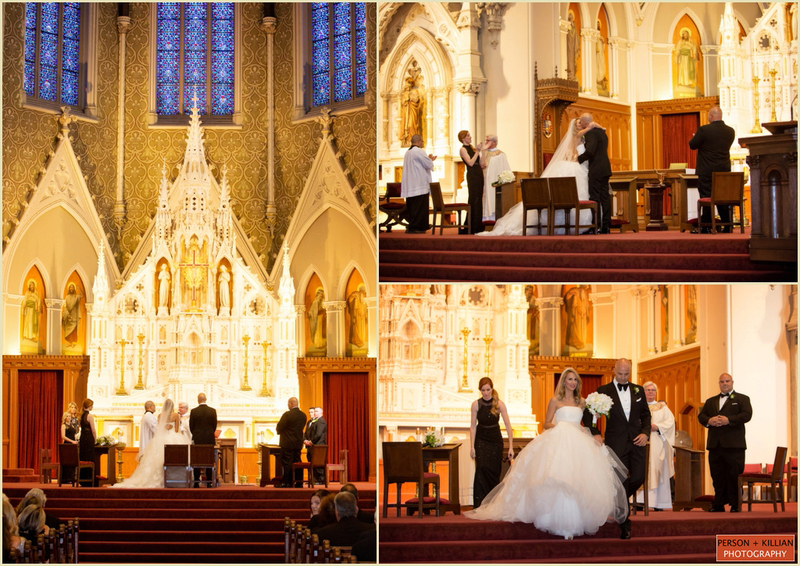 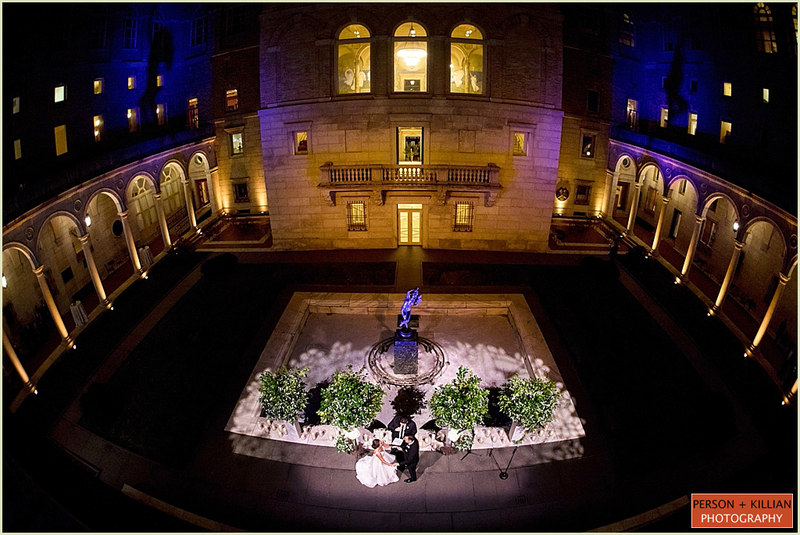 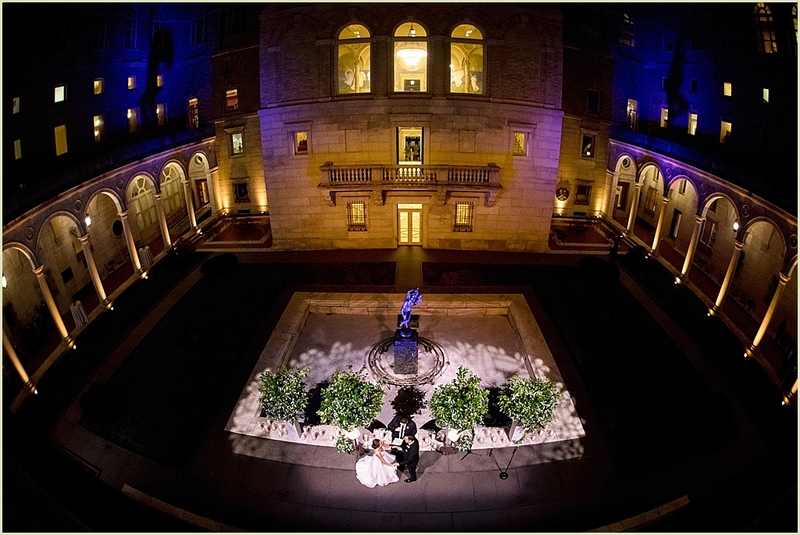 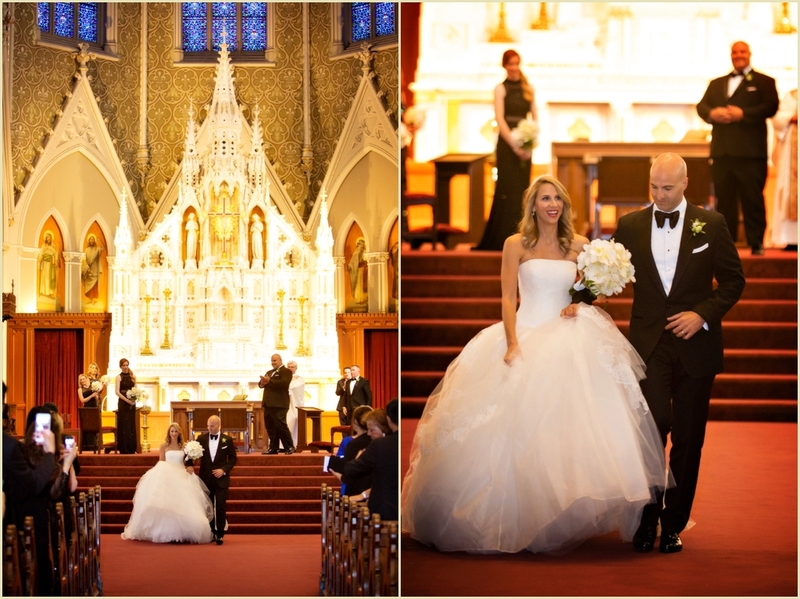 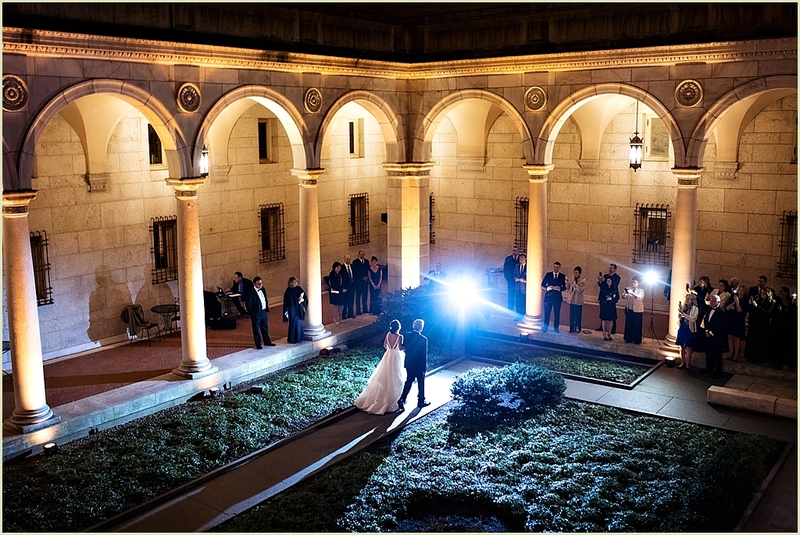 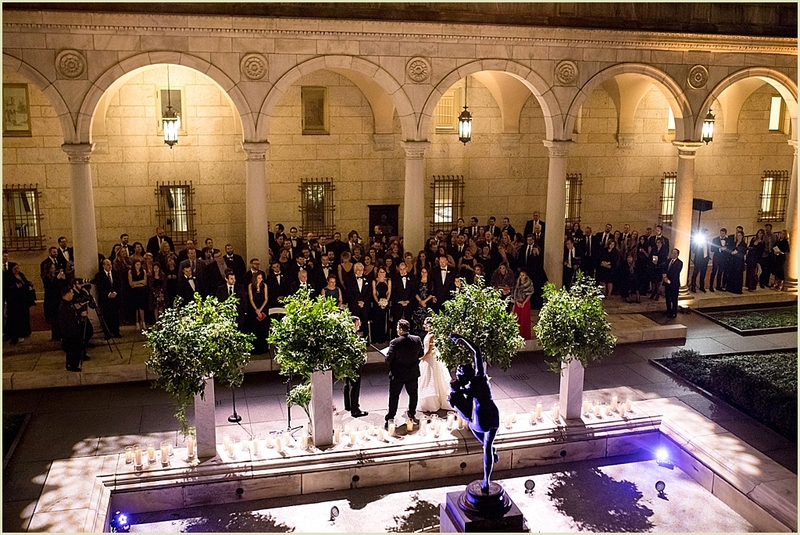 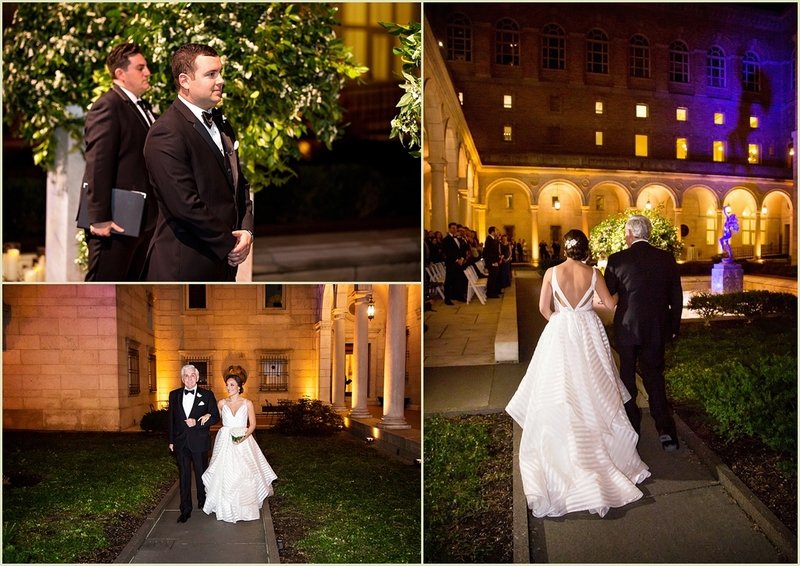 The ceremony took place at The Cathedral of the Holy Cross followed by cocktail hour in the courtyard of the Mandarin. 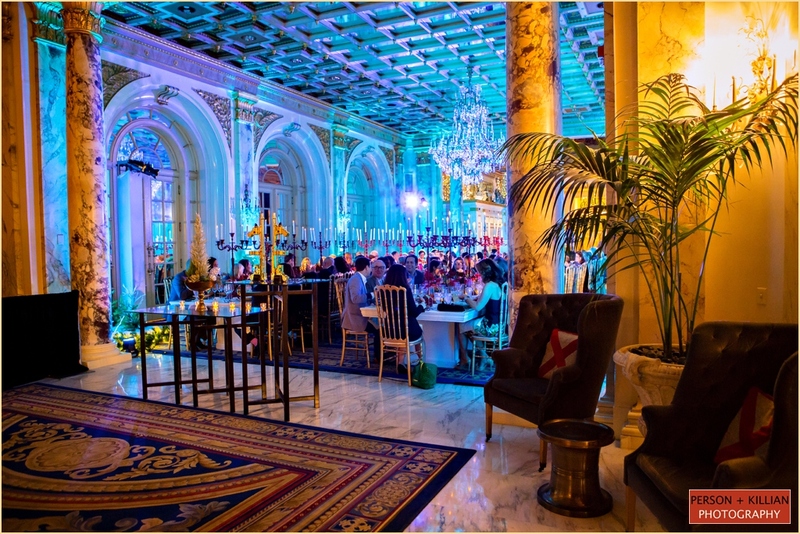 For the reception, the Oriental Ballroom was transformed by the talented team at the Mandarin, Eric and his team as well as the Marc Hall Design and Suzanne B. Lowell Lighting Design teams. 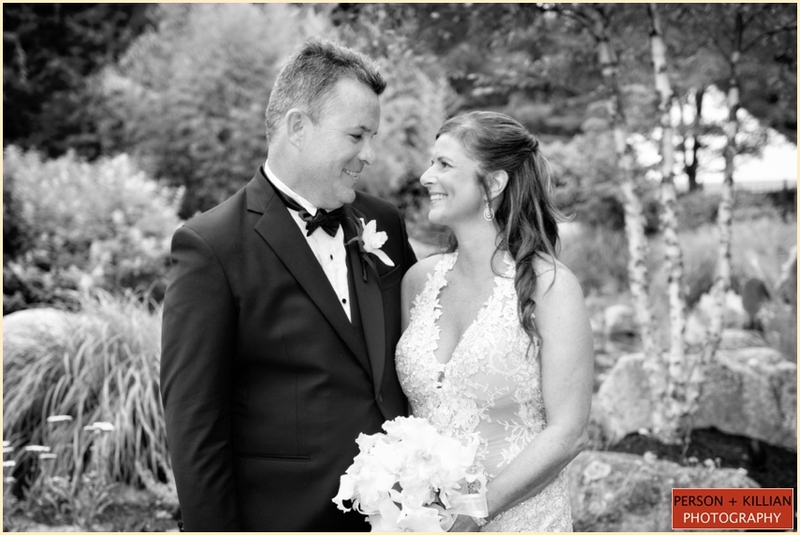 Congratulations again Ashley and Brian and thank you for having us there to capture your beautiful destination wedding day here in New England! 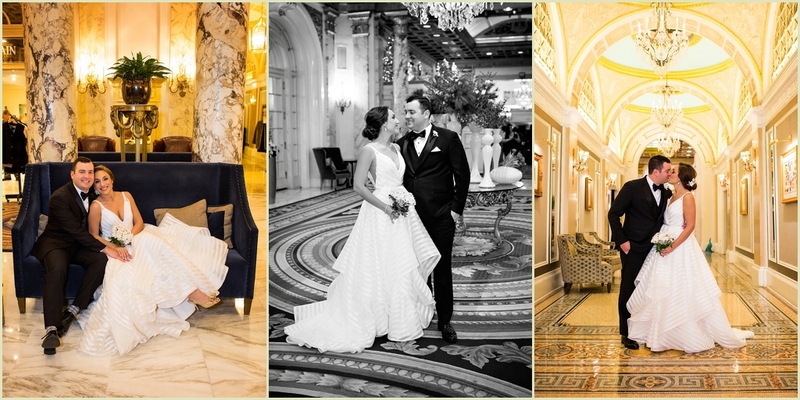 A big thank you as well do Donna and the team at the Mandarin, Eric and his team and to all of those who helped make this day so perfect for the newlyweds. 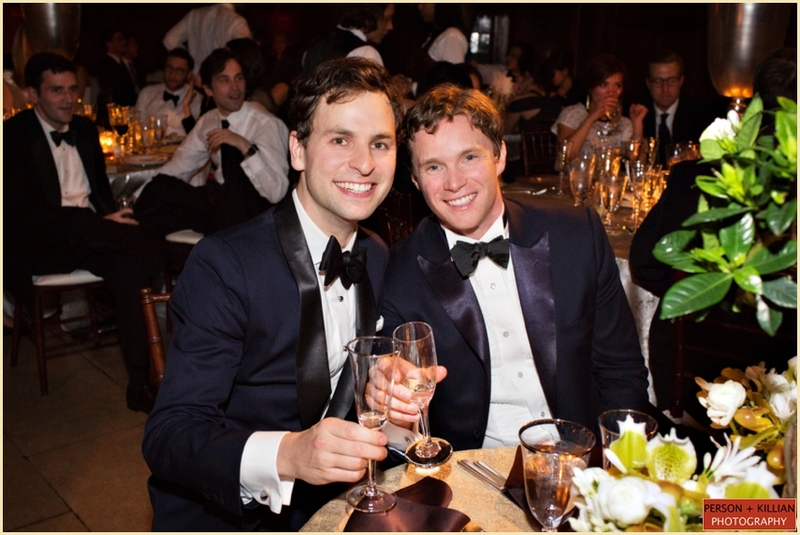 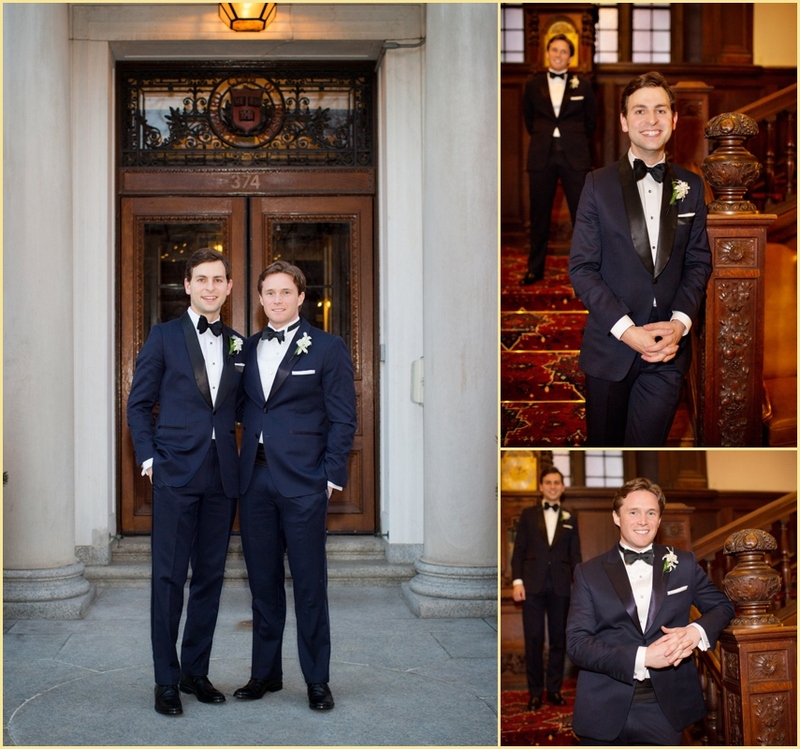 New York City couple Eliah and Jamie met while attending Harvard University. 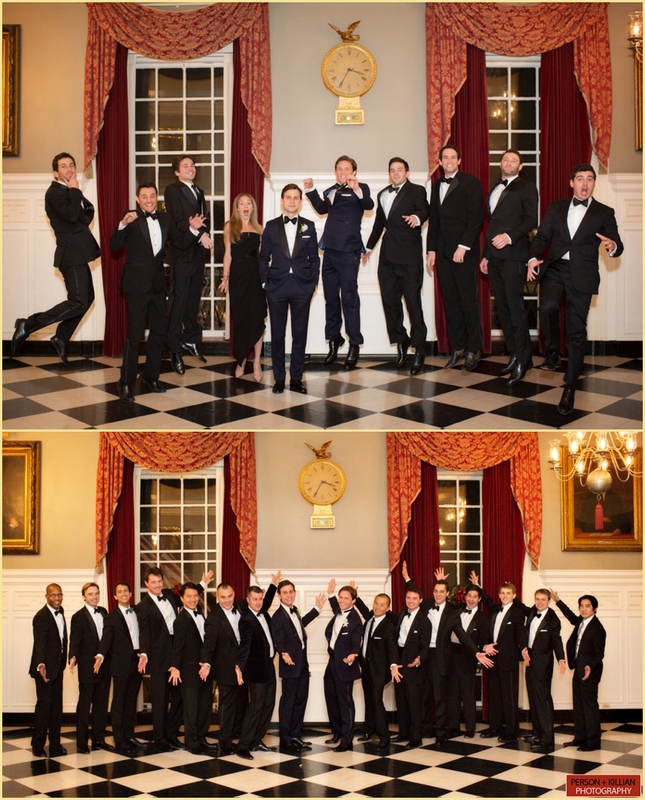 Their love for music brought them together as they traveled the world on a 2004 World Tour as members of The Harvard Krokodiloes. 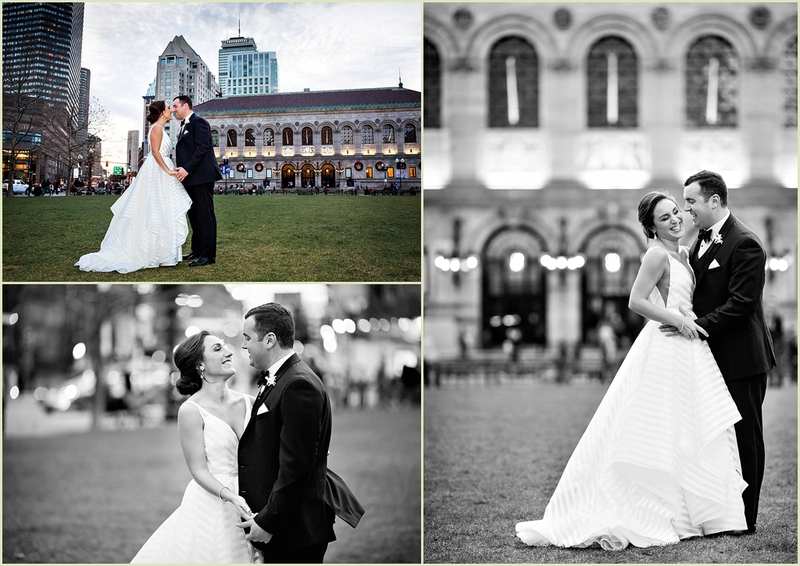 Eliah and Jamie chose to come back to Boston to celebrate their wedding weekend starting with their rehearsal dinner at Elliot Hall on the Harvard University campus. 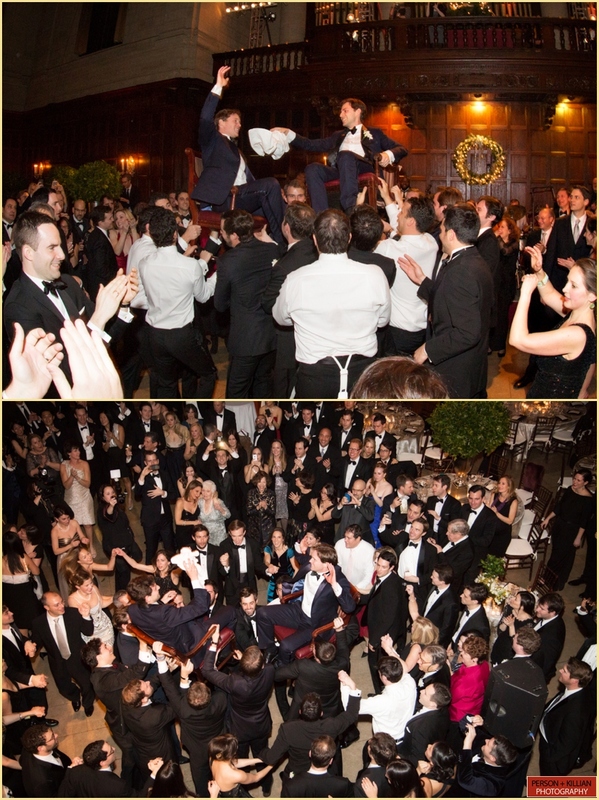 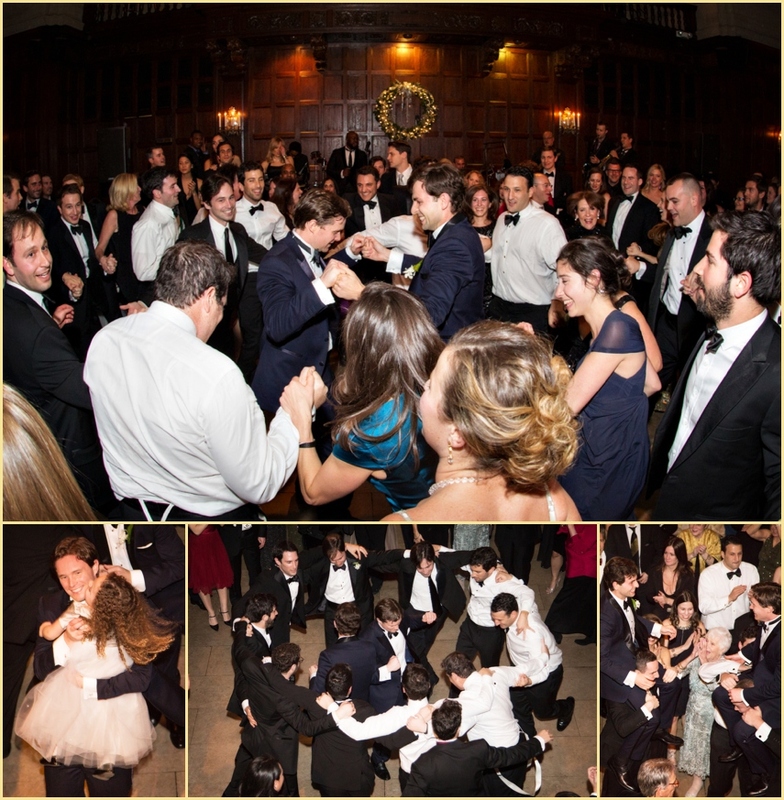 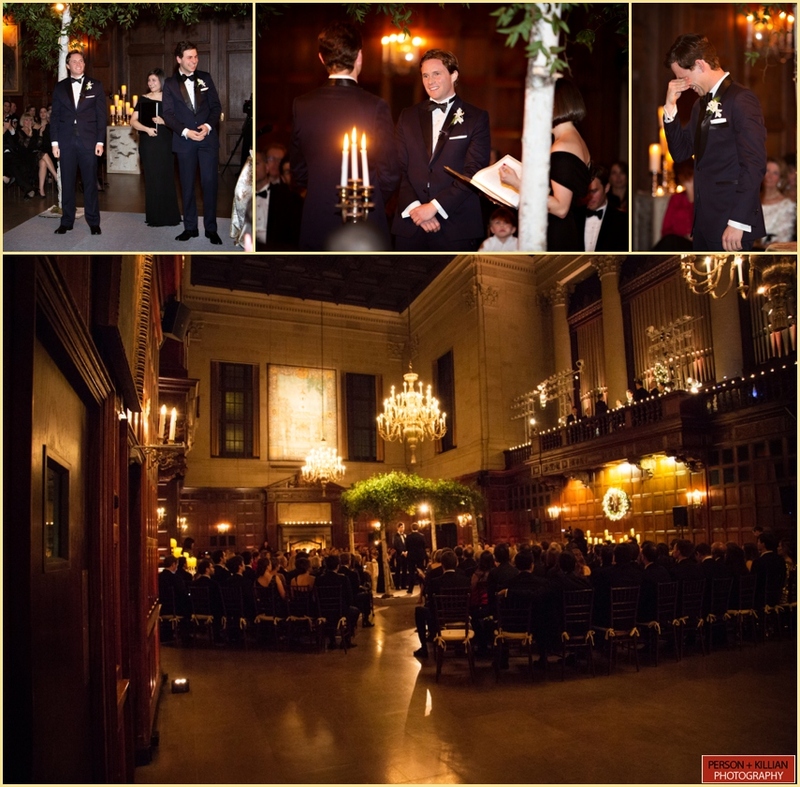 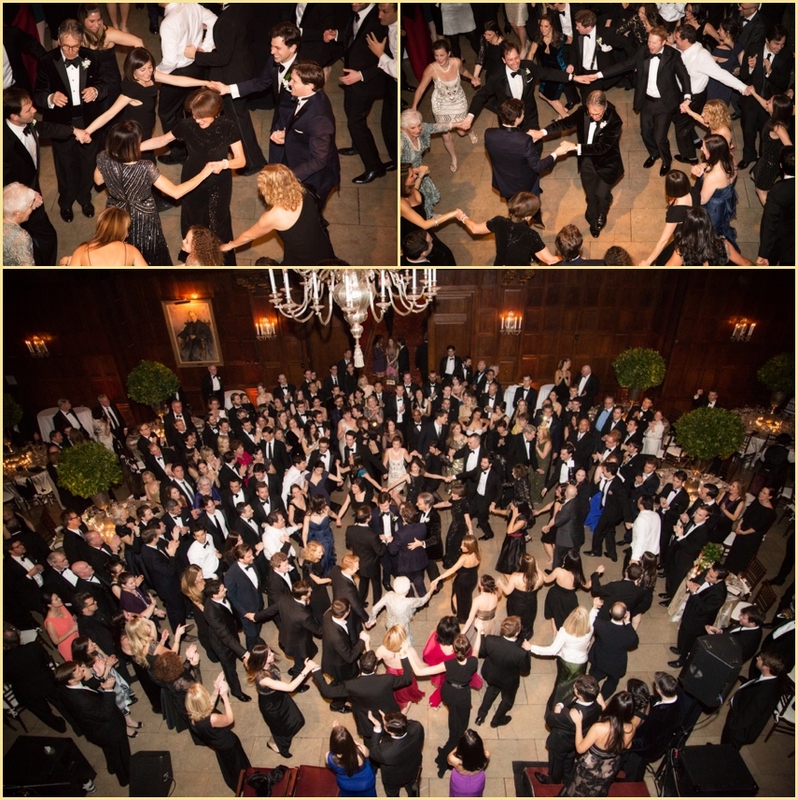 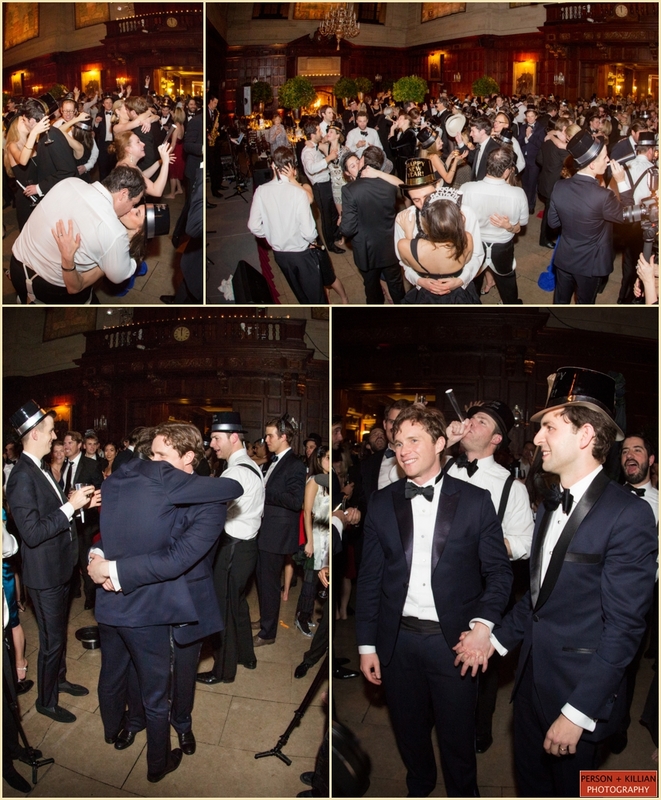 The wedding ceremony and reception were held the following night on New Years Eve at the Harvard Club of Boston on Commonwealth Ave in the Back Bay. 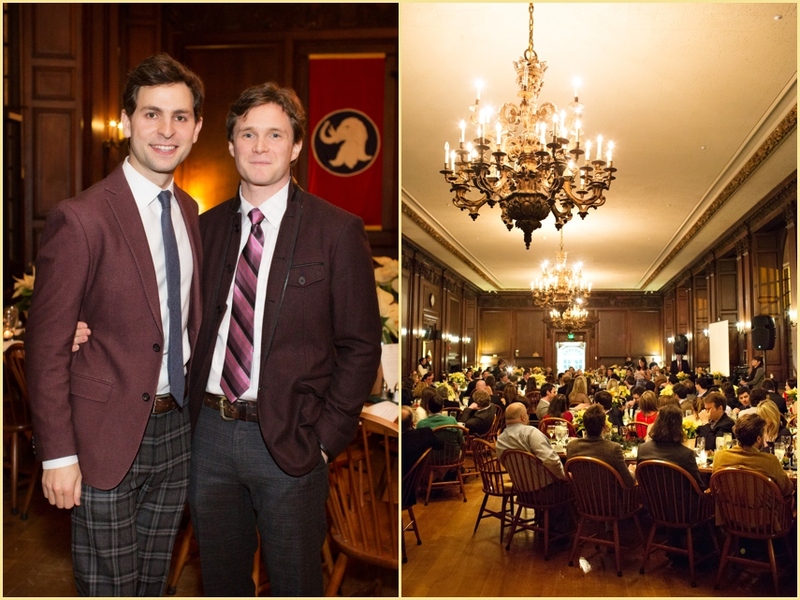 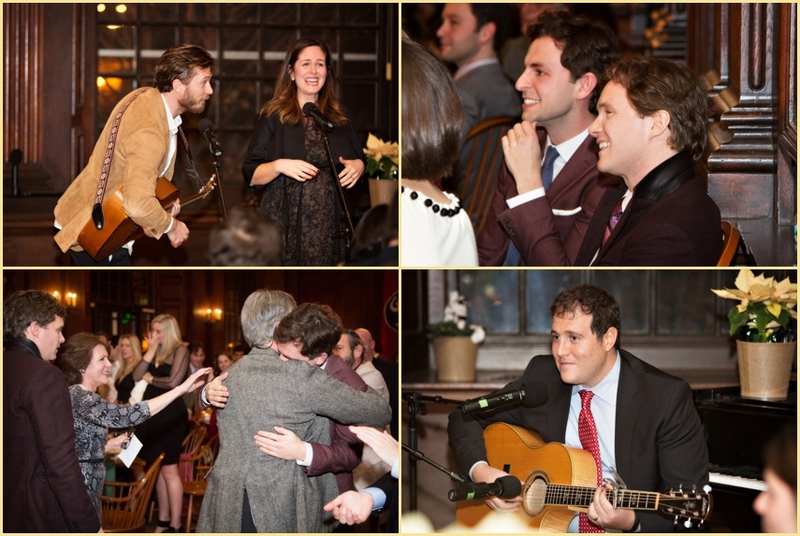 “Supper with Jamie and Eliah” at Elliot Hall was just the beginning of two days of celebration filled with music. 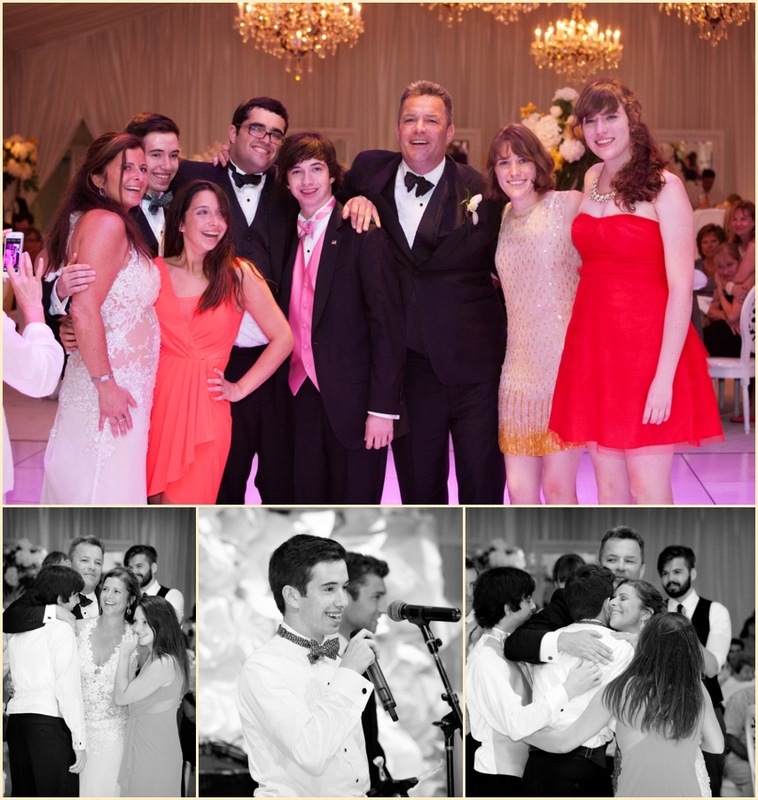 Of the nearly 250 friends and family, almost everyone had a part. 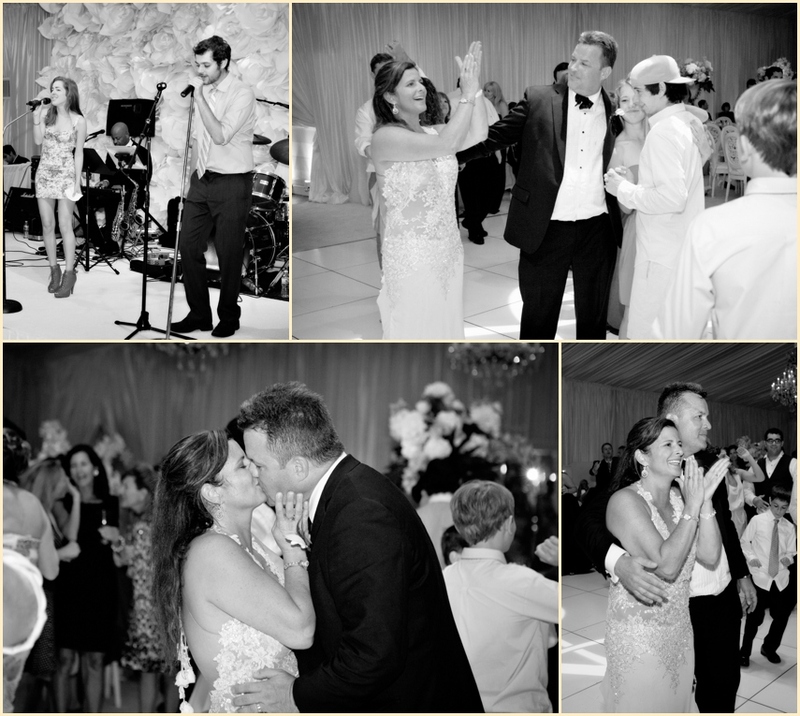 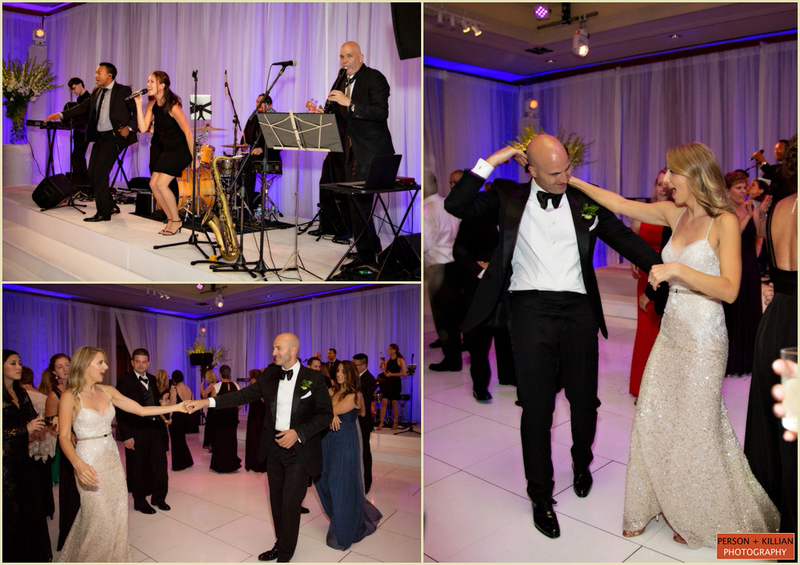 Guests preformed original songs for the couple, Broadway hits, guitar and piano solos, duets and toasts throughout the evening. 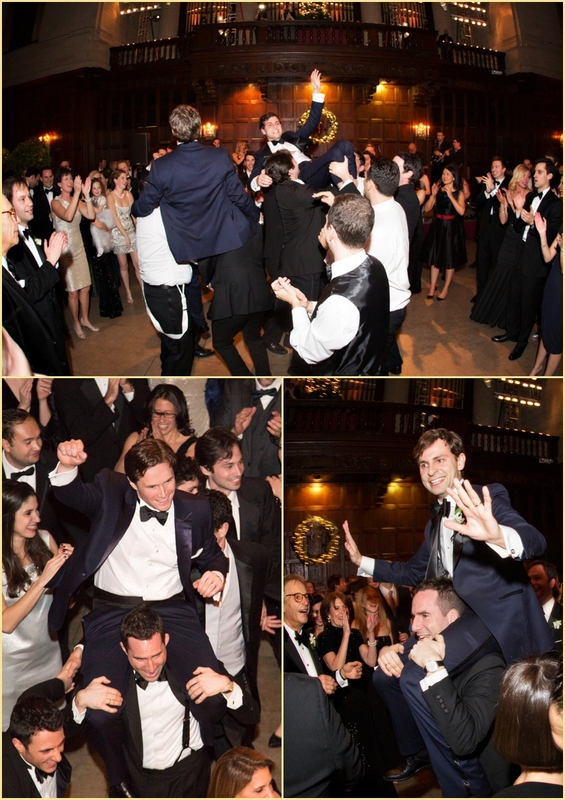 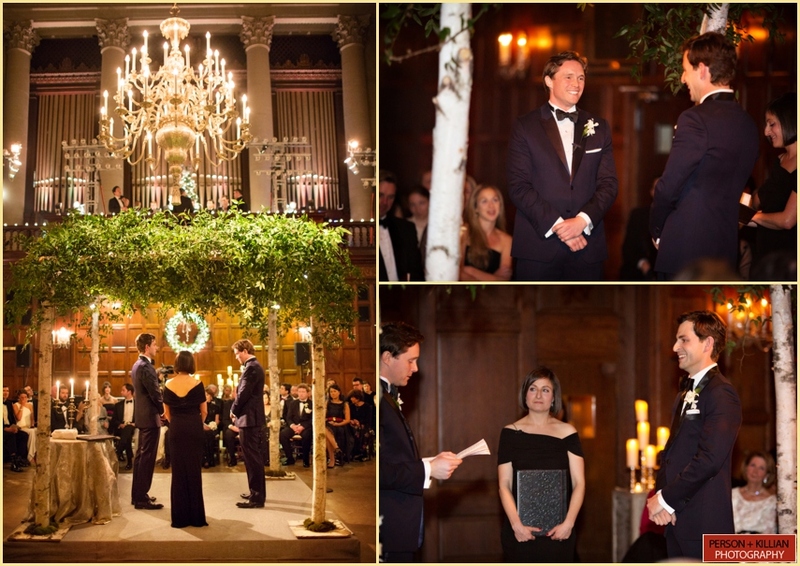 The rehearsal was truly a moving and memorable night that was just a preview of the spectacular wedding the next day. 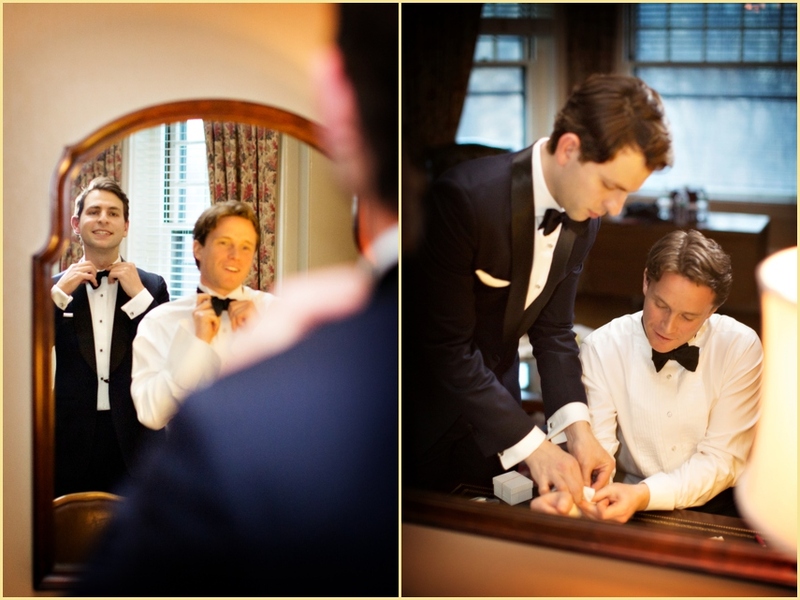 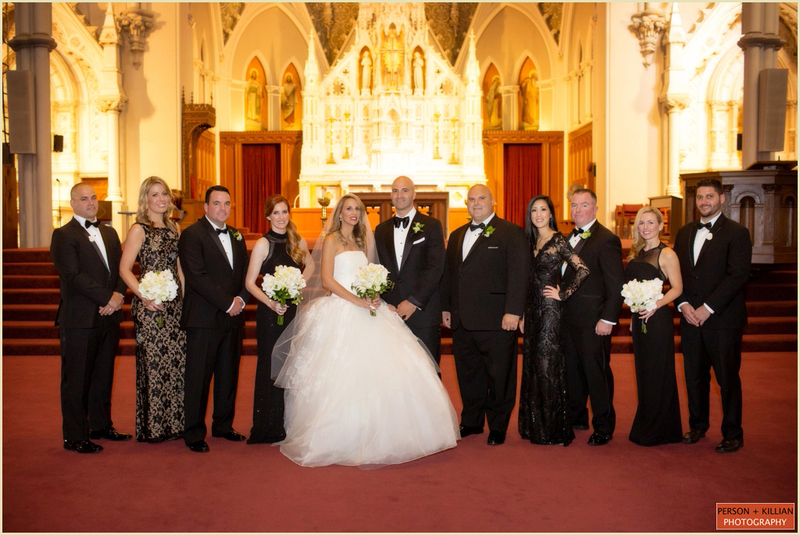 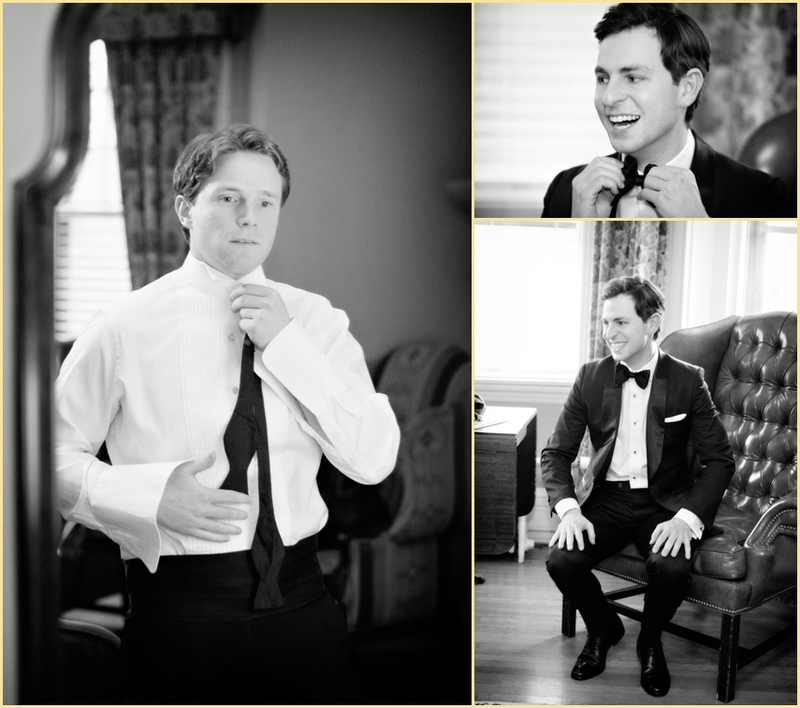 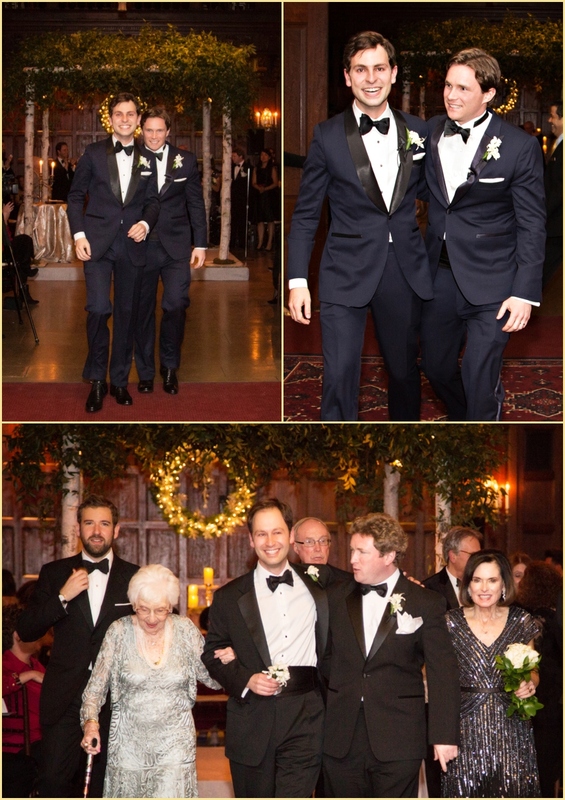 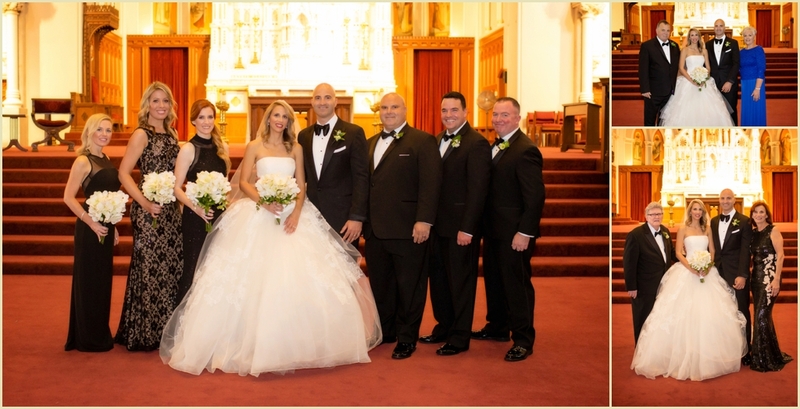 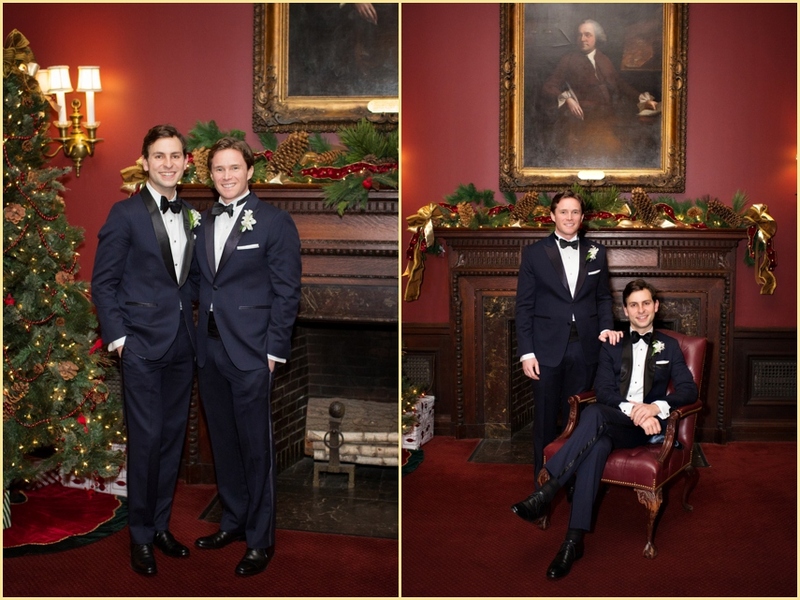 After getting ready at the Harvard Club, Eliah and Jamie met up with their family and friends for some traditional wedding party photographs in the Massachusetts Room. 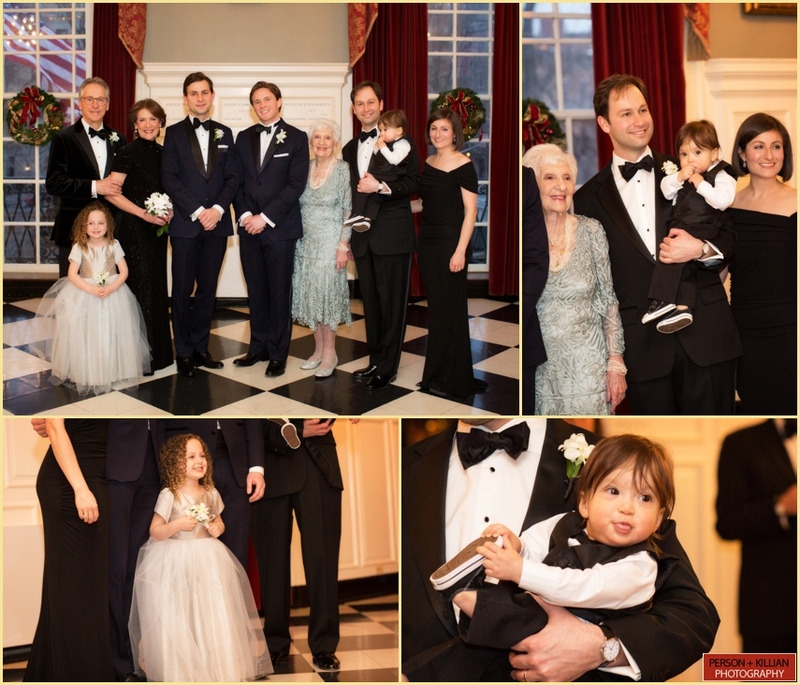 The spacious warmly lit room and black and white checkered floor made for a great location (and a favorite space at the Club for Eliah). 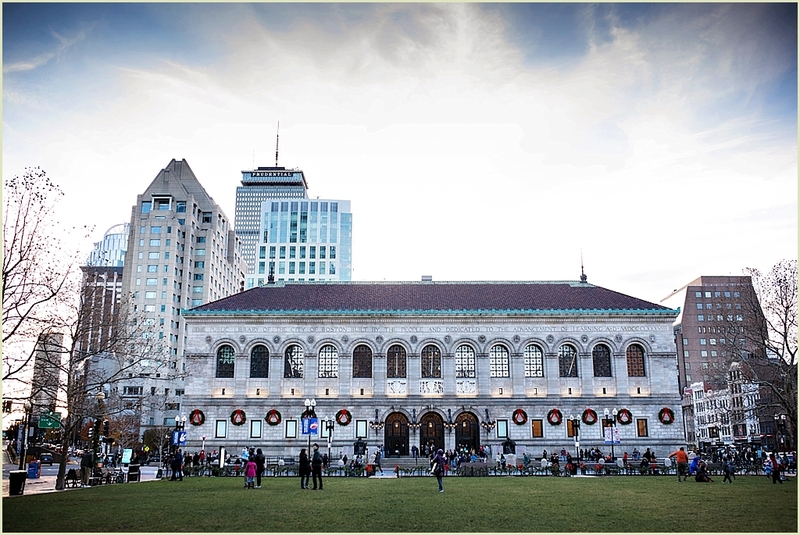 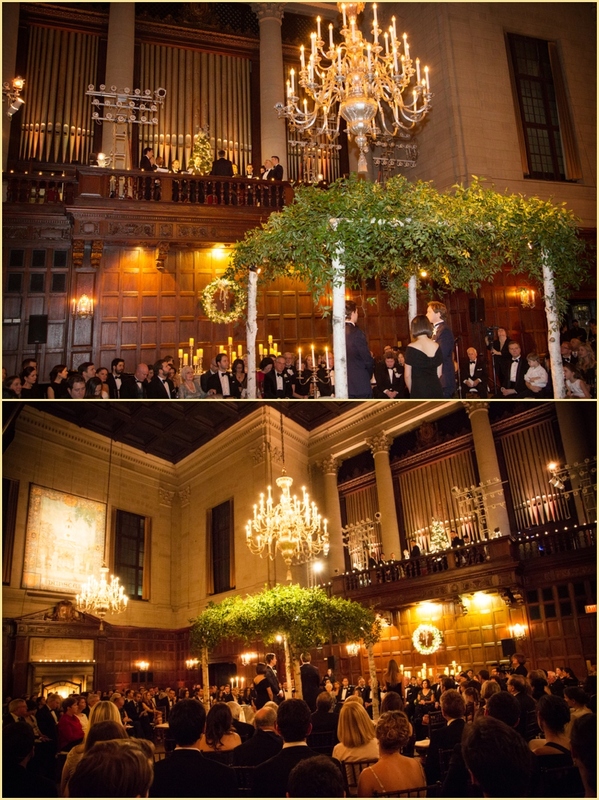 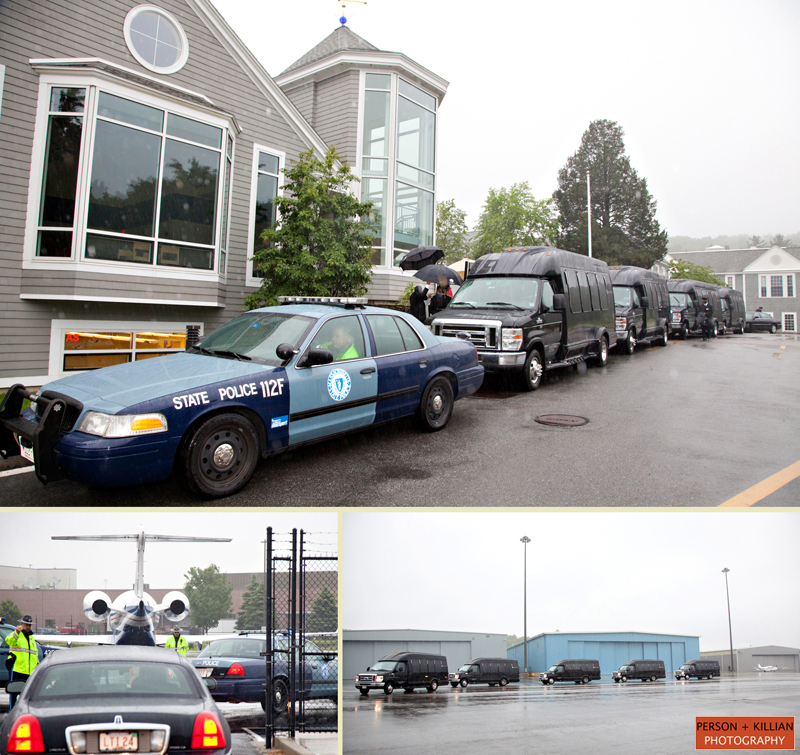 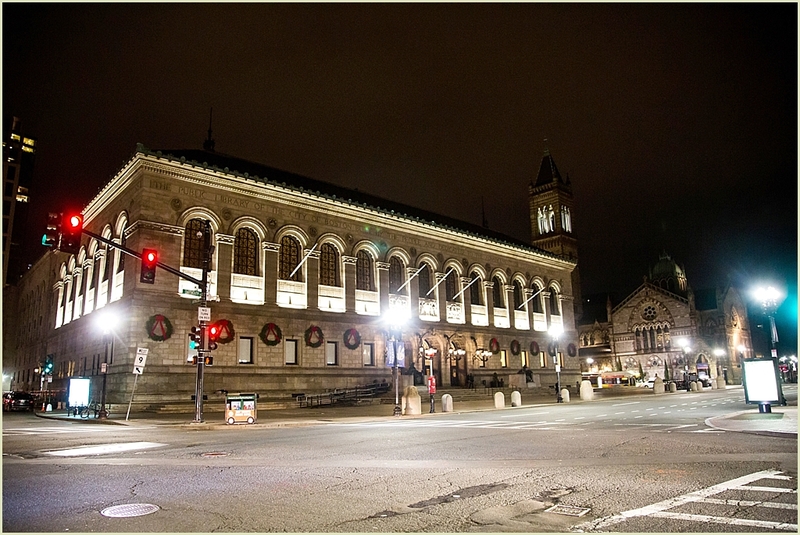 Guests arrived for the ceremony to a spectacularly decorated Harvard Hall. 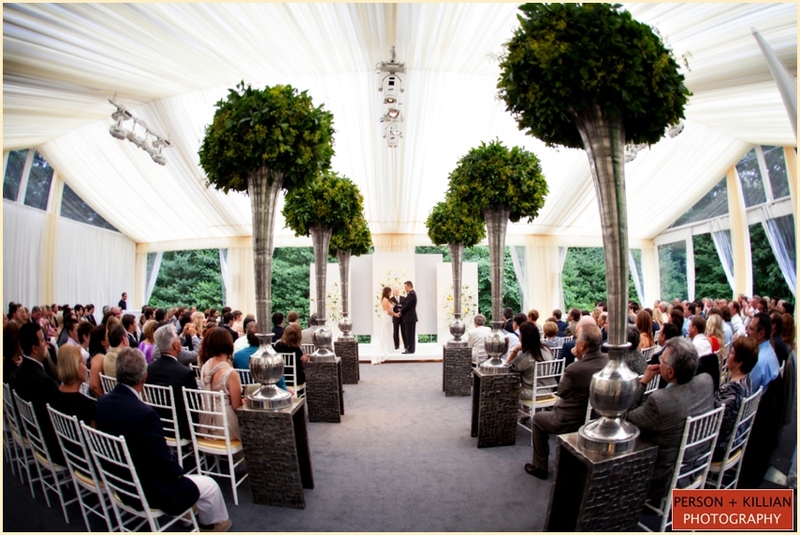 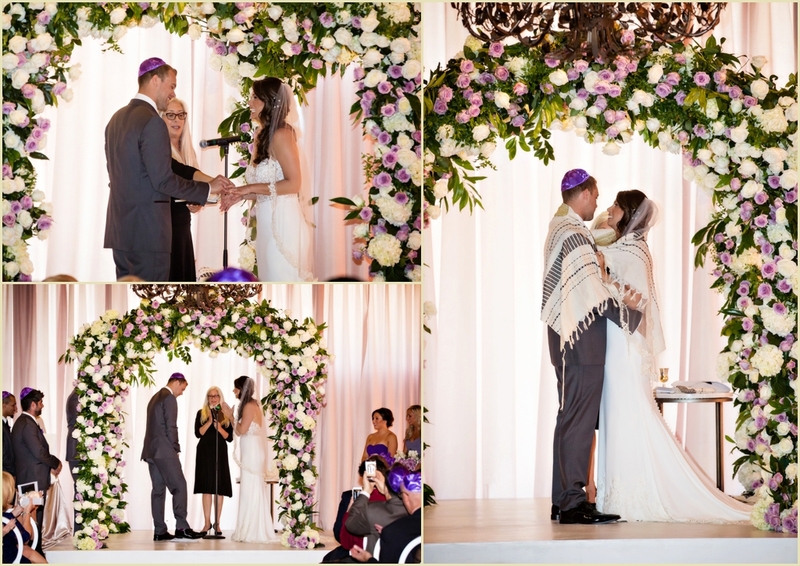 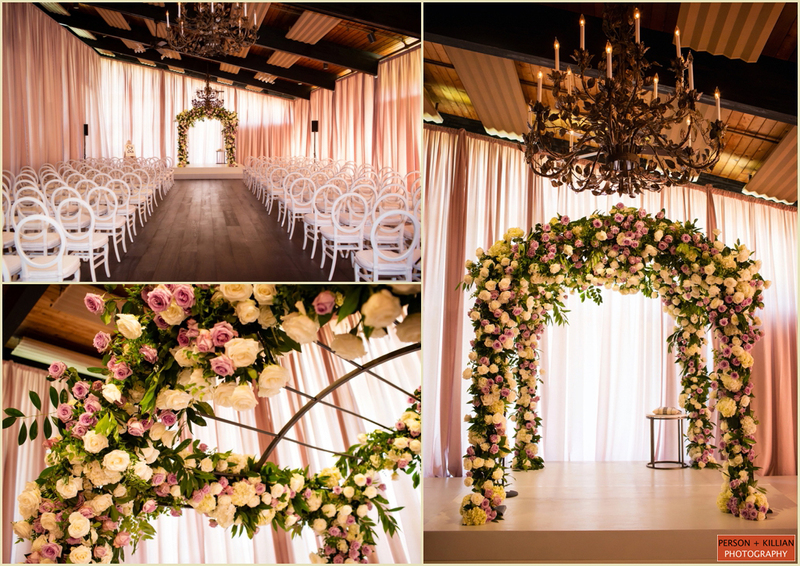 A custom birch chuppah by Marc Hall Design sat in the center of the room and was surrounded by chiavari chairs set up in the round with candle light throughout adding warmth of the space. 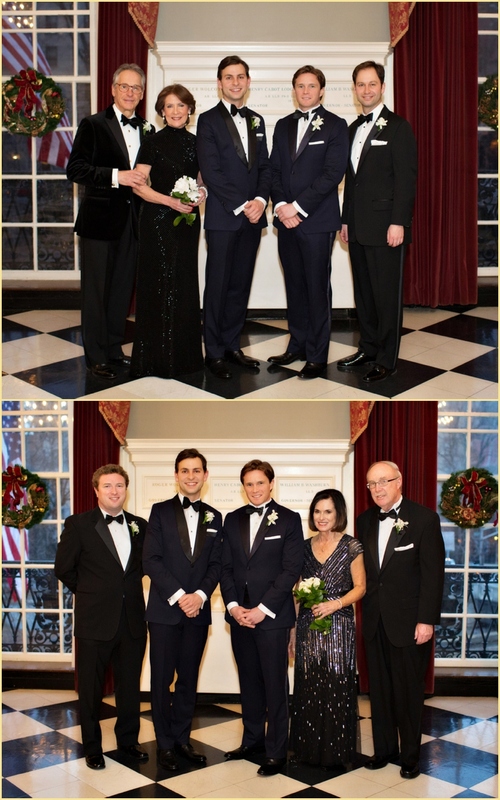 The moving ceremony was filled with music including a quartet and a cappella by the Harvad Kroks who sang from the balcony. 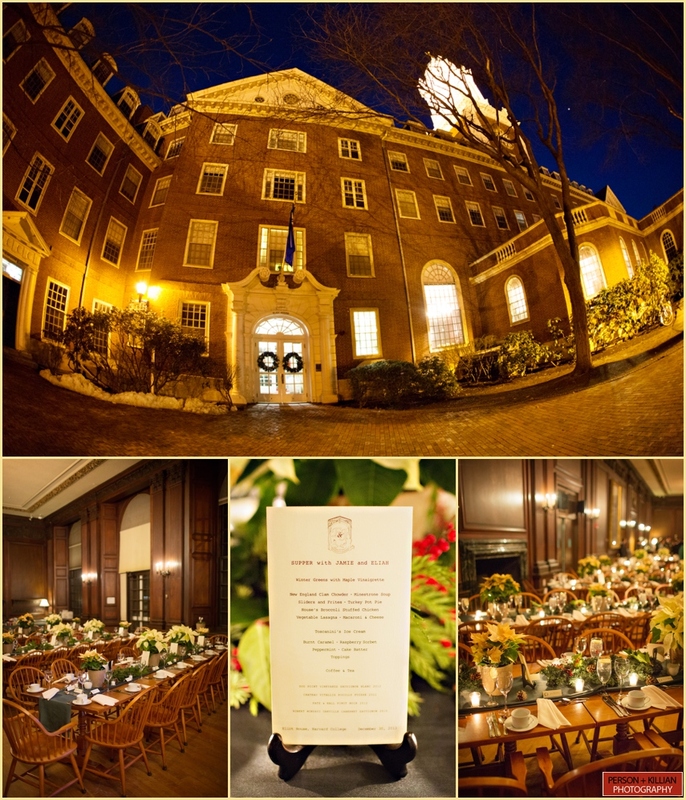 When guests arrived back in Harvard Hall after cocktails in the Massachusetts Room, it had been transformed by Marc and his team. 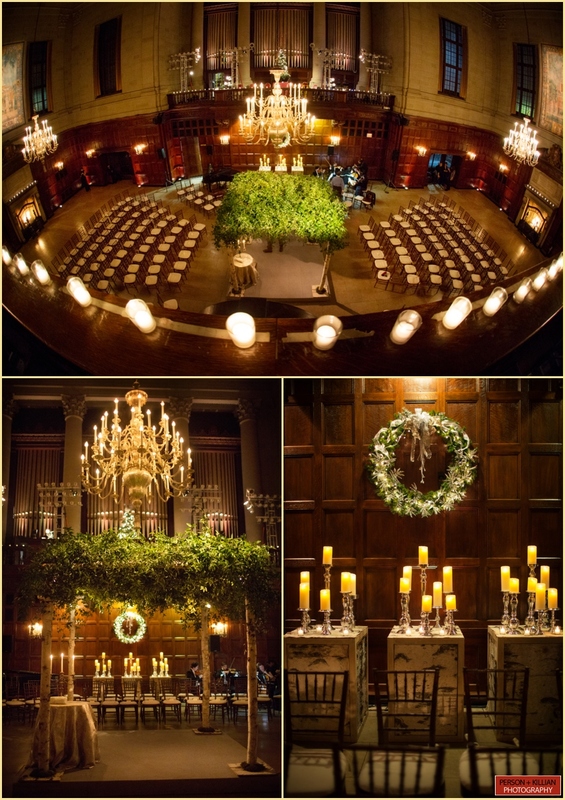 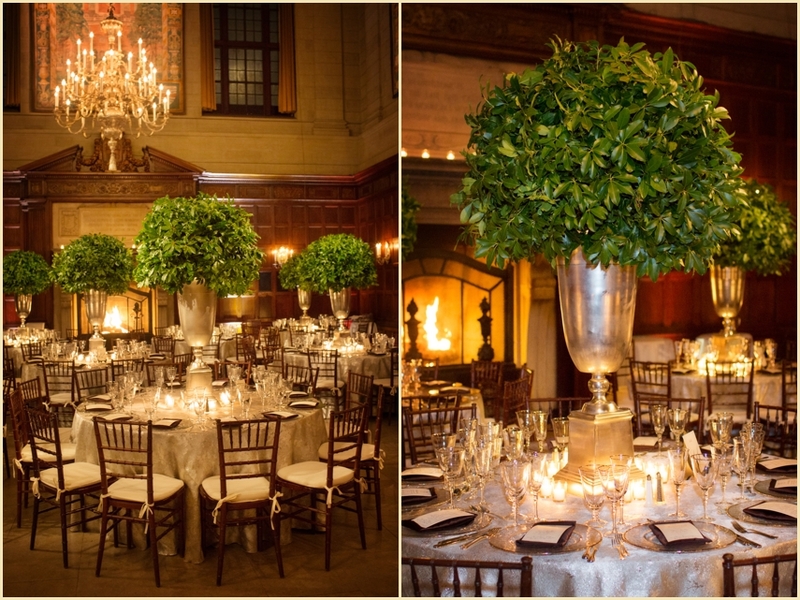 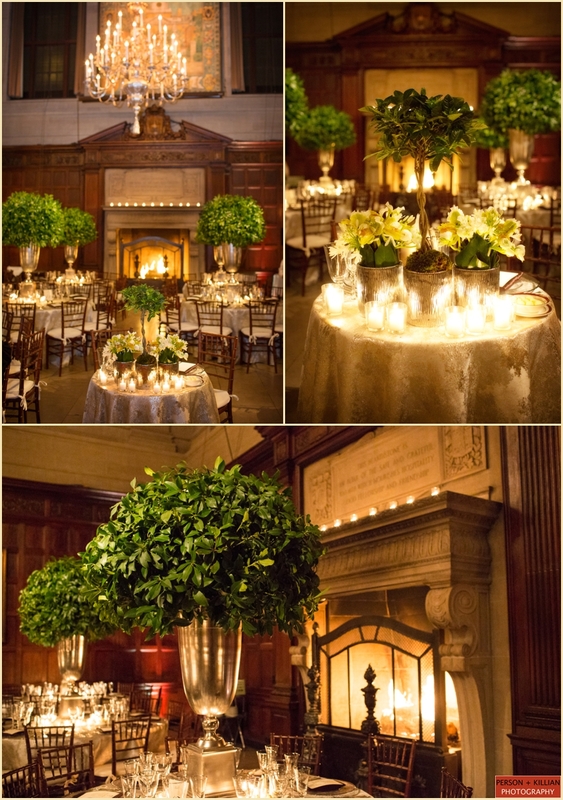 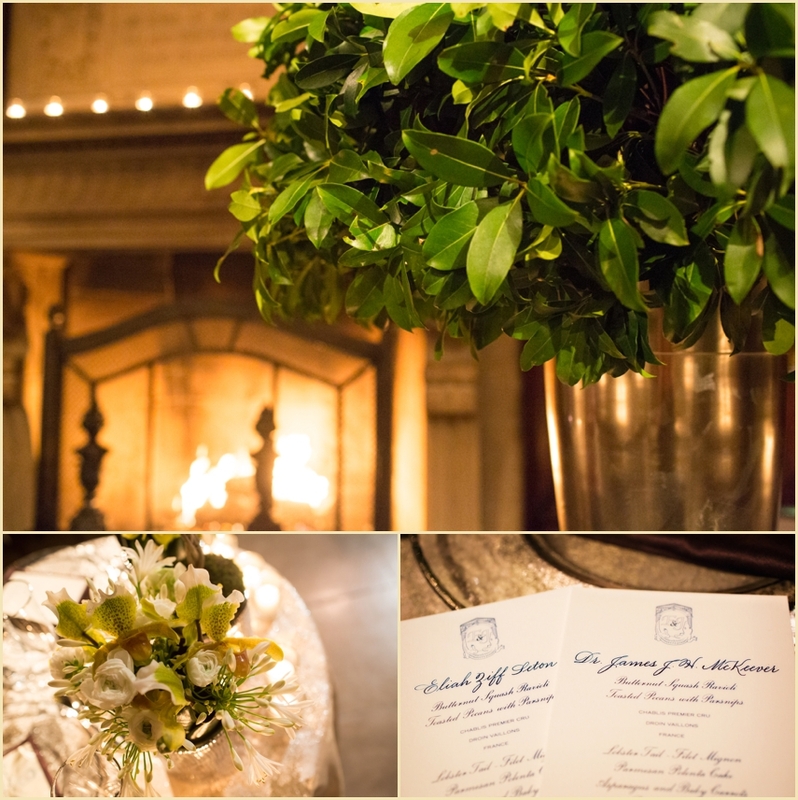 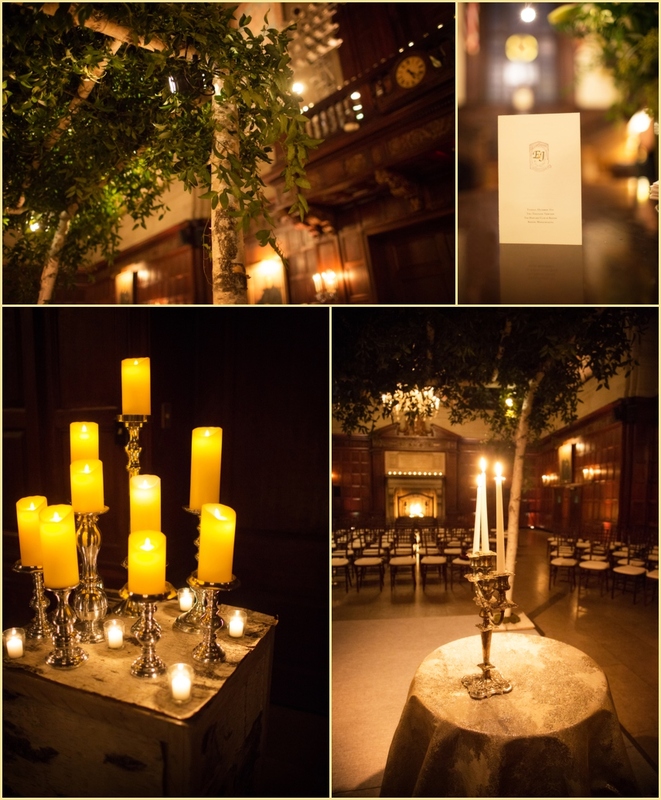 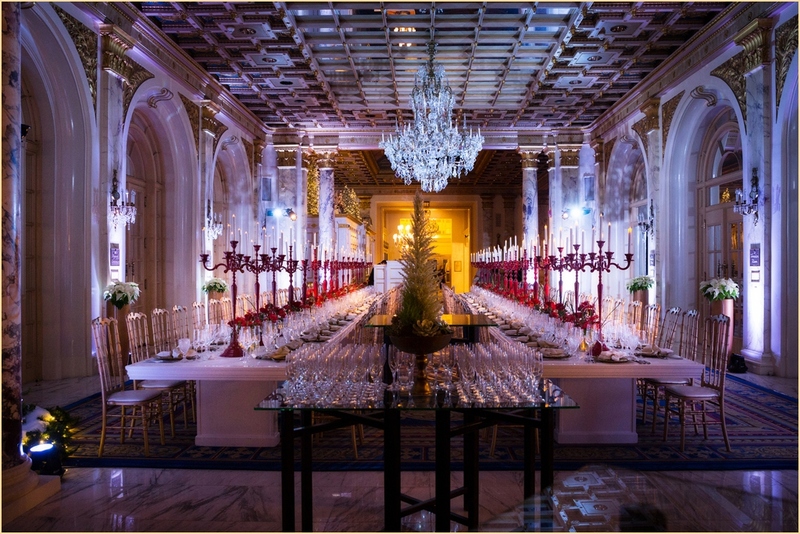 Topiaries topped each guest table and warmth was added with candle light and roaring fireplaces on each end of the hall. 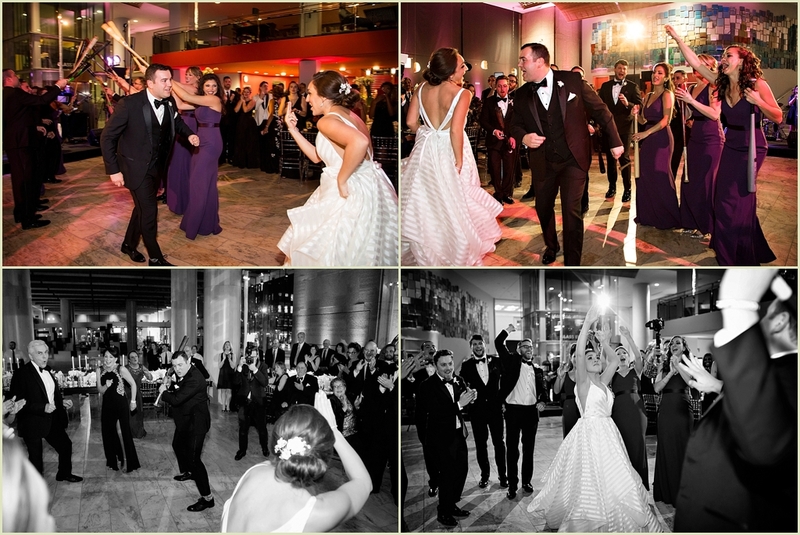 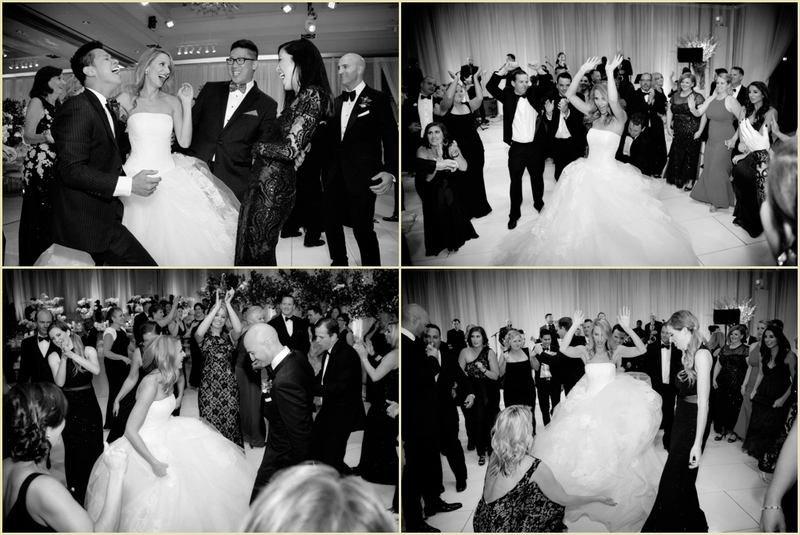 Following the newlyweds introduction, a lively hora got the room up on their feet. 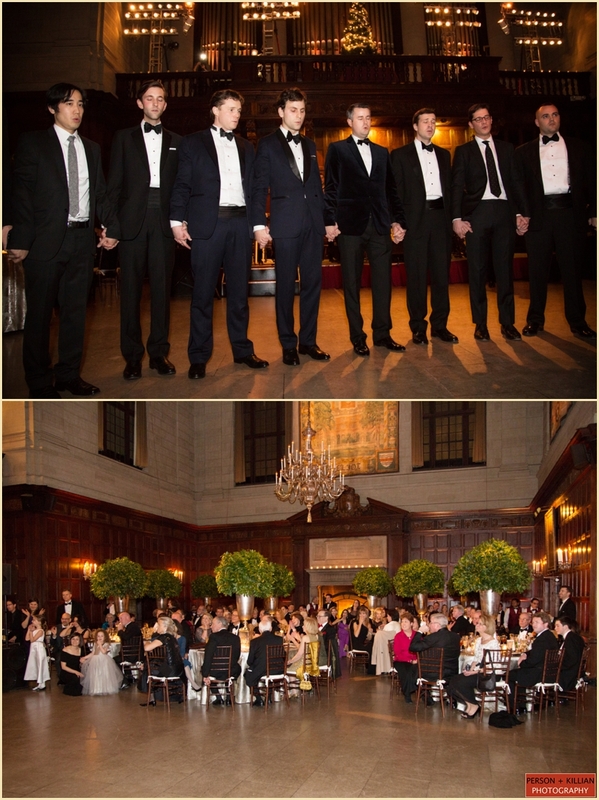 Prior to dinner a prayer song was sung by the Krocks and included both Eliah and Jamie. 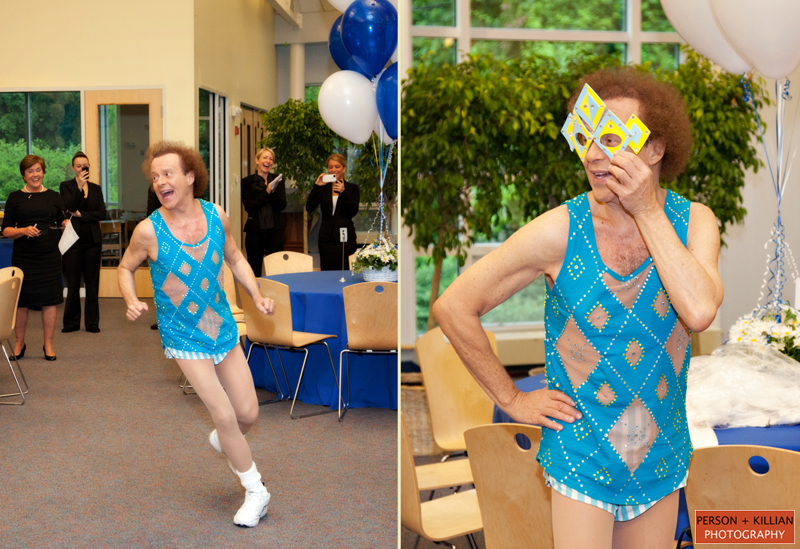 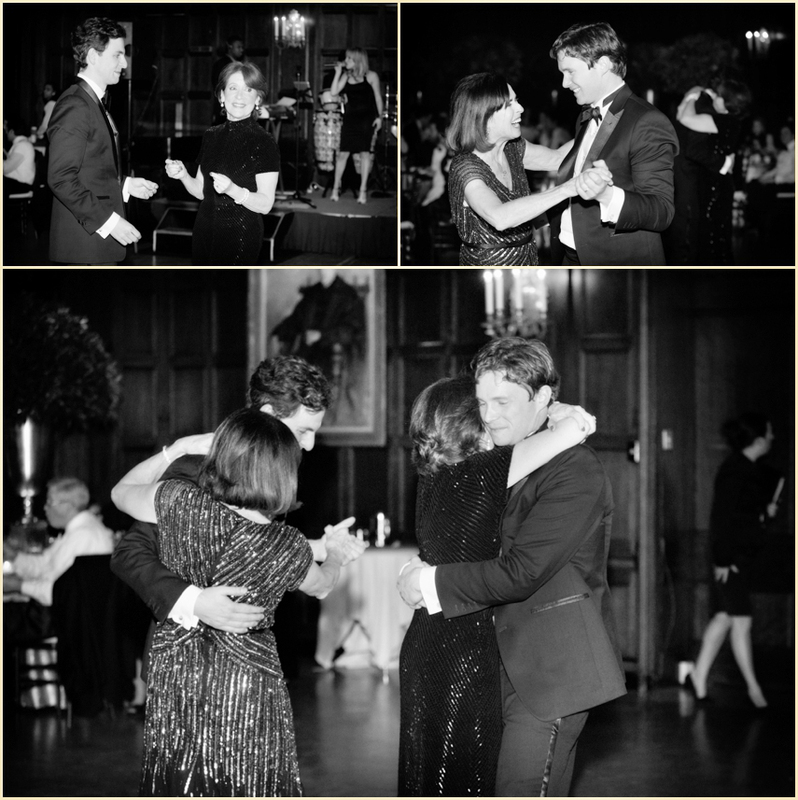 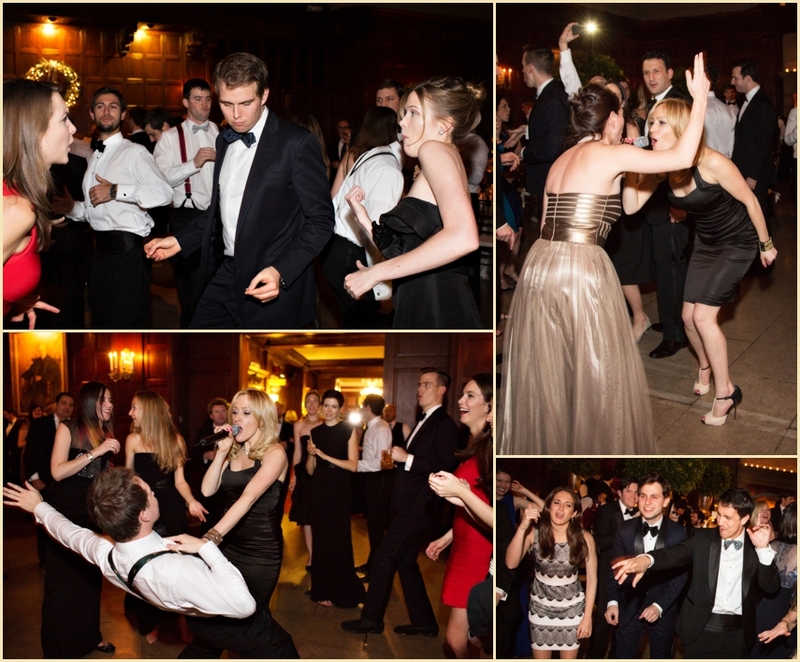 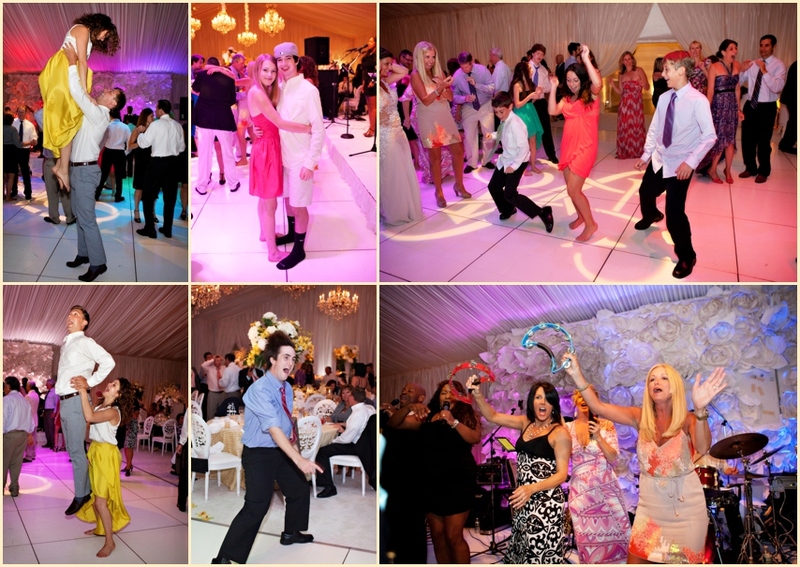 As soon as dinner concluded, the dancing kicked off with music by Nightshift Entertainment. 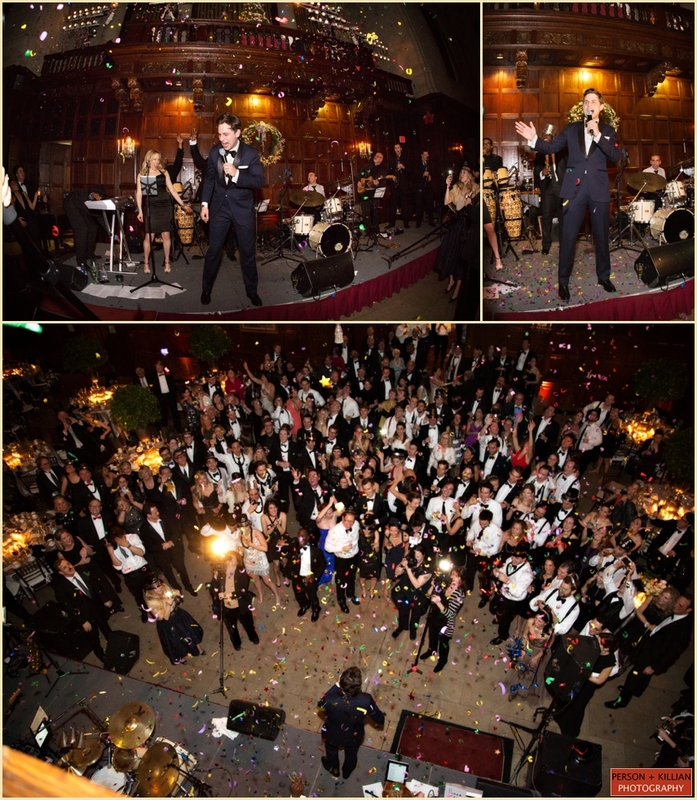 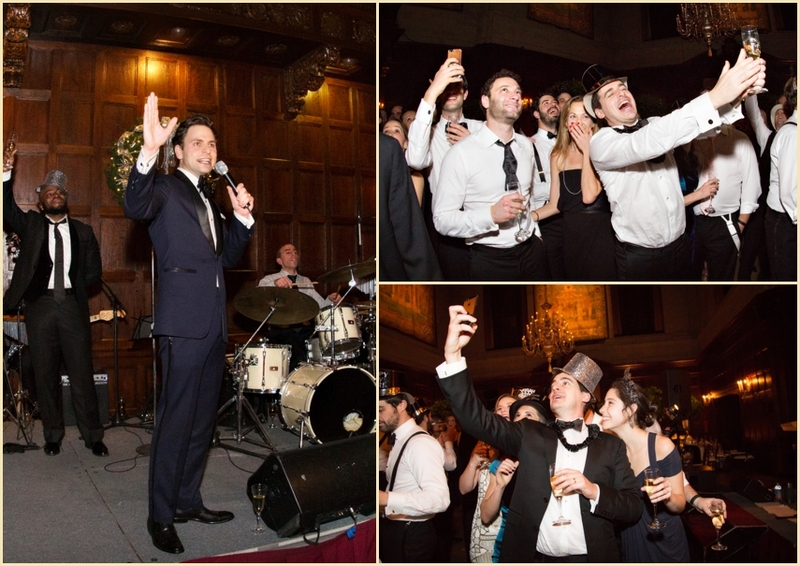 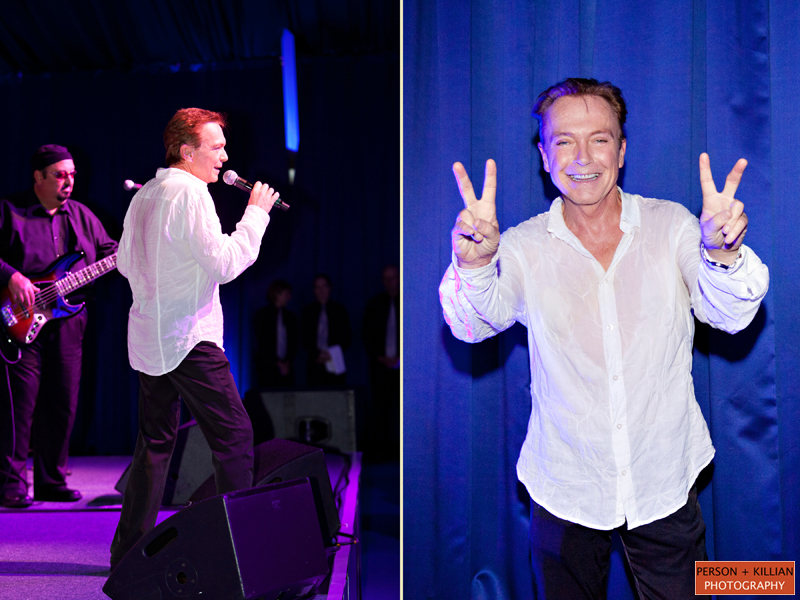 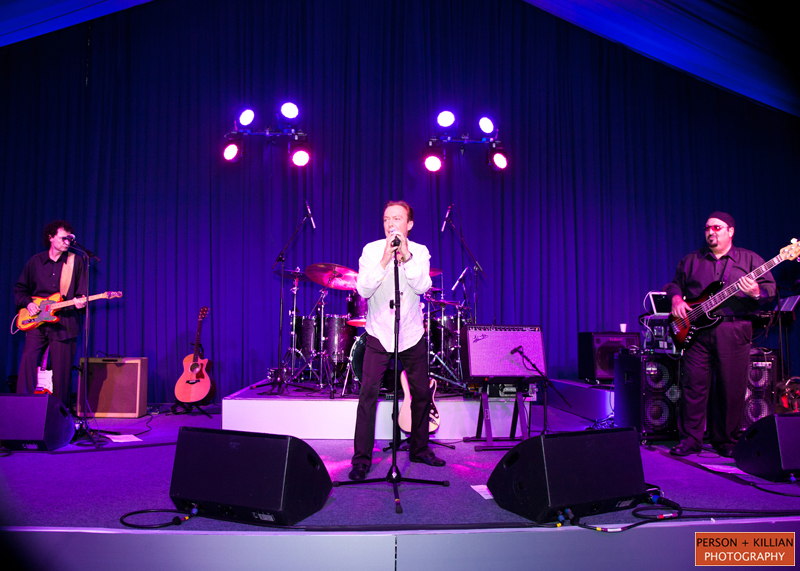 When the clock struck midnight, Eliah took the stage to preform the classic Frank Sinatra song “New York, New York”. 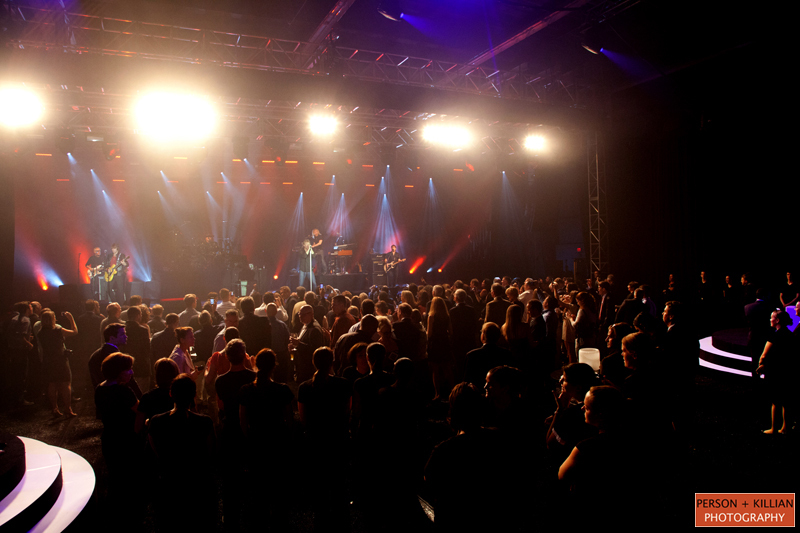 Just before the end of the song, confetti filled the air from the balconies. 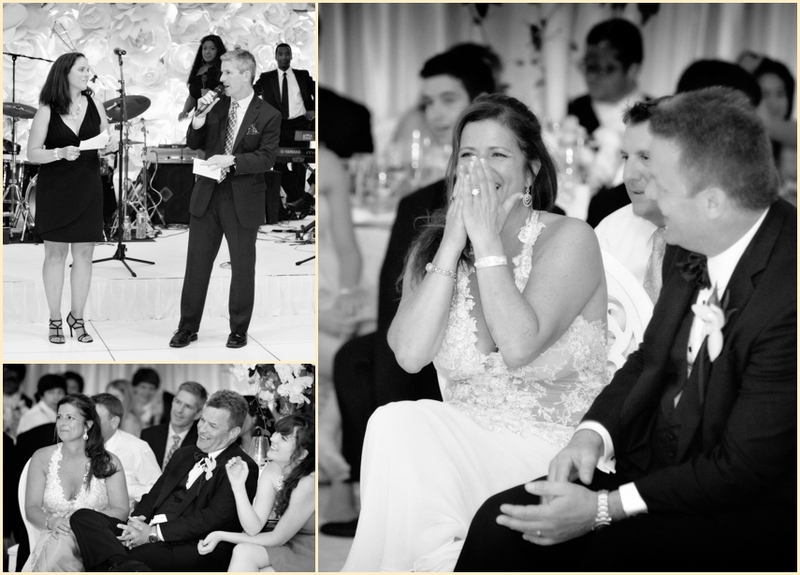 This was a surprise to guests who joined in the song and celebration. 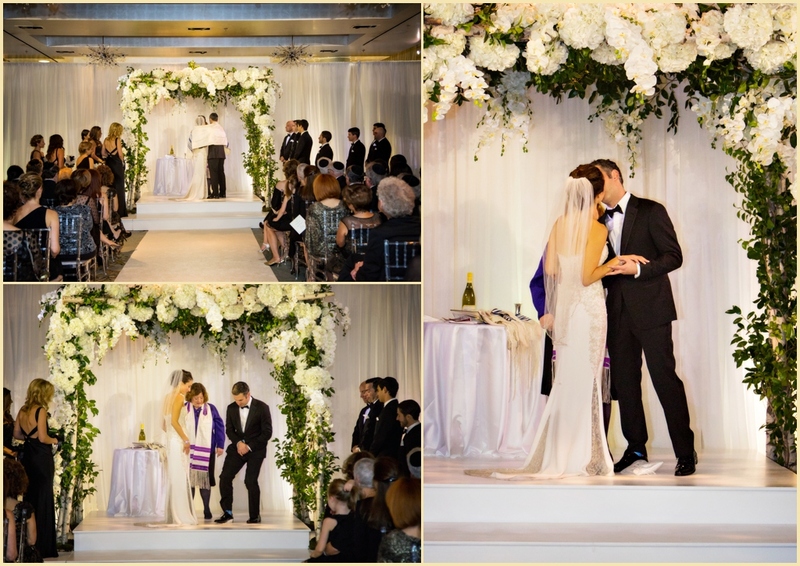 Congratulations to Eliah and Jamie. 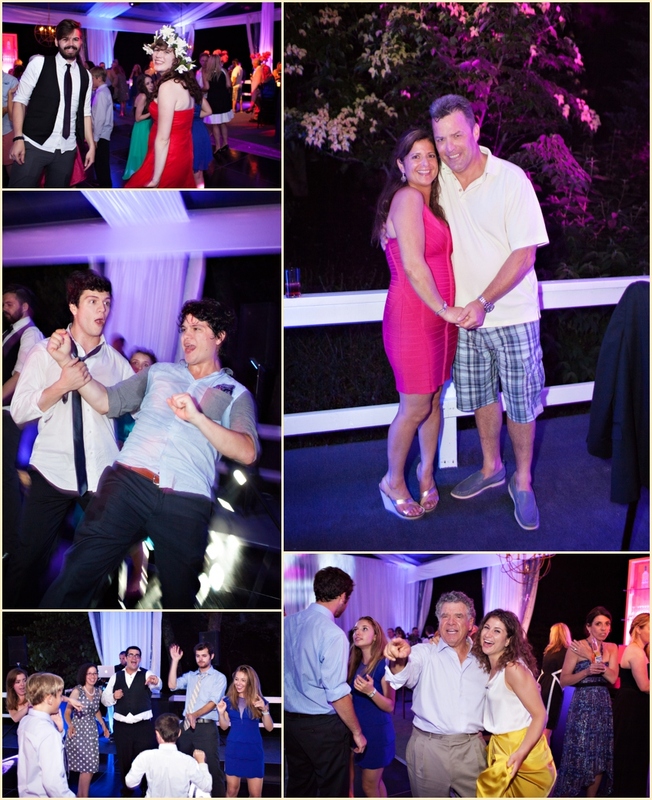 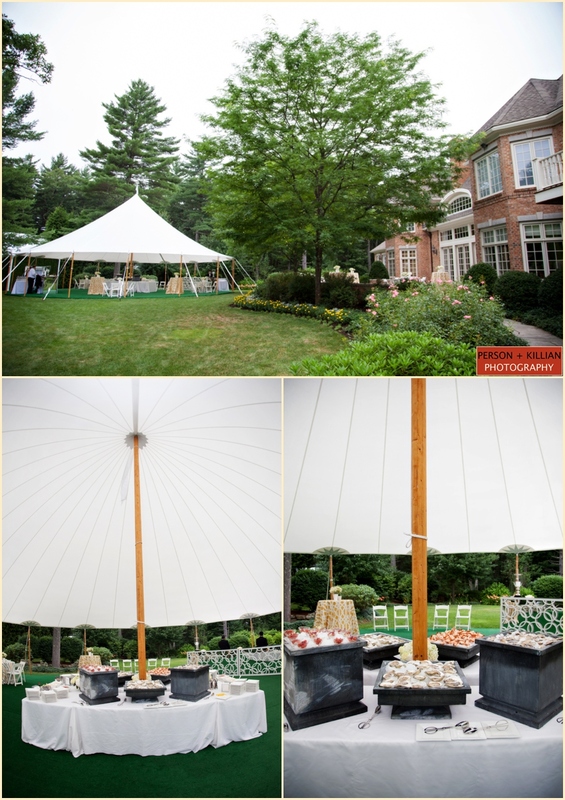 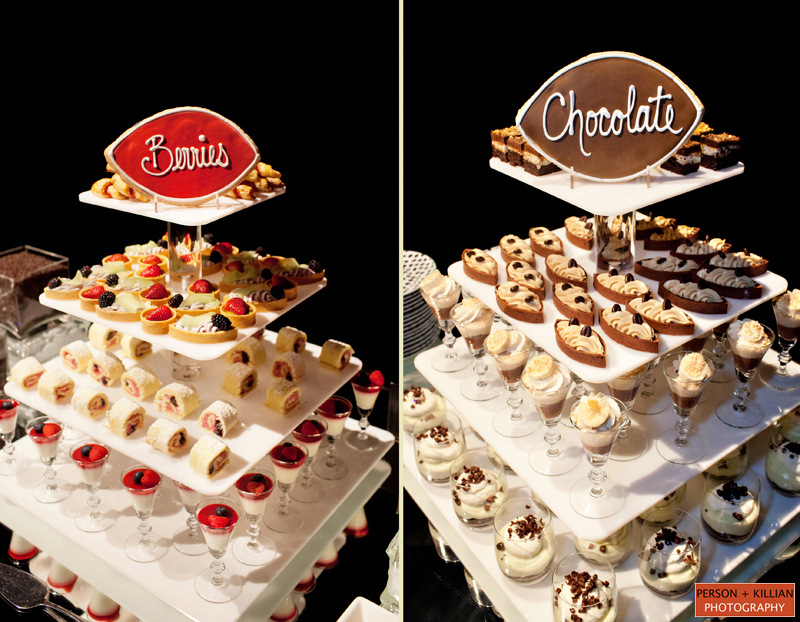 We had such a wonderful time capturing your rehearsal dinner and wedding celebration! 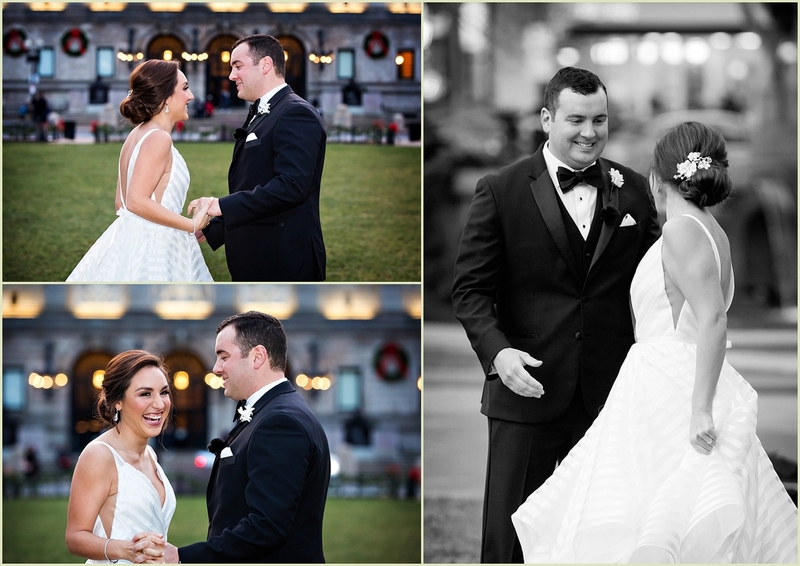 This was the perfect way to kick off a new year of weddings and events. 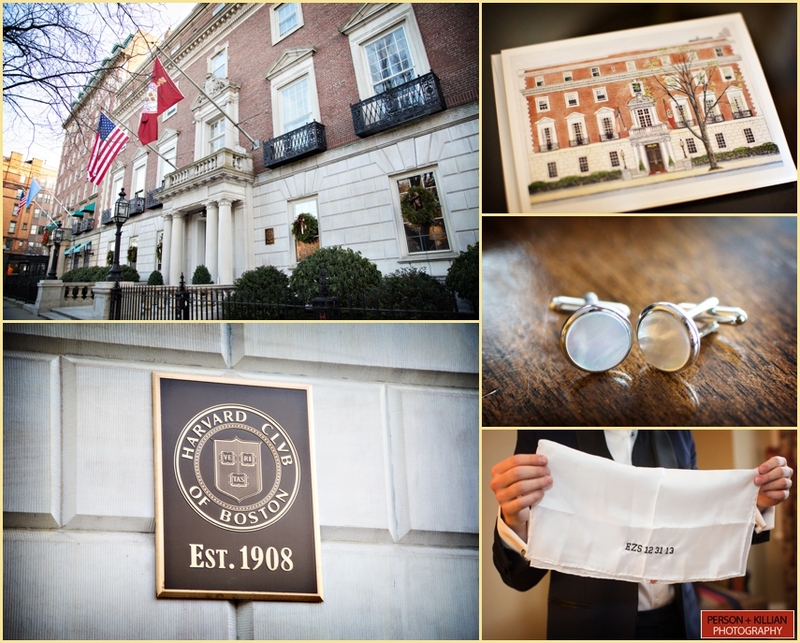 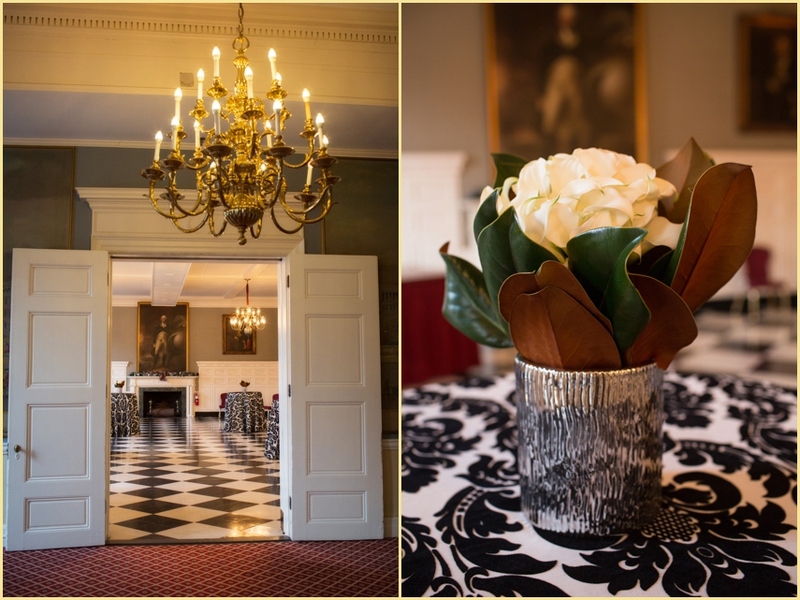 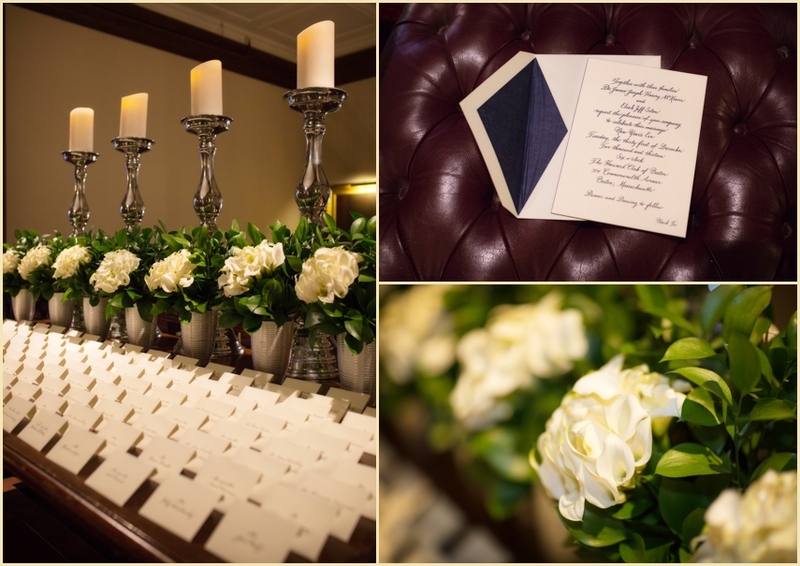 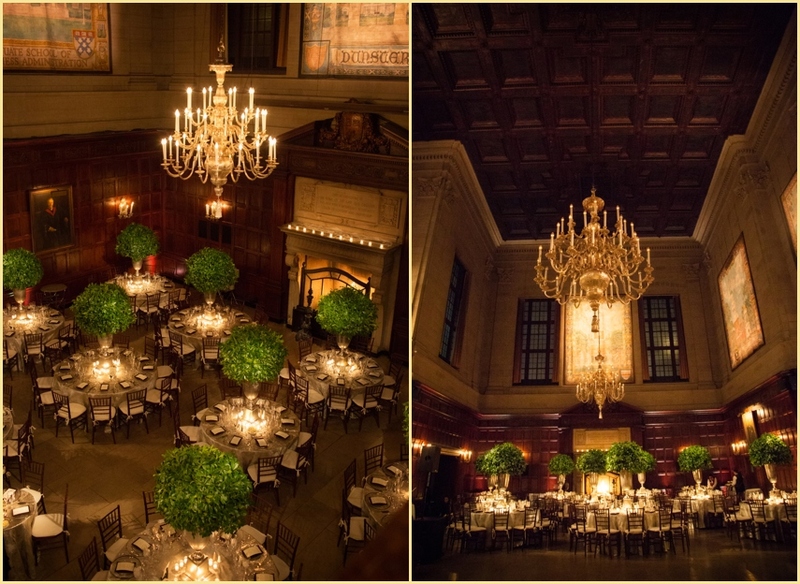 A big thank you to Nicole Simeral of Simeral & Company for flawless planning and to Jennifer and her team at the Harvard Club of Boston for always being so great to work with. 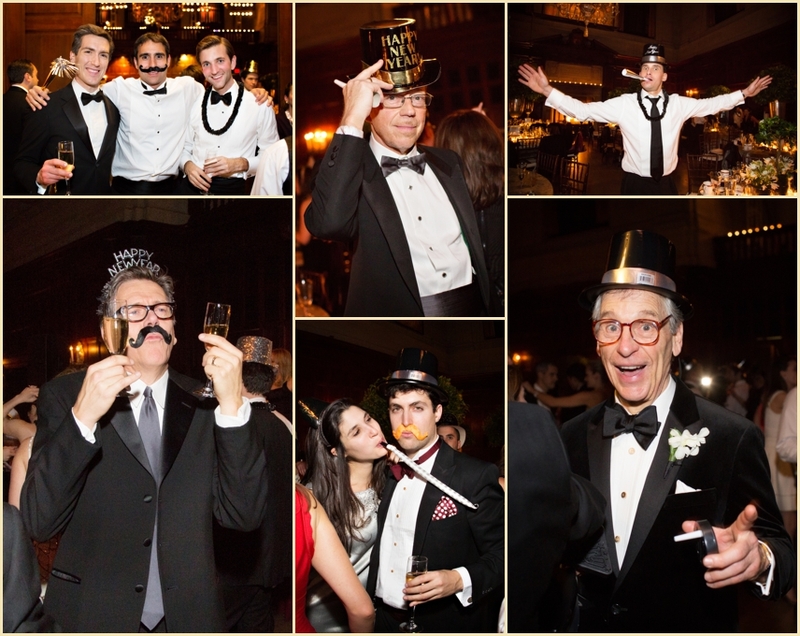 A very happy 2014 to all! 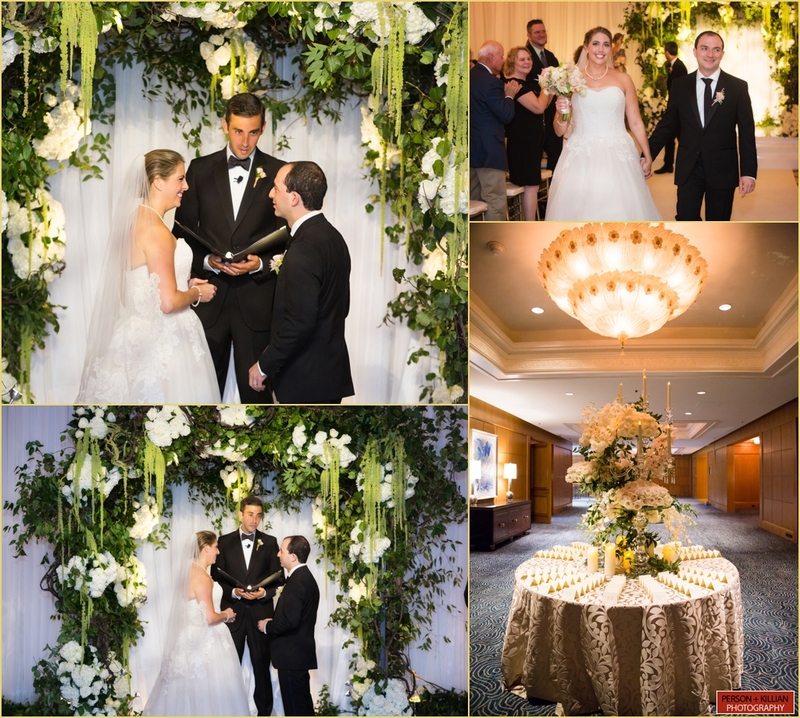 When we asked Lindsey to describe her beautiful Four Seasons Boston wedding day, she said “romantic, classic, elegant, with a modern flair!“. 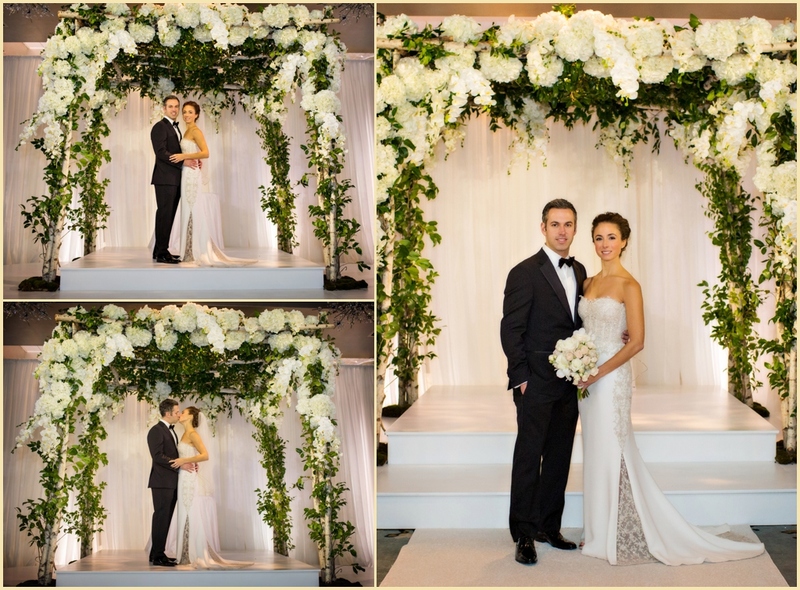 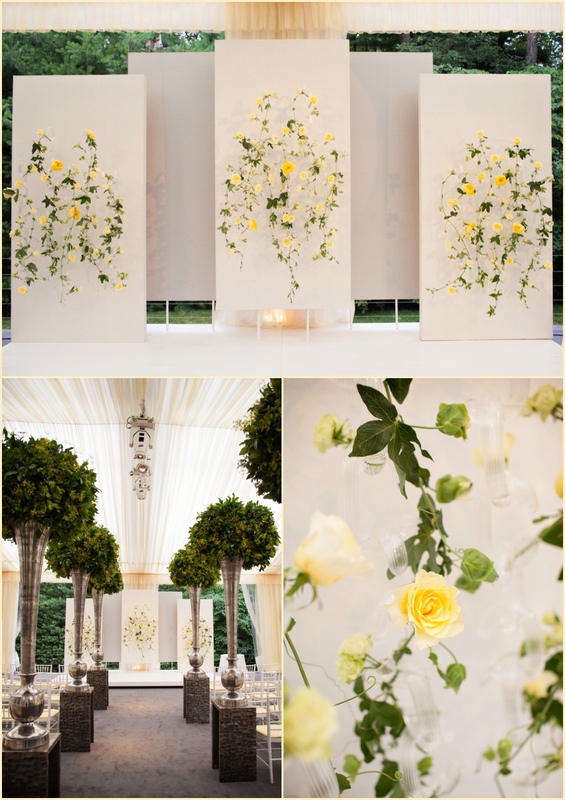 This stunning wedding was all that and more, with the beautiful backdrop of the Four Seasons Boston, gorgeous floral arrangements from Marc Hall Designs, and the impeccable design and planning of the team at Janie Haas Events. 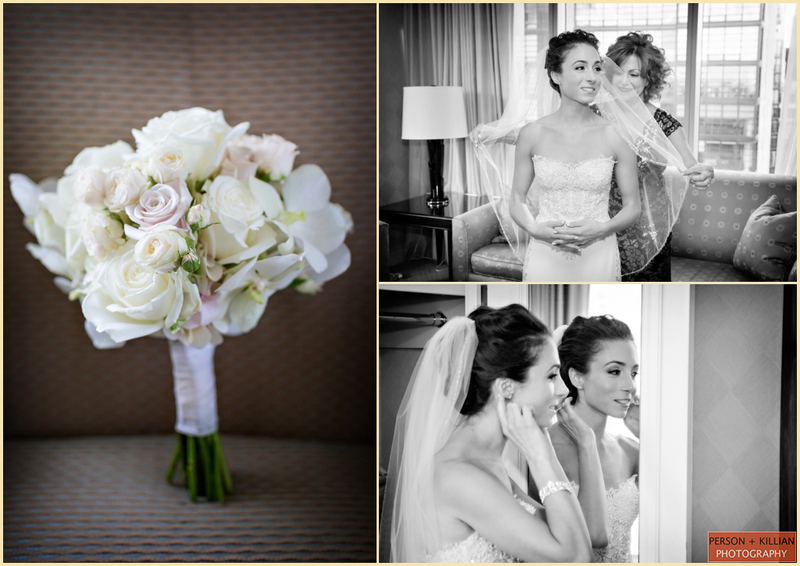 We started the day with Lindsey and her bridesmaids in the rooms of the Four Seasons Boston. 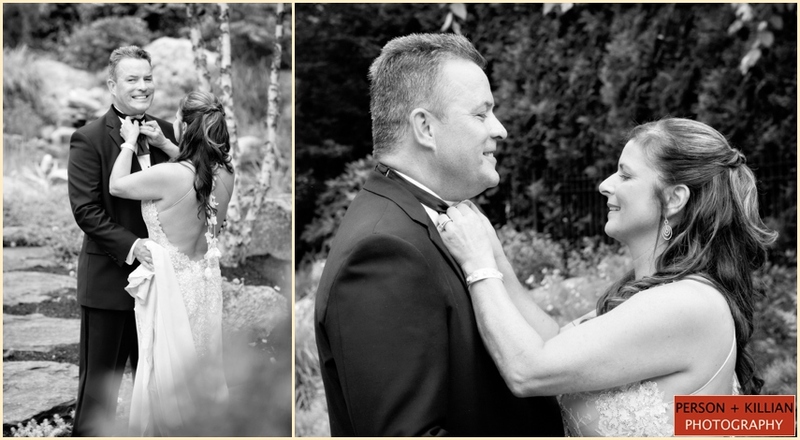 After the final touches of hair and makeup, we photographed the bride getting buttoned into her gown — a classic white strapless dress with a silver beaded belt designed by Monique L’hullier. 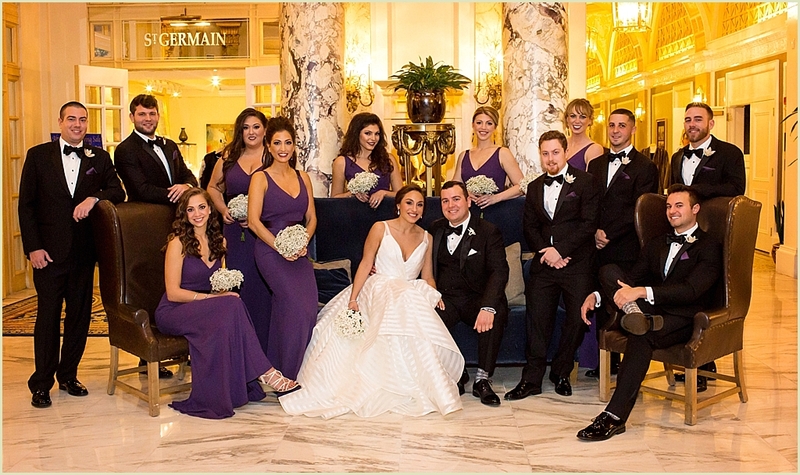 The bridesmaid’s deep blue dresses added a great pop of color, matched with pearl earrings and necklaces for the ladies. 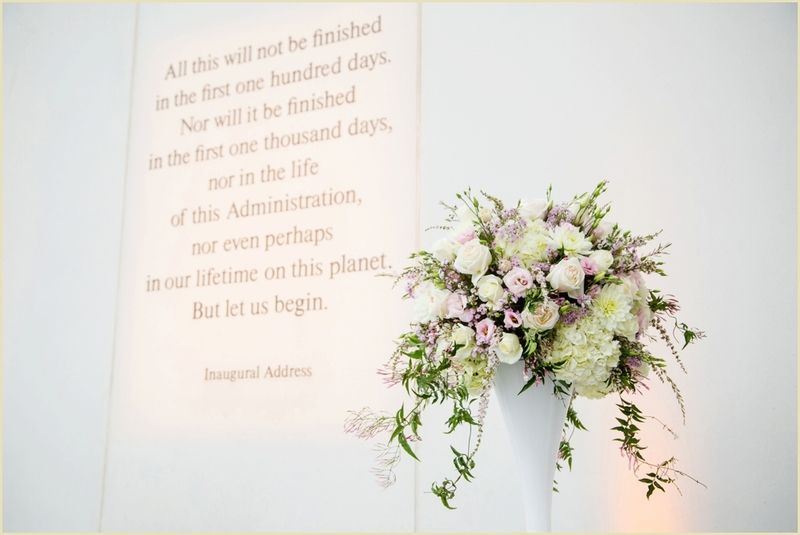 The attendant’s bouquets from Marc Hall Designs was soft and modern, an arrangement of mostly white flowers with accents of bright orange and yellow. 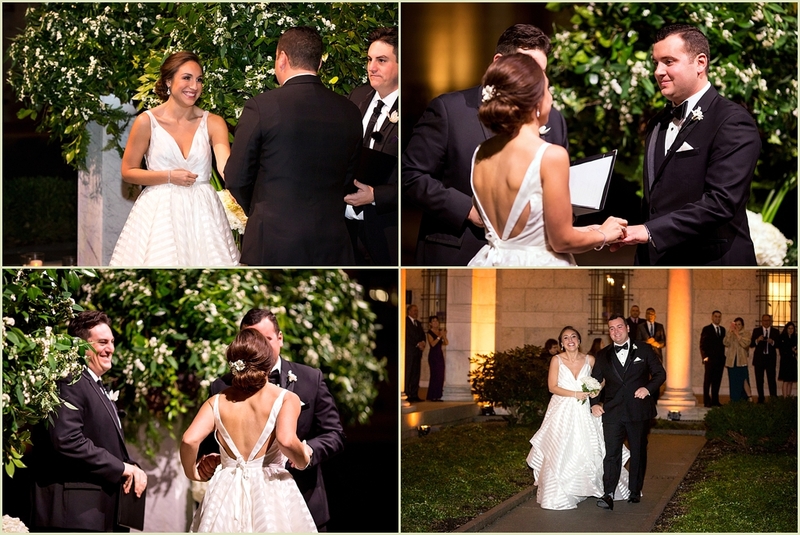 The bride carried a modern twist on a classic bouquet made of white rose petals. 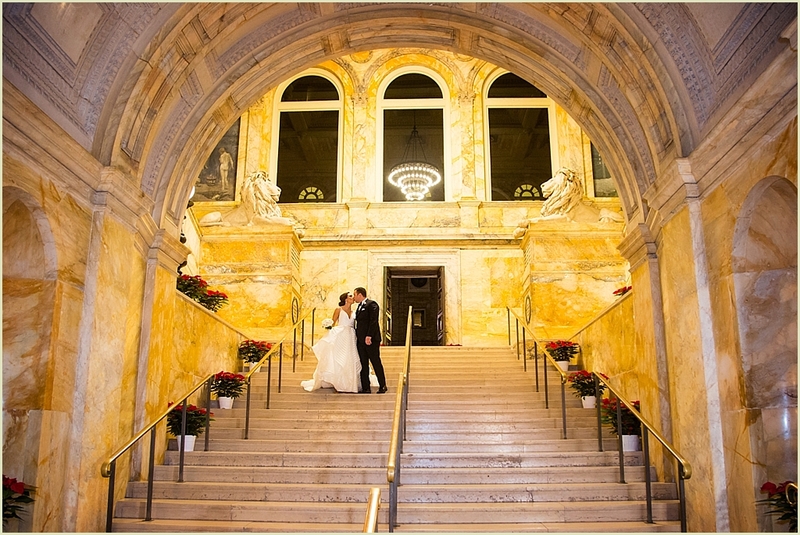 Lindsey and Luis had their first look on the steps of the Four Season’s grand staircase, before heading outside to get some shots of the happy bride and groom in the Boston Public Garden! 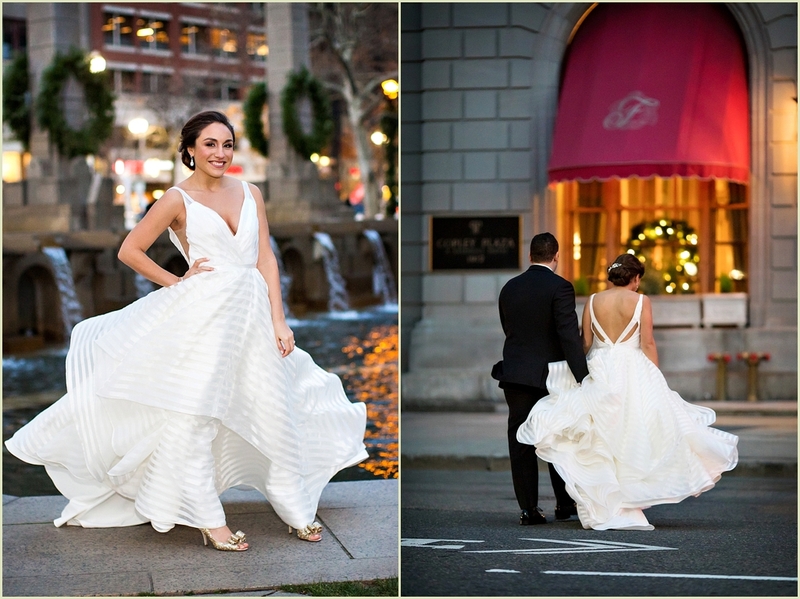 We headed back inside to the Four Seasons Boston to get the rest of the formal shots with the wedding party, close friends, and family. 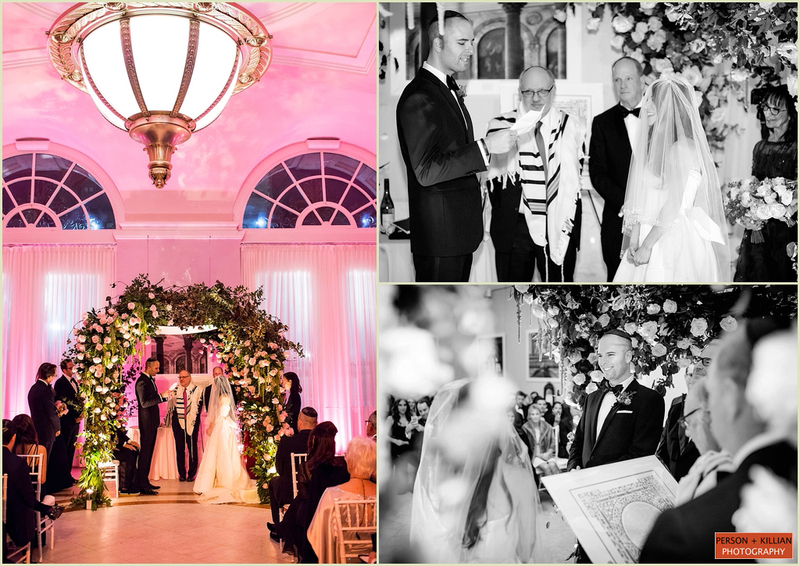 Before beginning the ceremony in the Four Seasons Boston’s Governor’s Room, the bride and groom signed their Ketubah — a traditional Jewish marriage document — surrounded by friends and family. 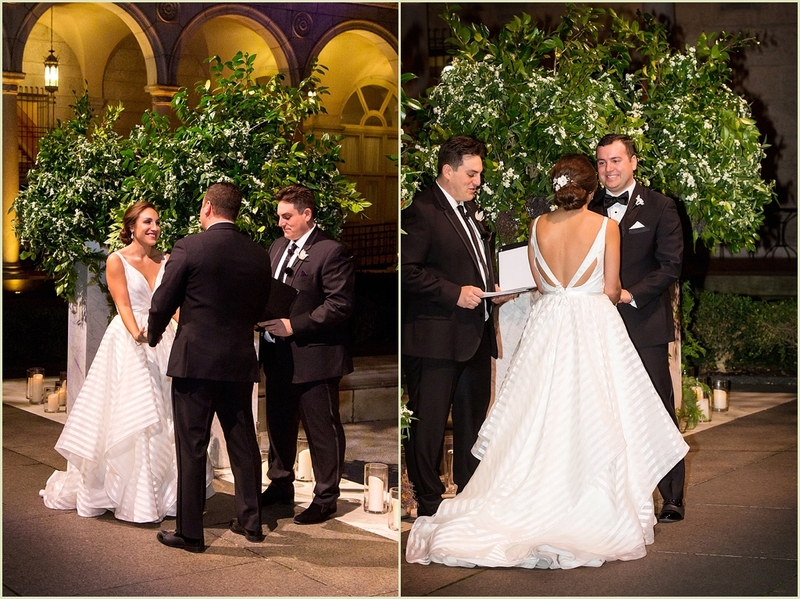 The elegant ballroom ceremony that followed was absolutely breathtaking, a classic white Chuppah stood in front of a wall of white flowers where Lindsey and Luis would exchange their vows. 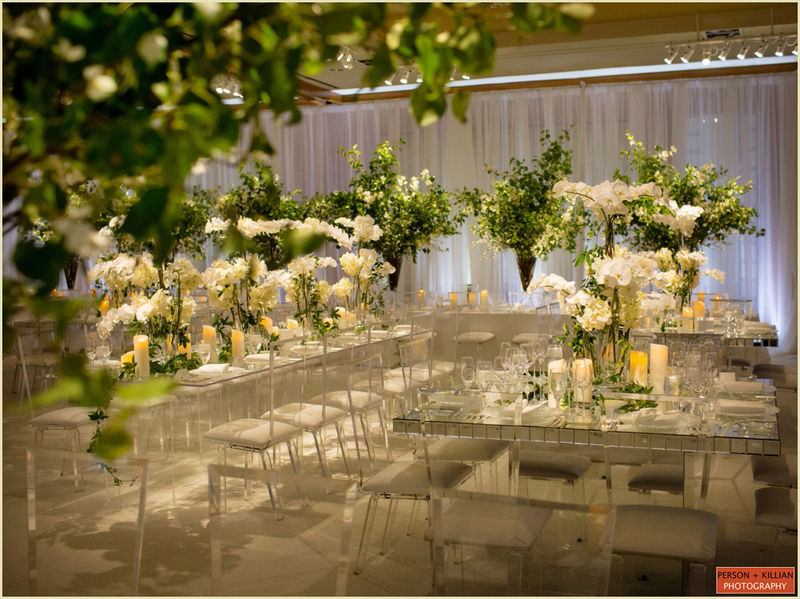 The back of the aisle was accented by a white and green floral arrangement, with flowers pouring out onto the floor as the wedding party processed down the aisle. 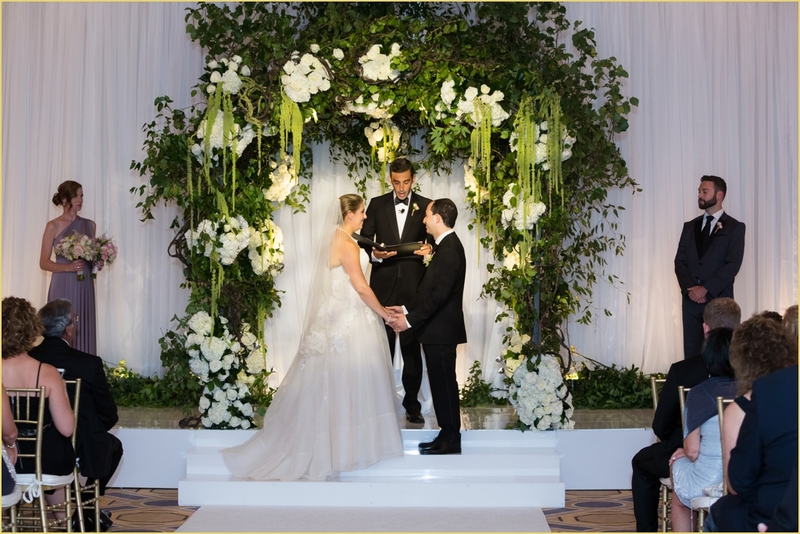 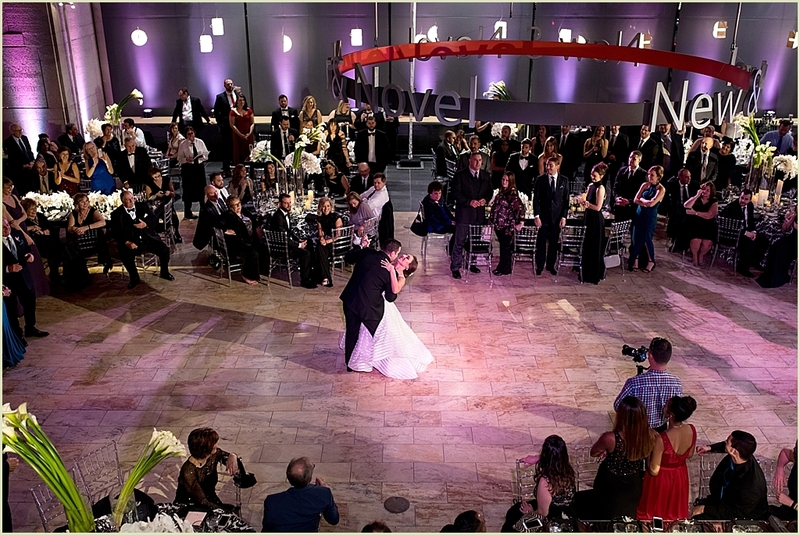 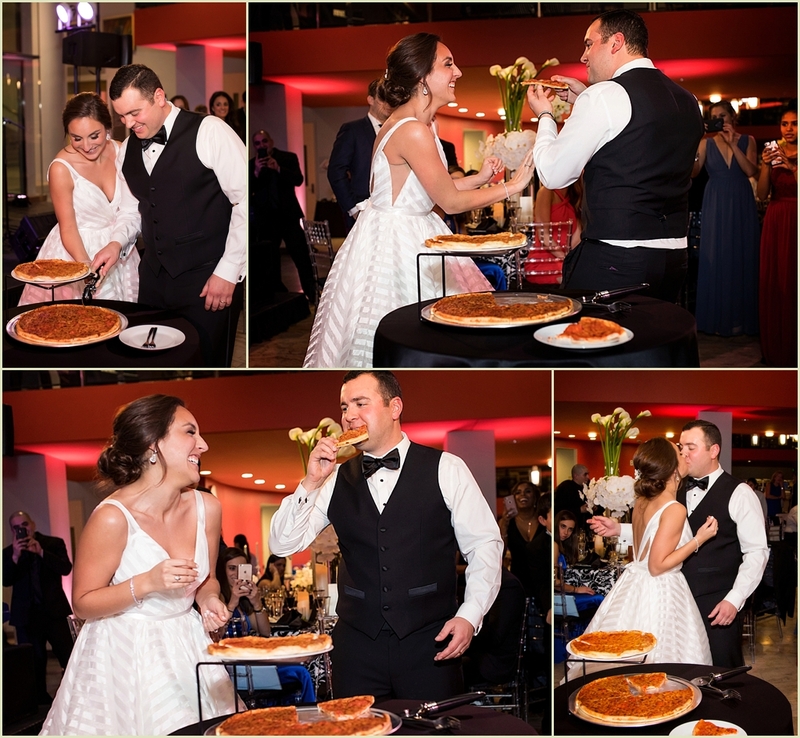 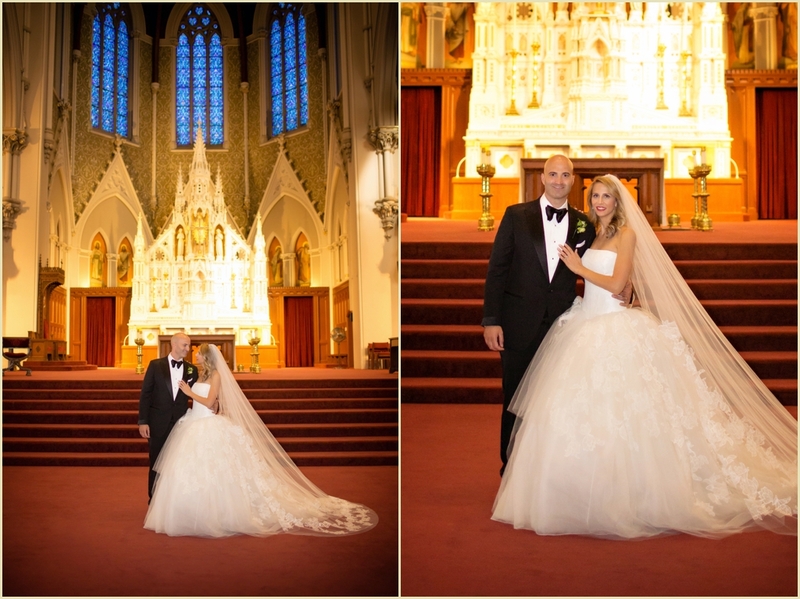 Lindsey and Luis said their “I do”s in an inter-faith ceremony, mixing both Jewish and Catholic traditions from both sides of their families. 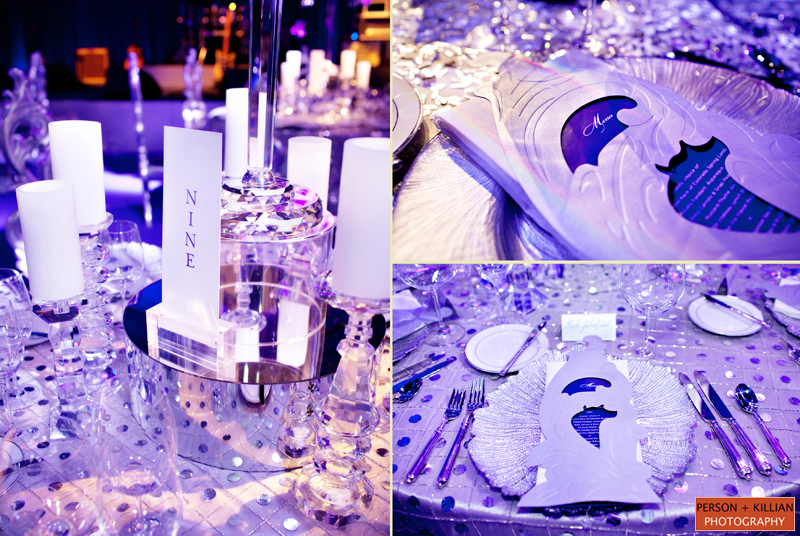 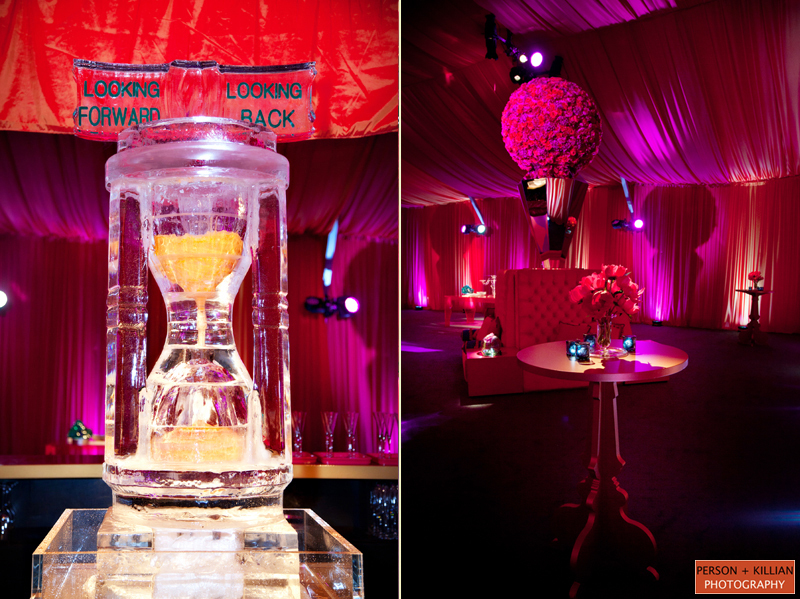 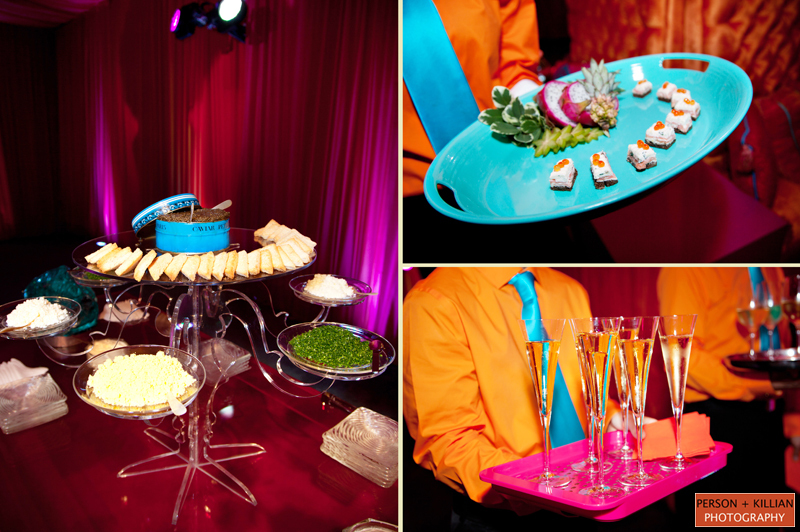 Guests enjoyed cocktails in the Aujourd’hui room, which featured a stunning display of customized ice sculptures. 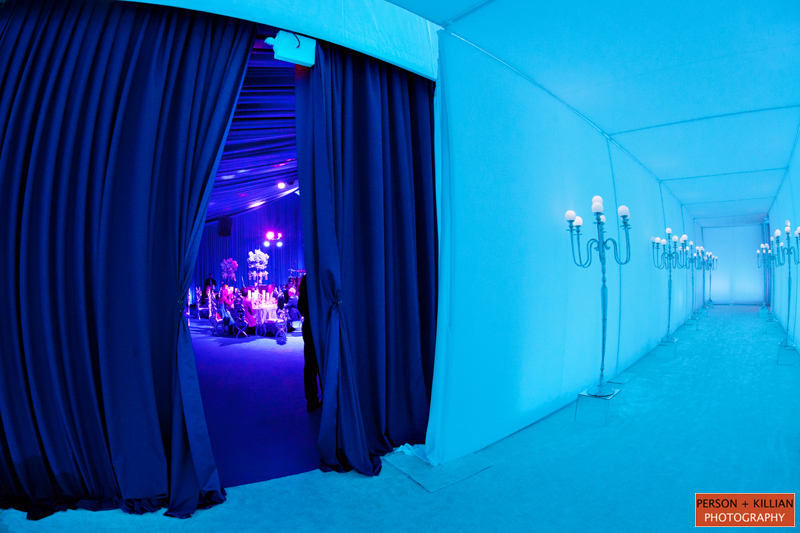 Drinks were served on one side of the ice bar, with a delicious raw bar displayed on the other side. 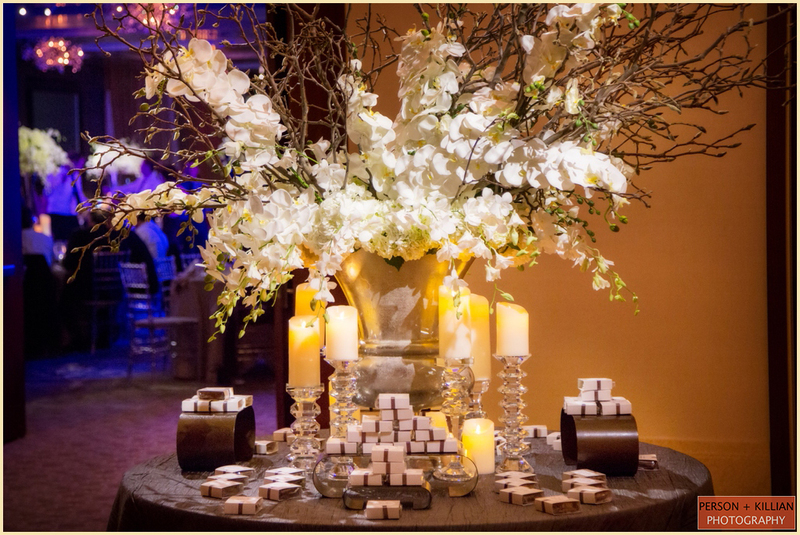 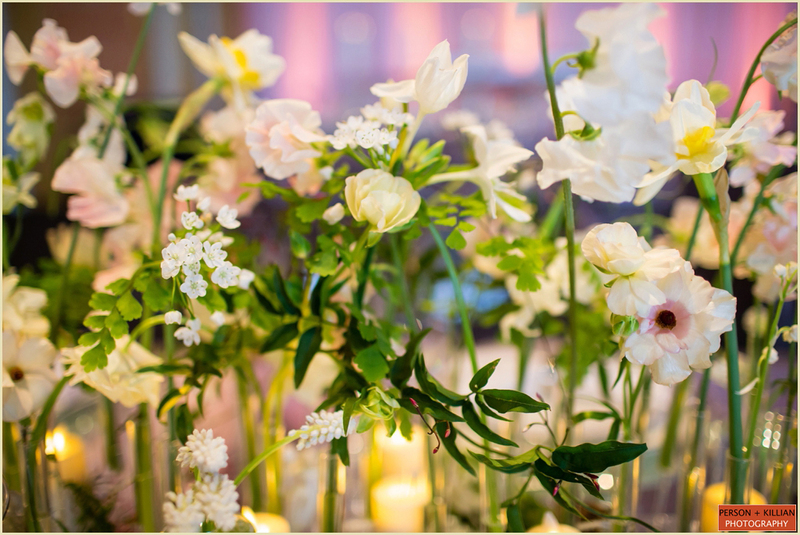 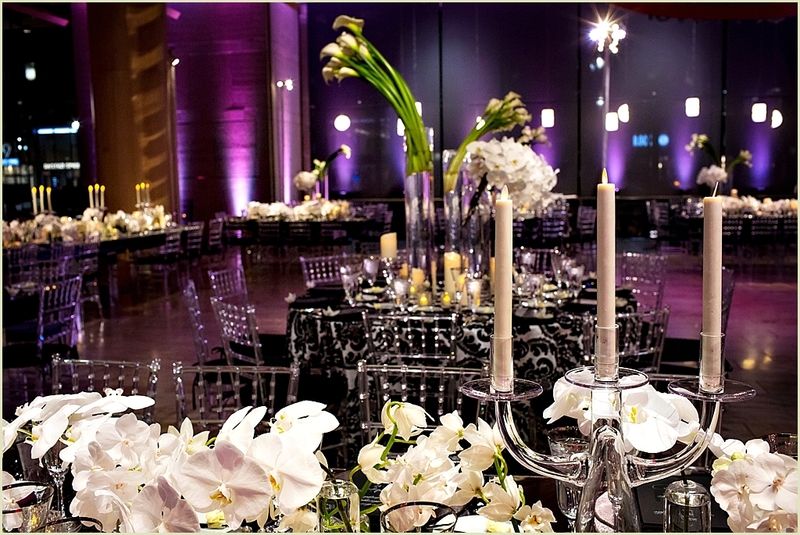 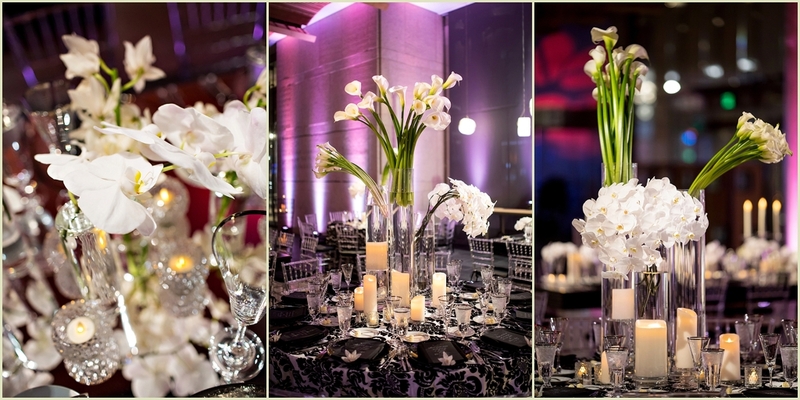 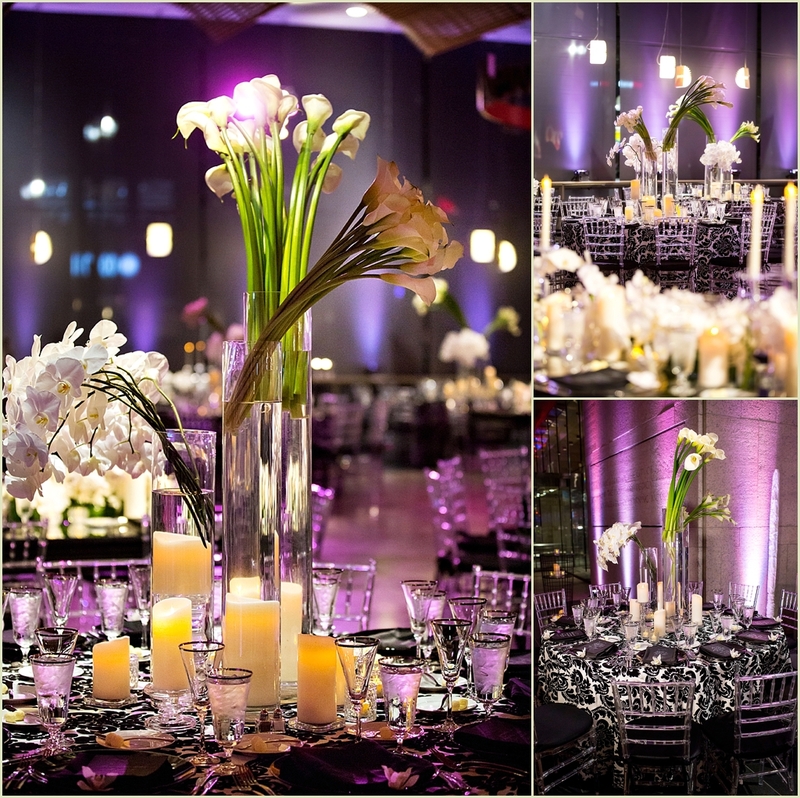 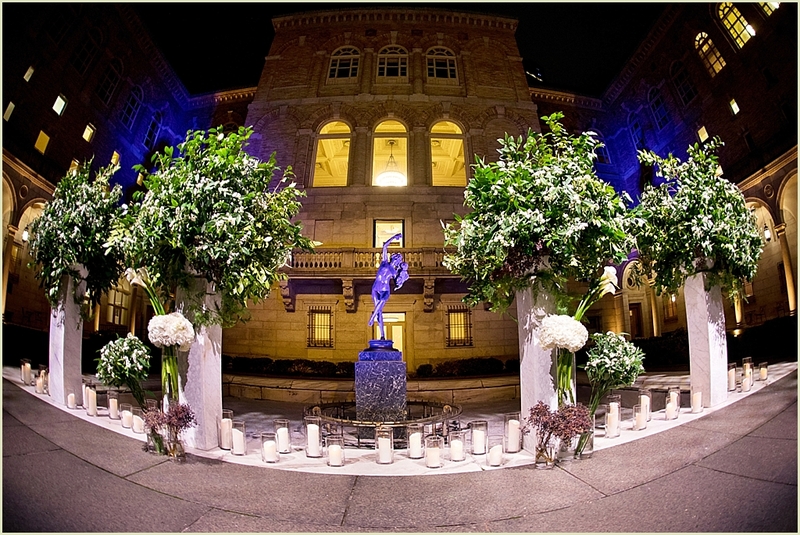 The Foyer space outside of the Grand Ballroom was warmly lit with candles, and featured a set of four classic white lily centerpieces displayed on intricate white pedestals lit with a splash of purple color. 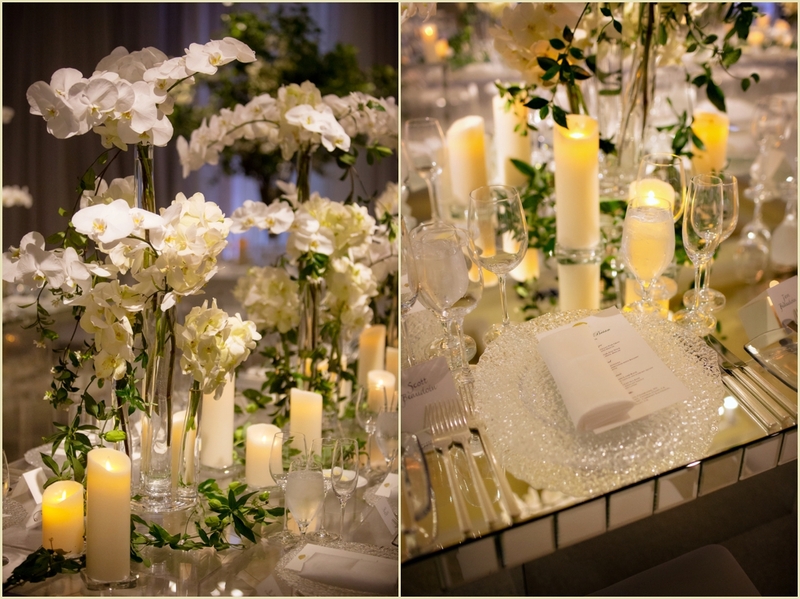 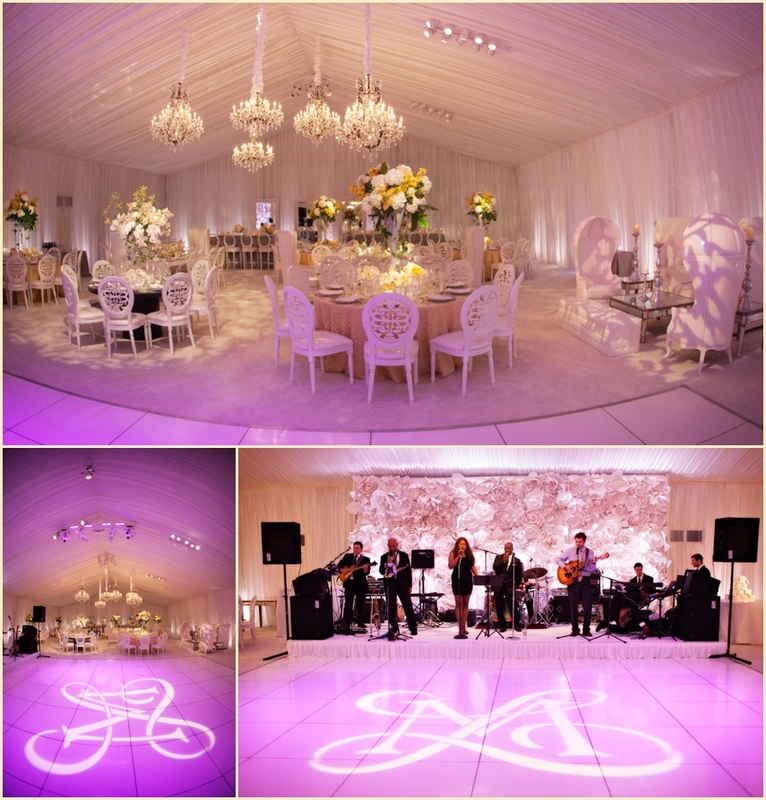 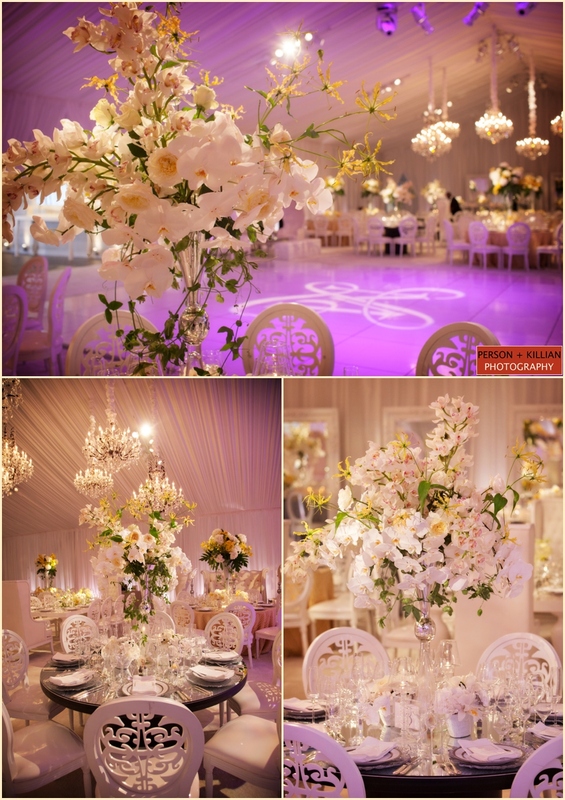 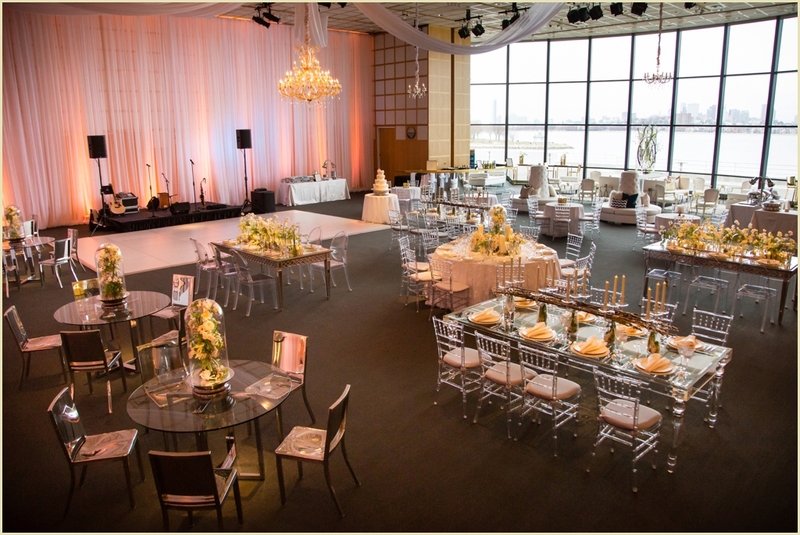 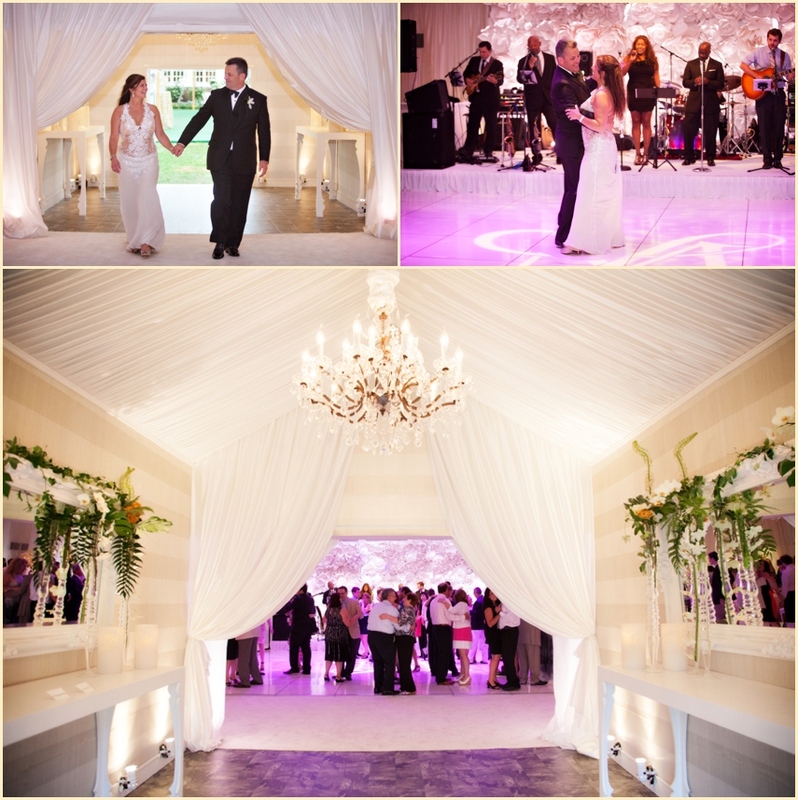 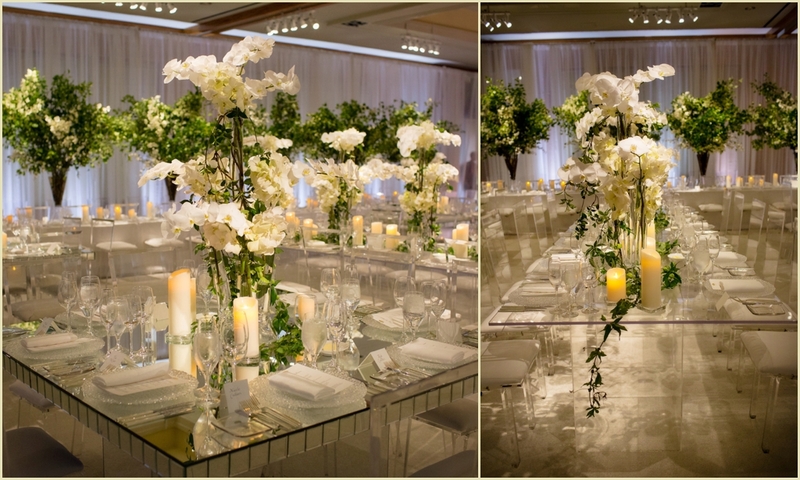 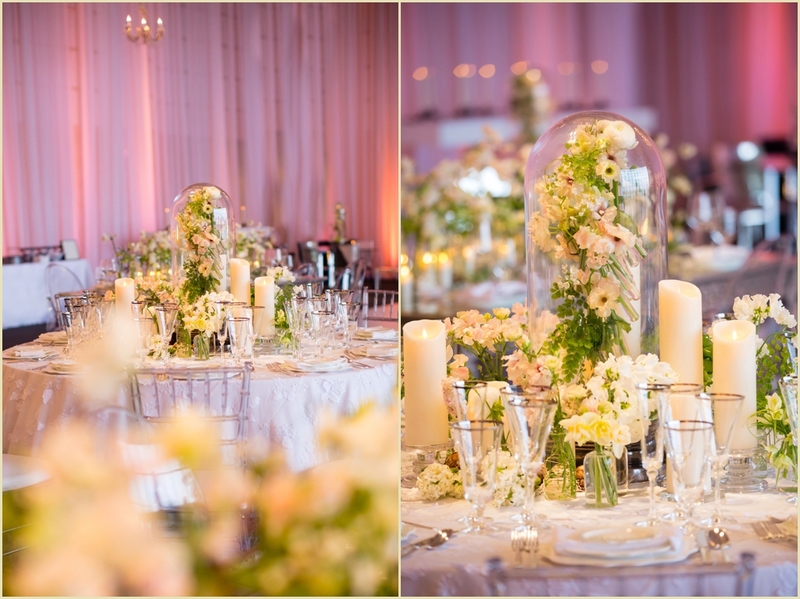 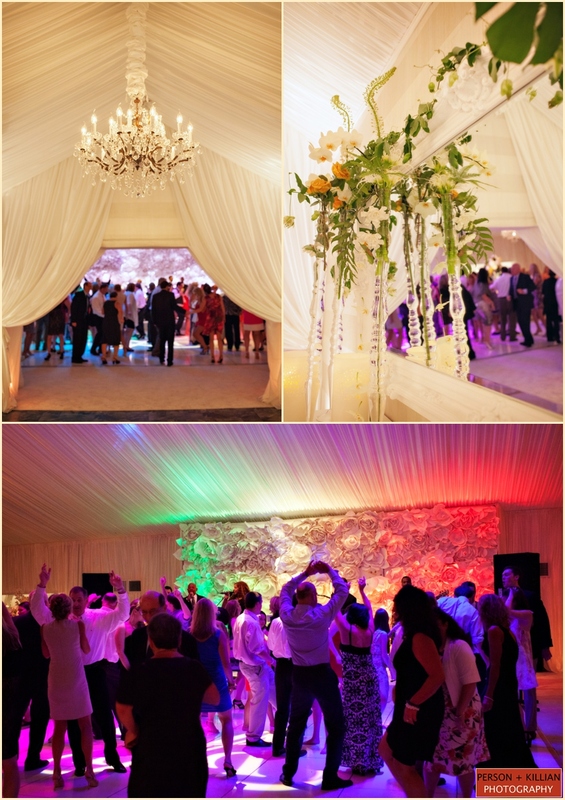 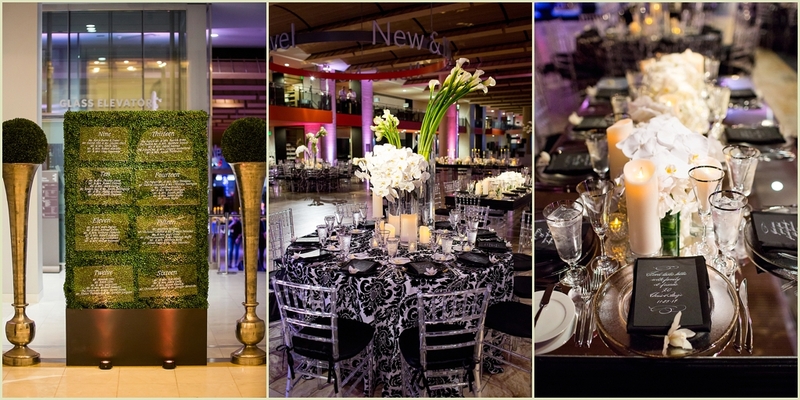 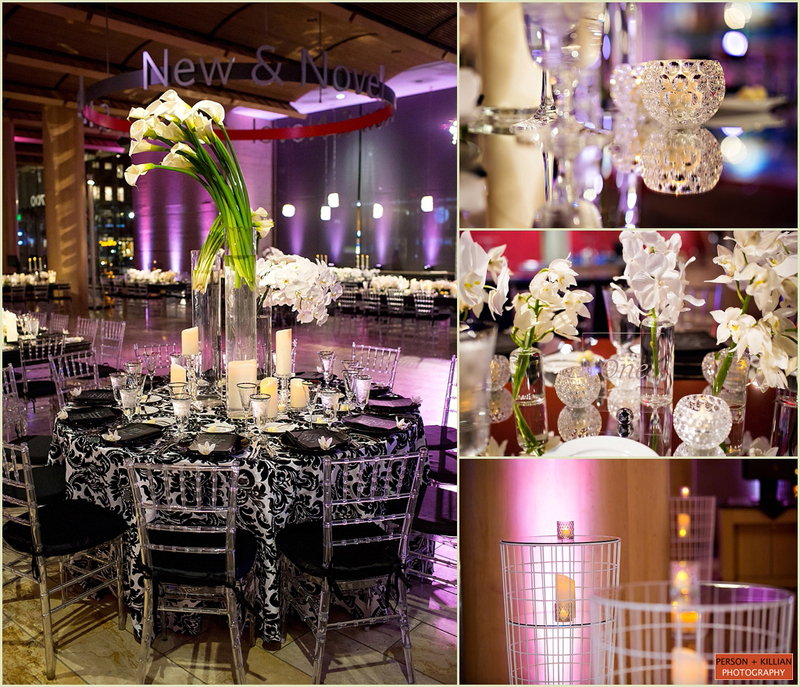 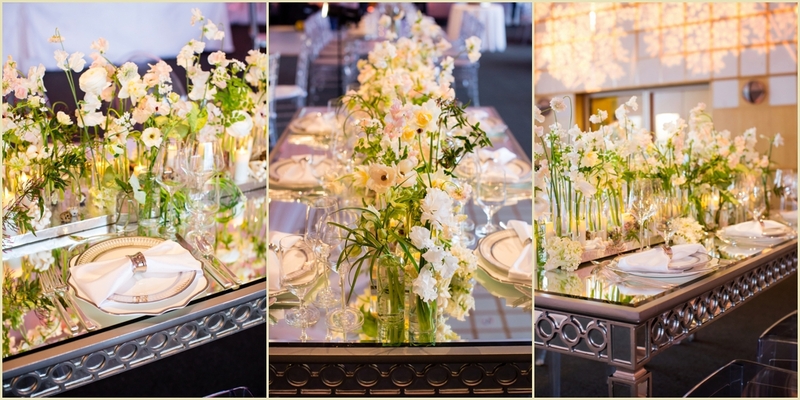 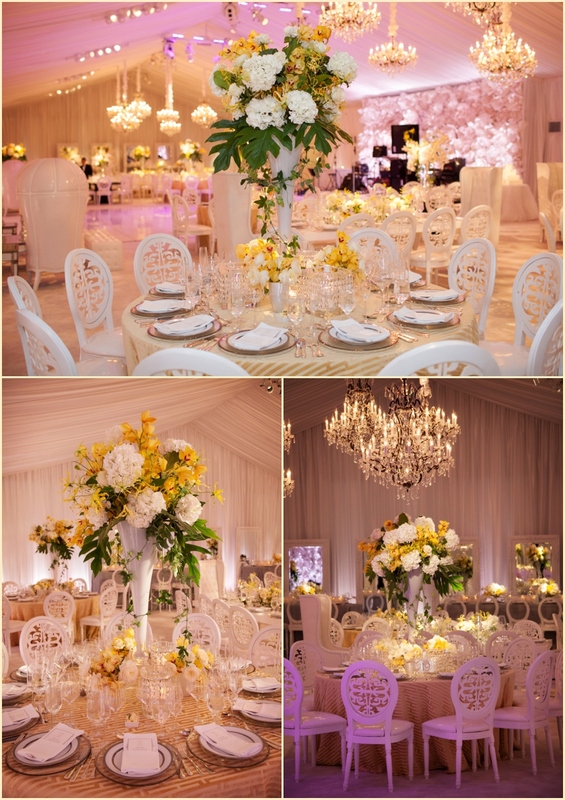 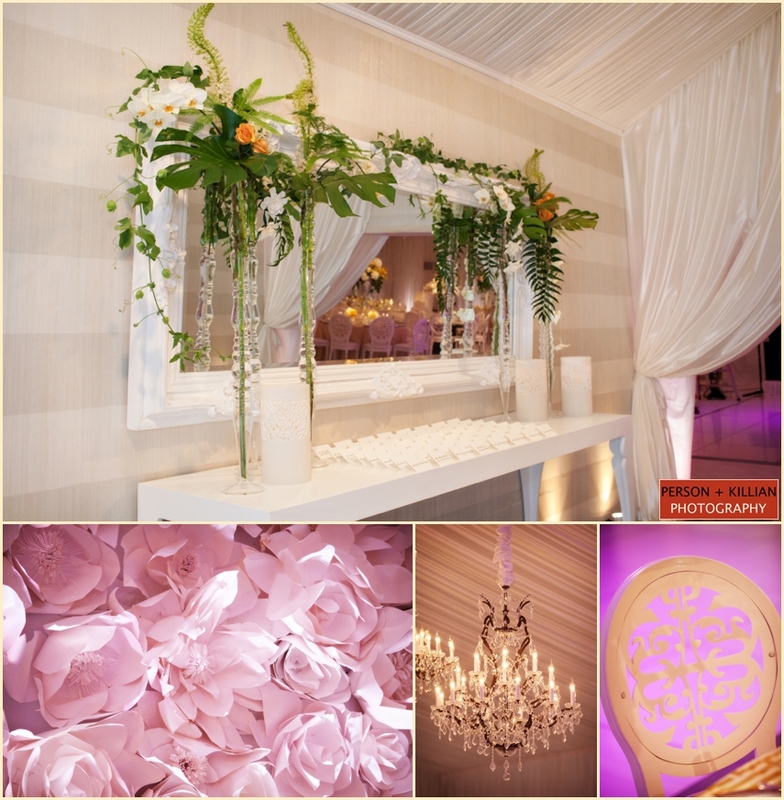 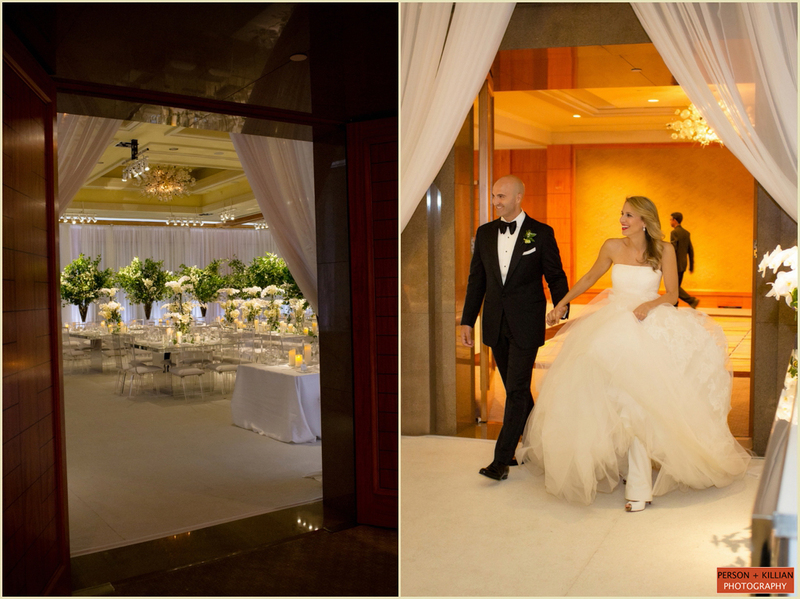 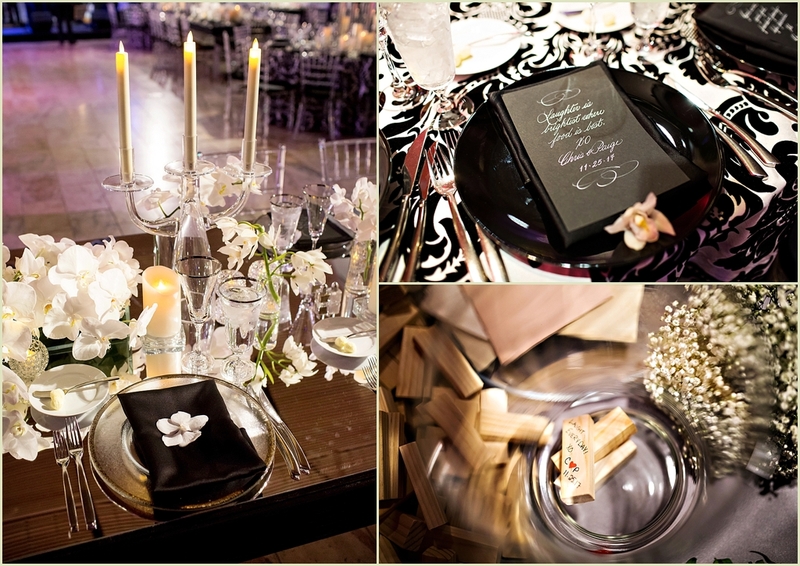 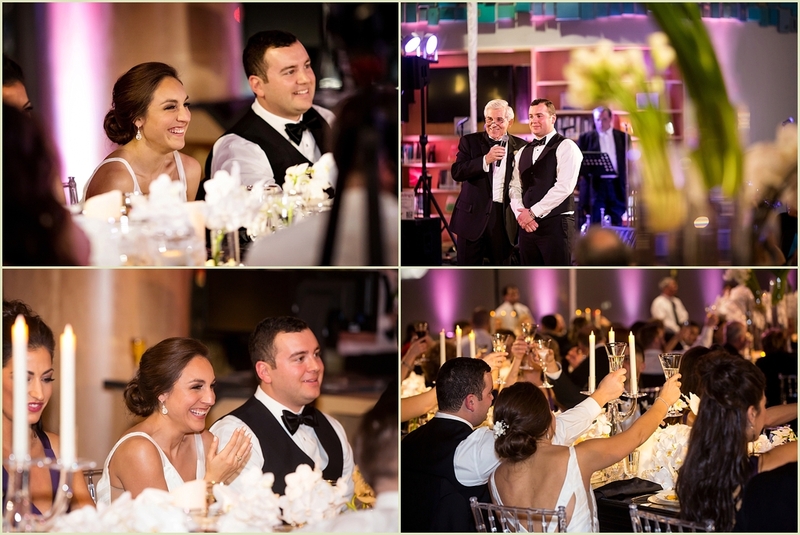 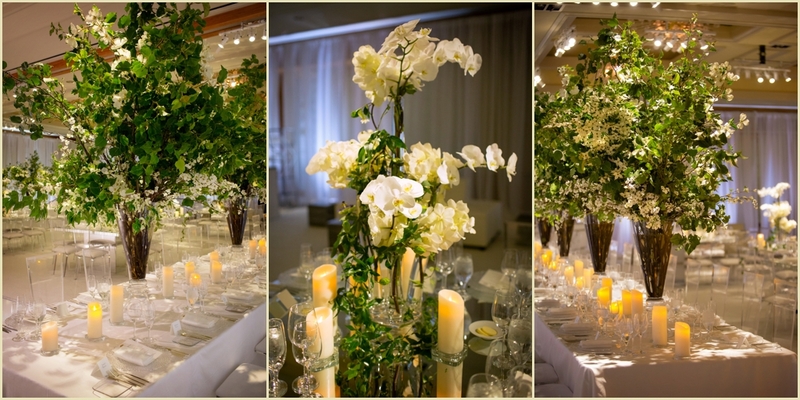 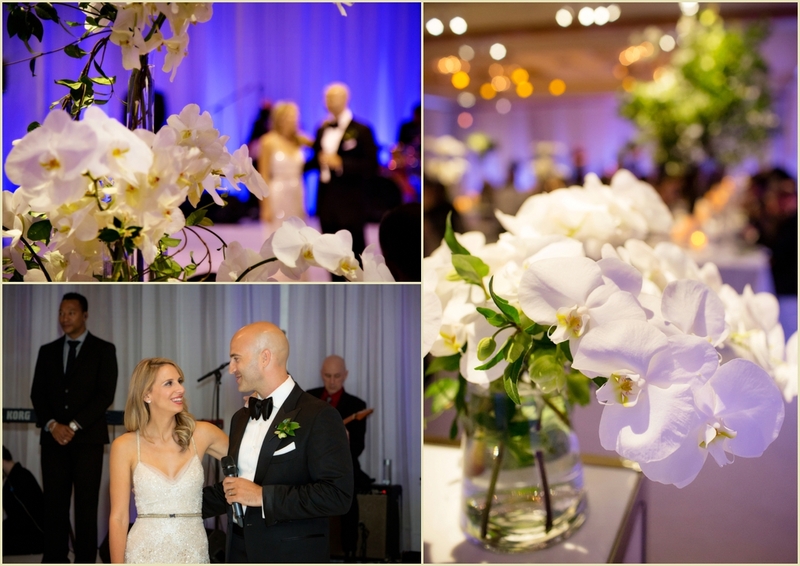 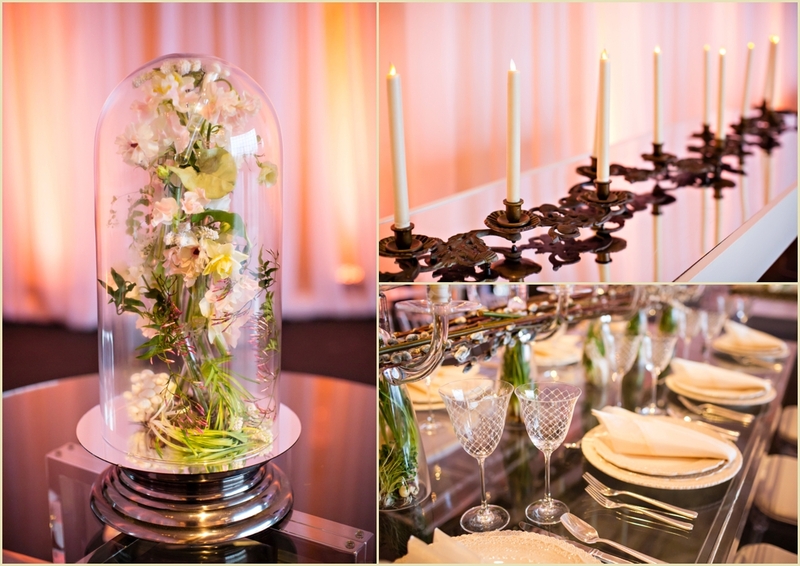 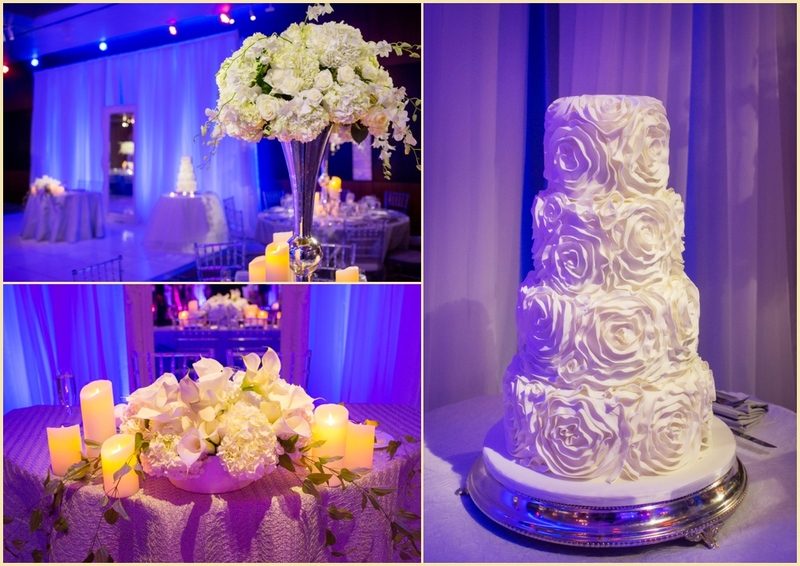 The Four Season’s Grand Ballroom wedding reception was romantic and elegant. 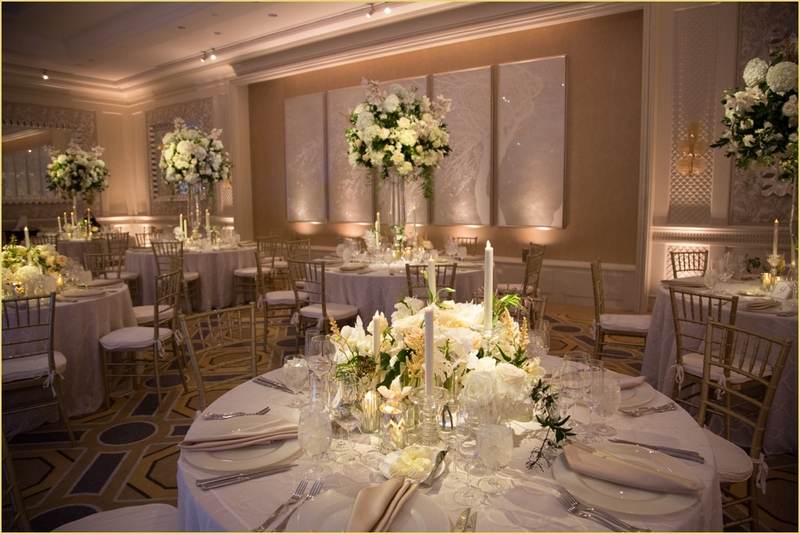 Classic round dining tables with traditional champagne linens were mixed with long communal mirror-top tables, each surrounded by white chiavari ballroom chairs. 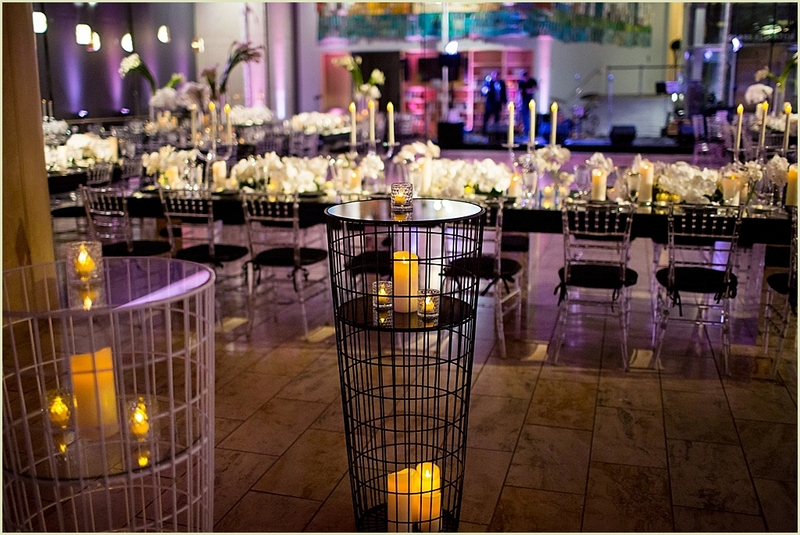 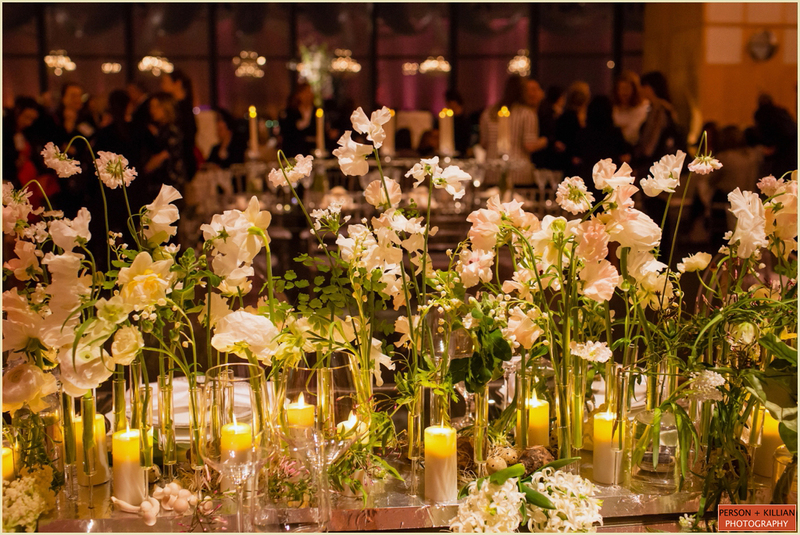 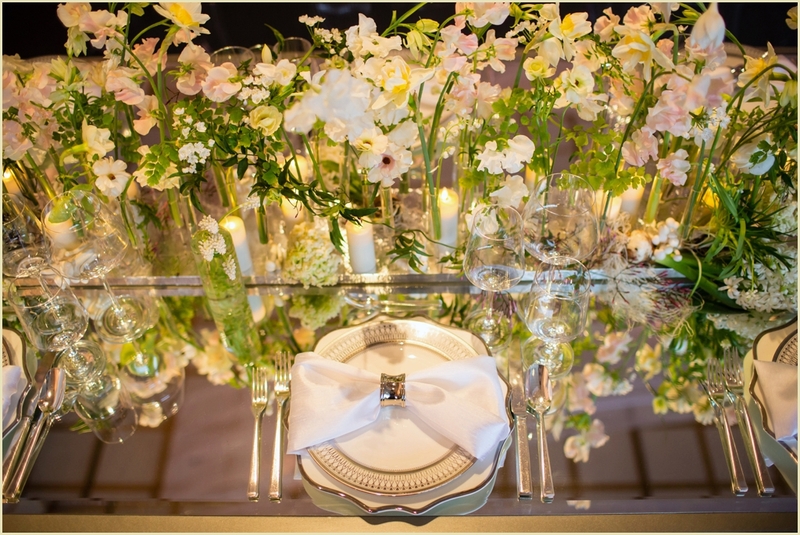 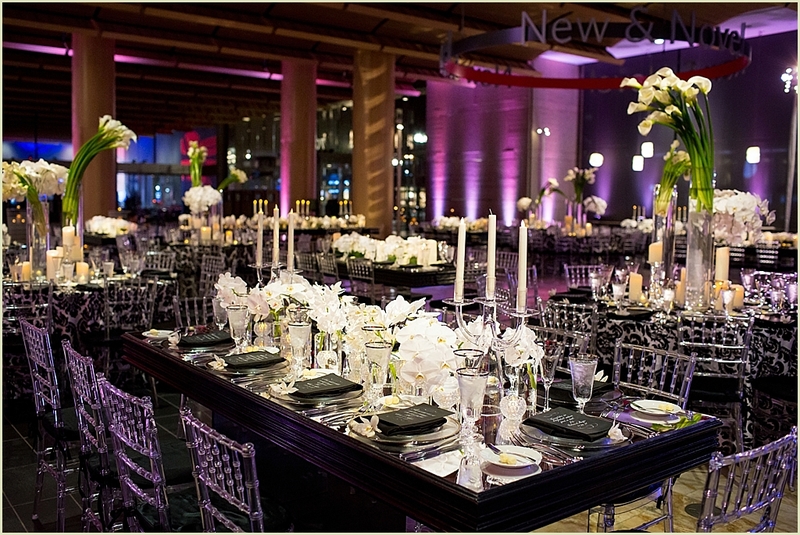 The long tables were topped with a mix of low white florals, while taller arrangements on each of the dining rounds were accented with pin spot lighting from Suzanne B Lowell. 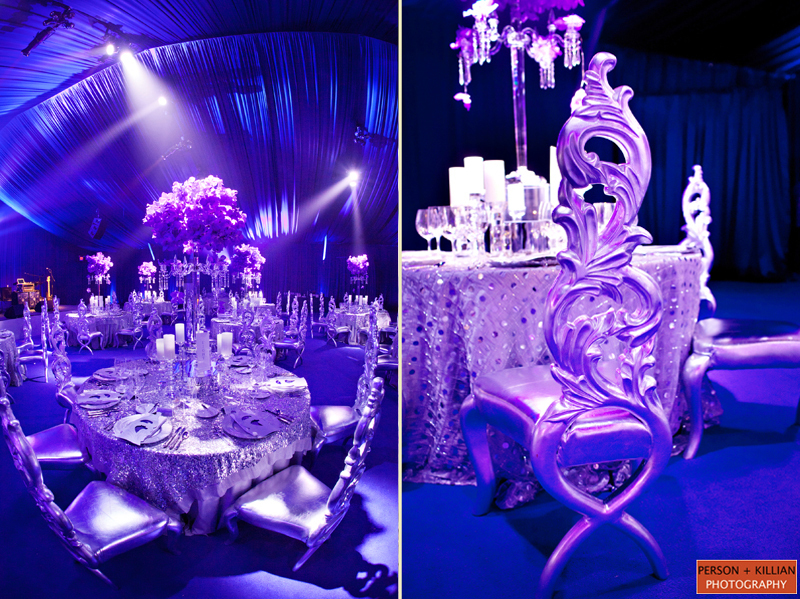 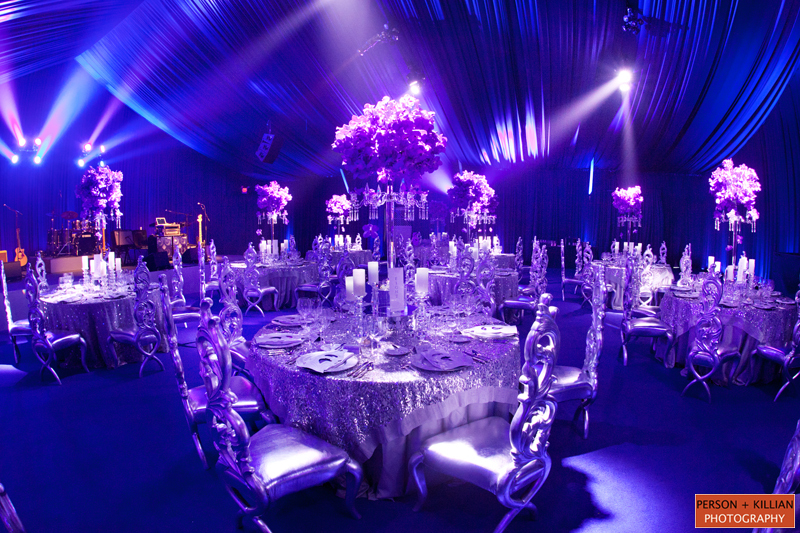 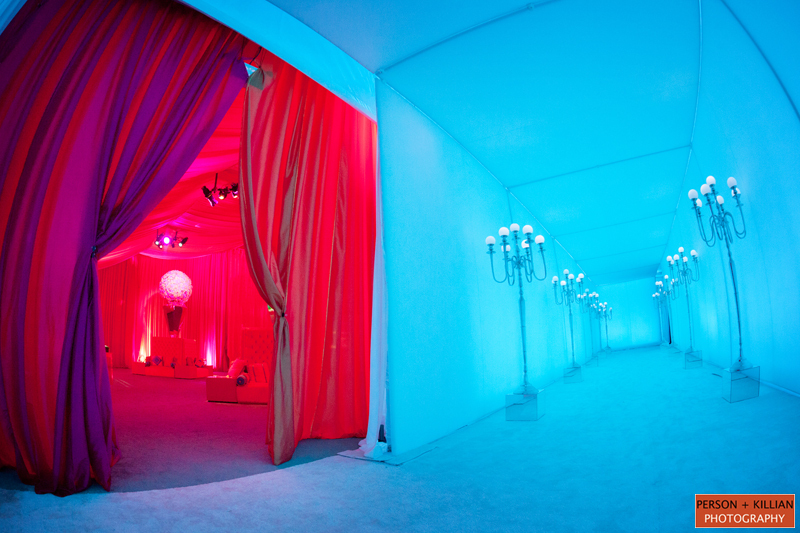 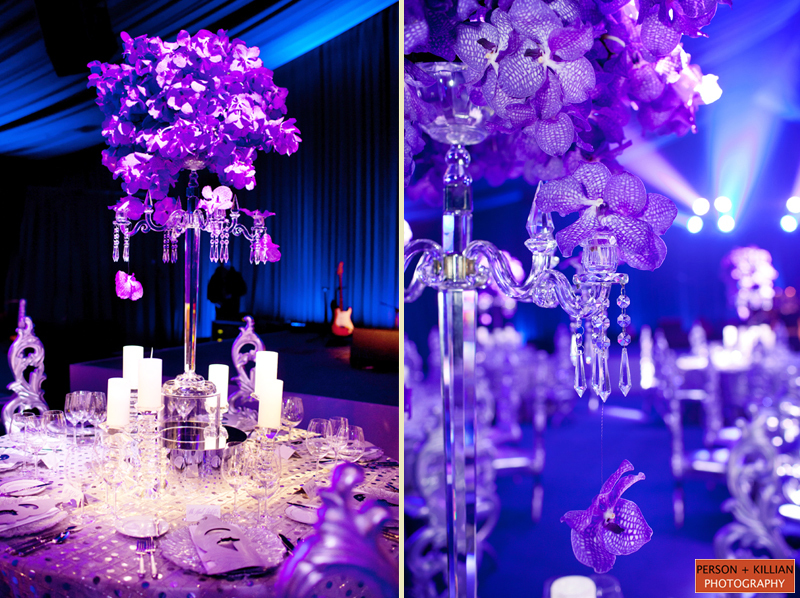 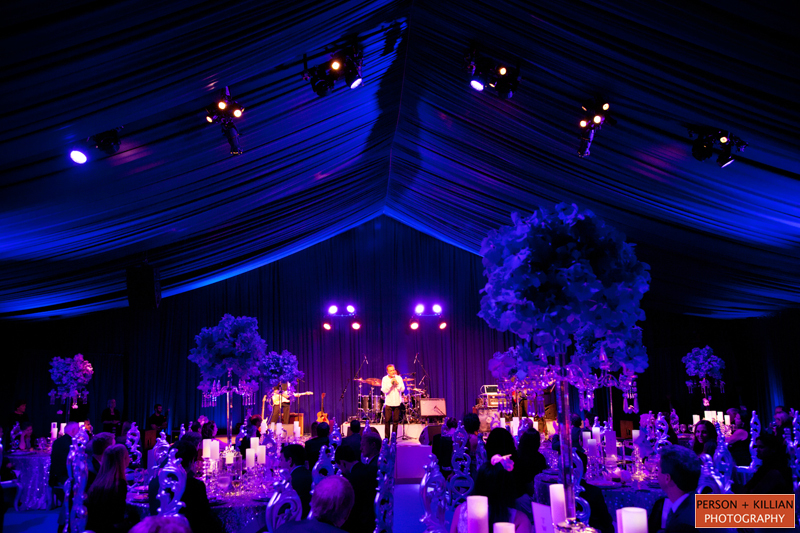 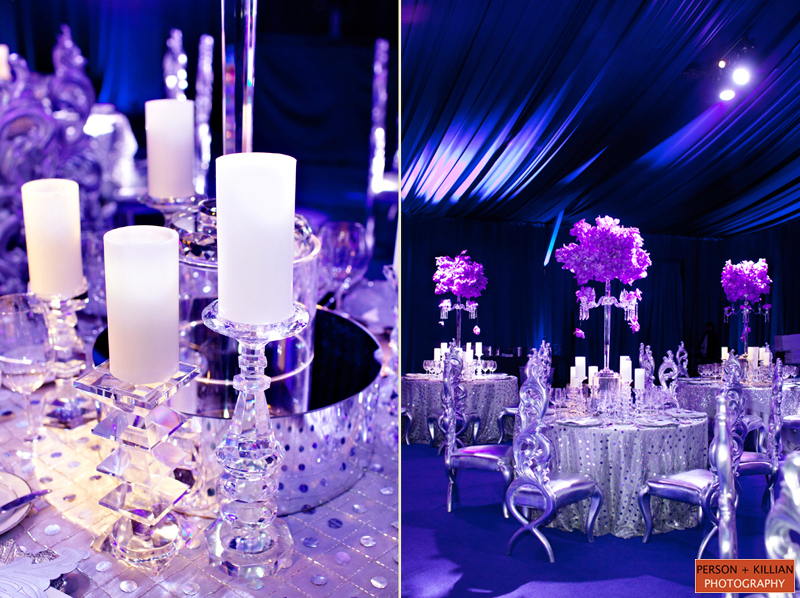 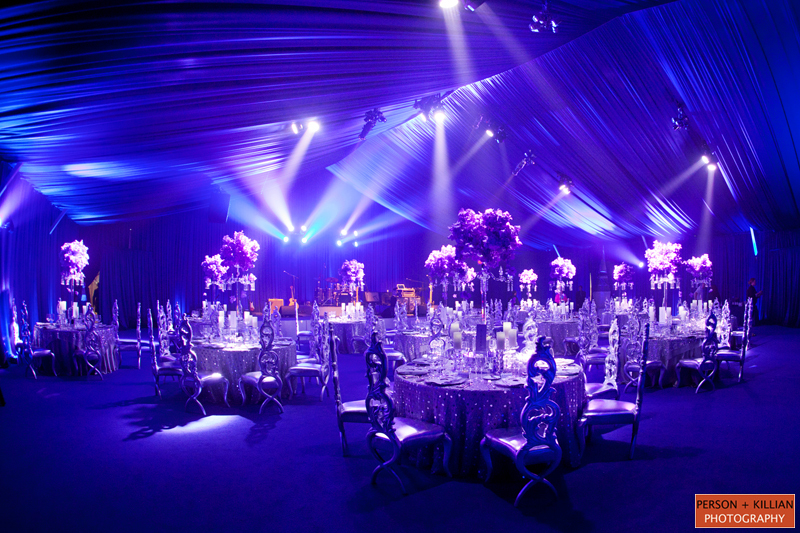 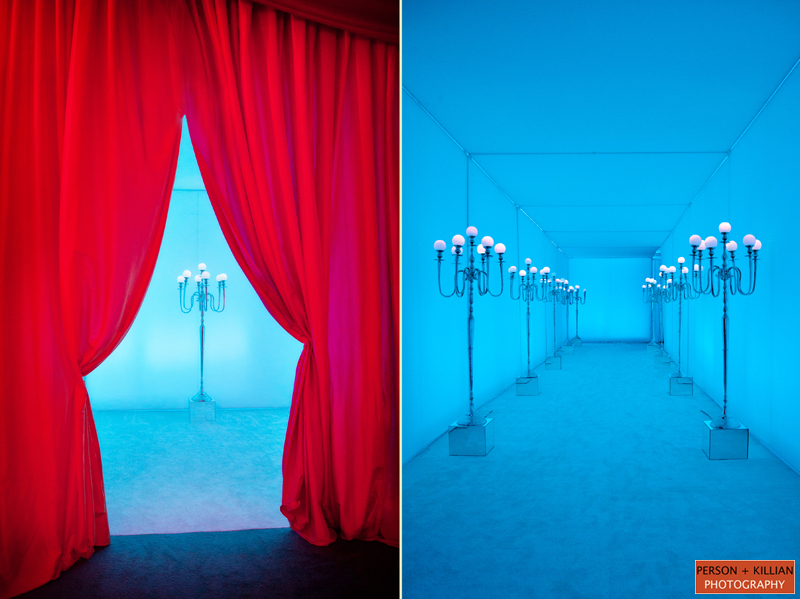 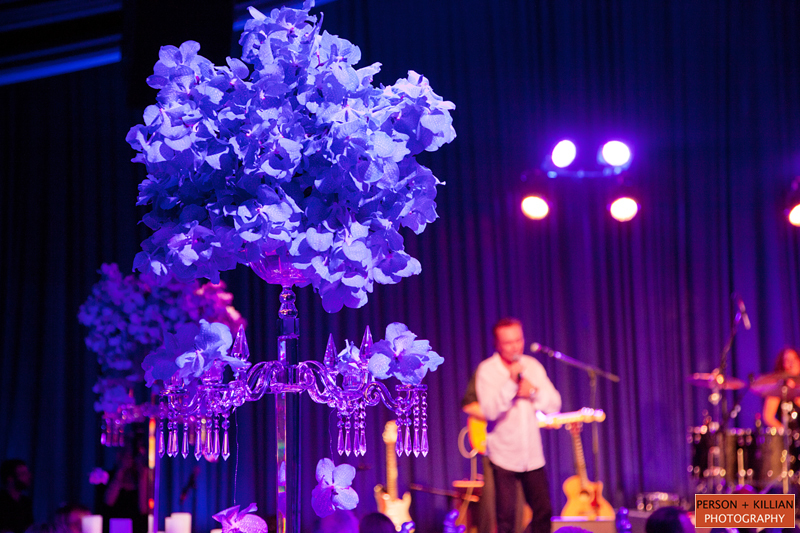 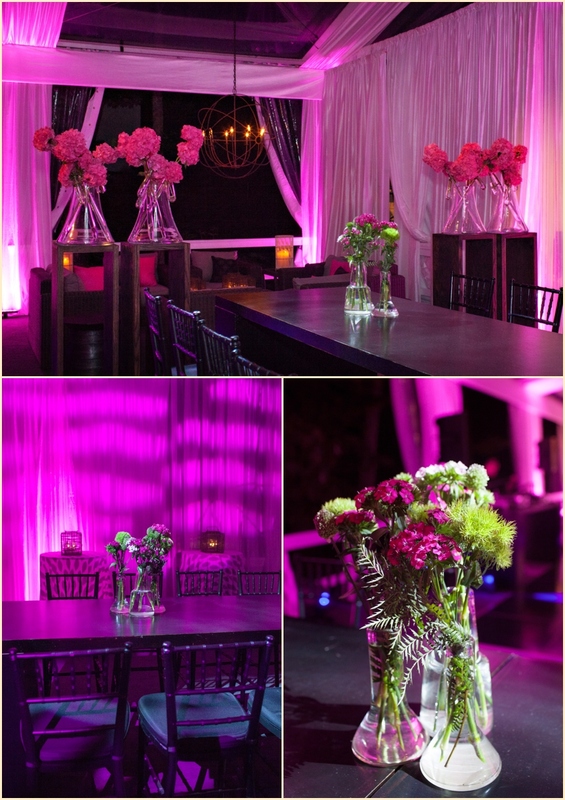 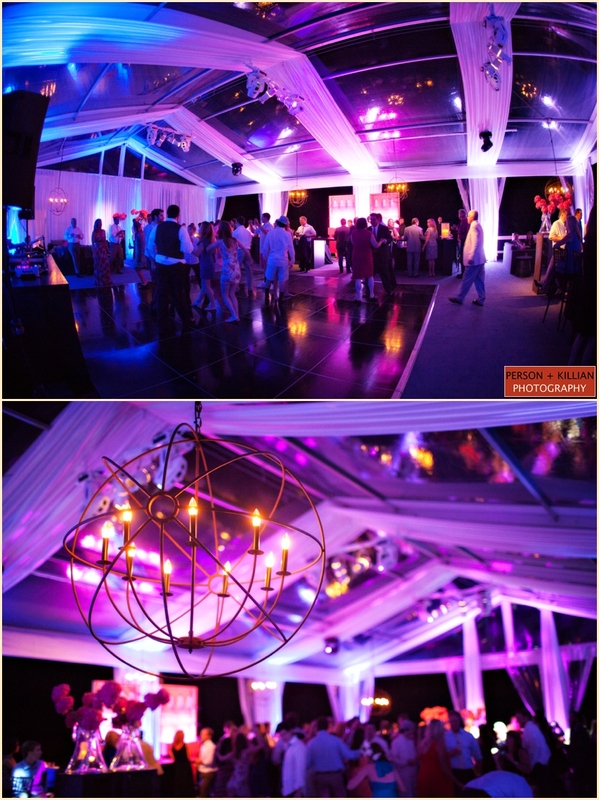 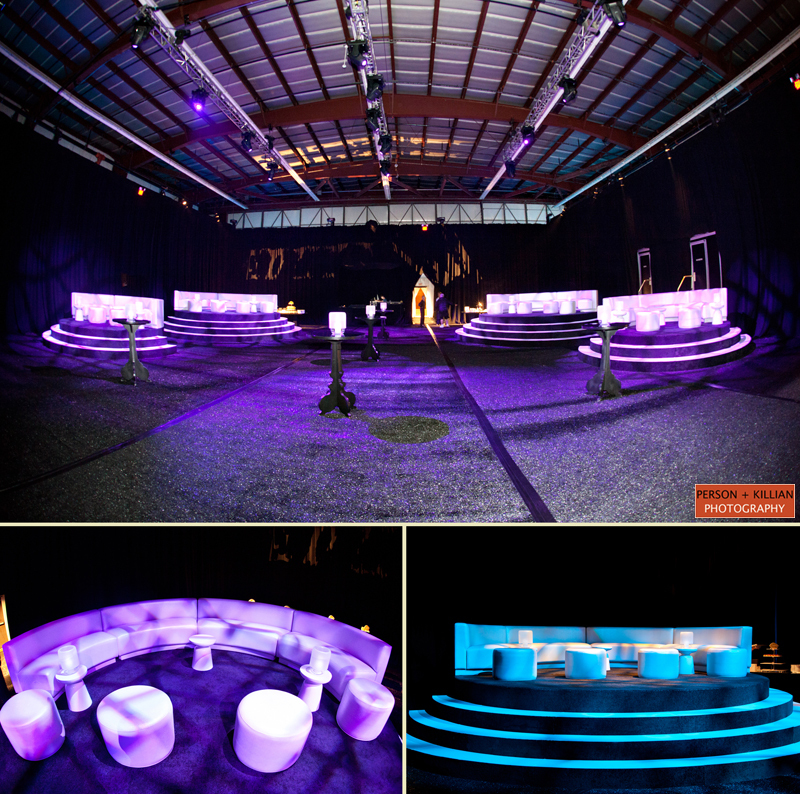 We also loved the textured blue and purple lighting on the dance floor, giving the ballroom a great pop of color. 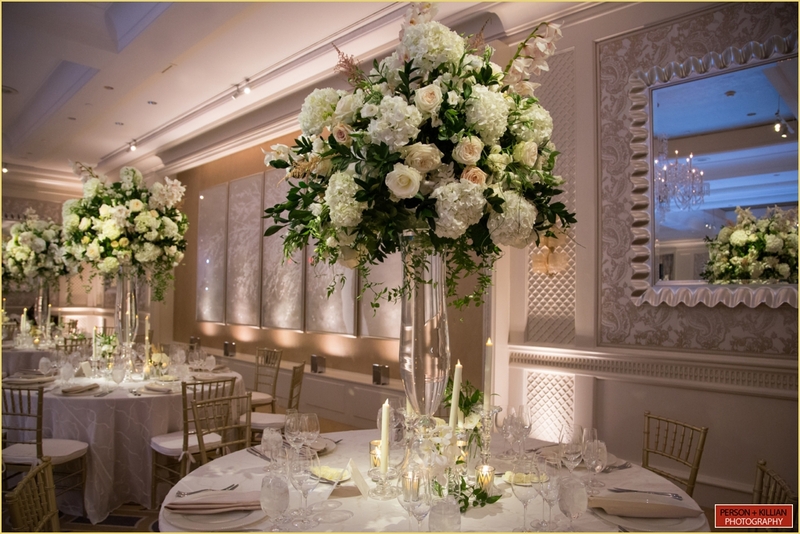 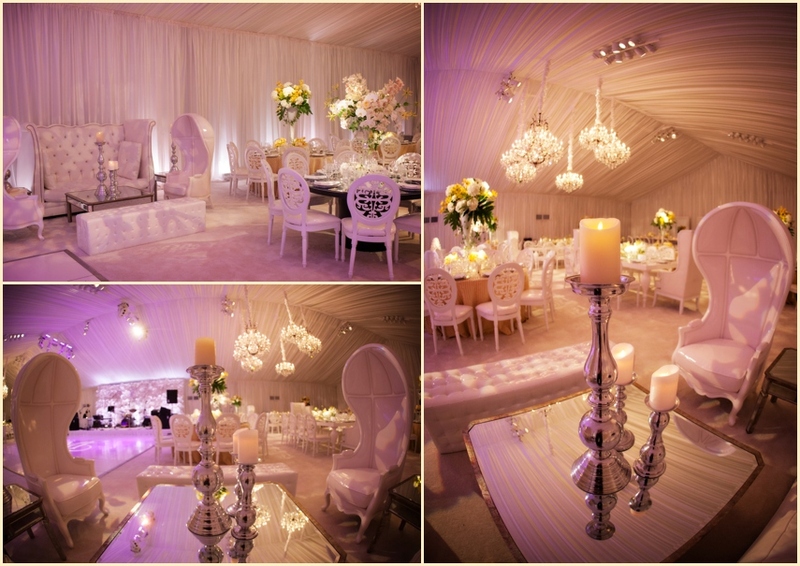 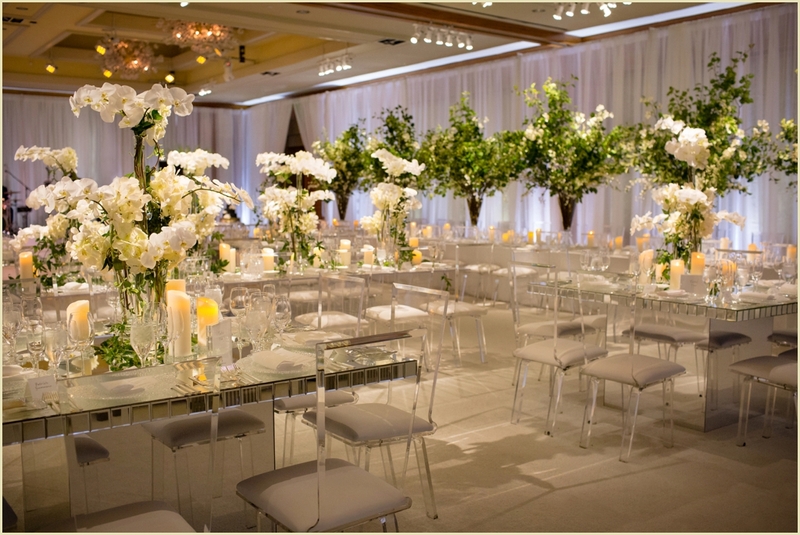 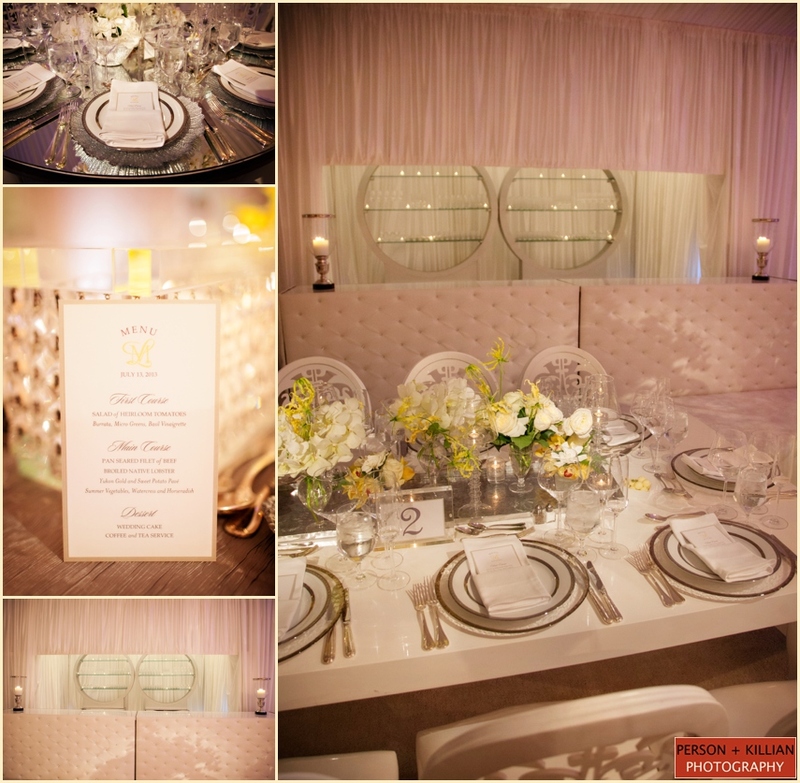 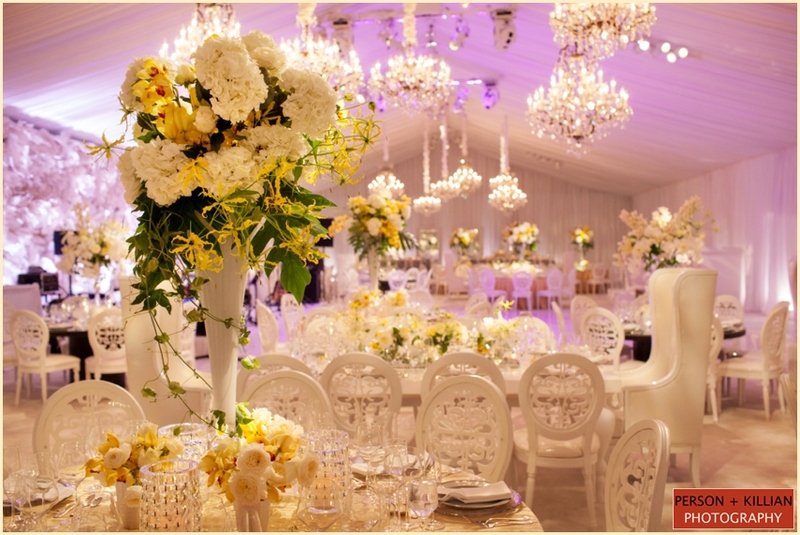 Large white candles in varying crystal holders gave the room a warm and intimate glow, and curved white banquettes in each corner of the room gave this traditionally elegant wedding reception a modern twist. 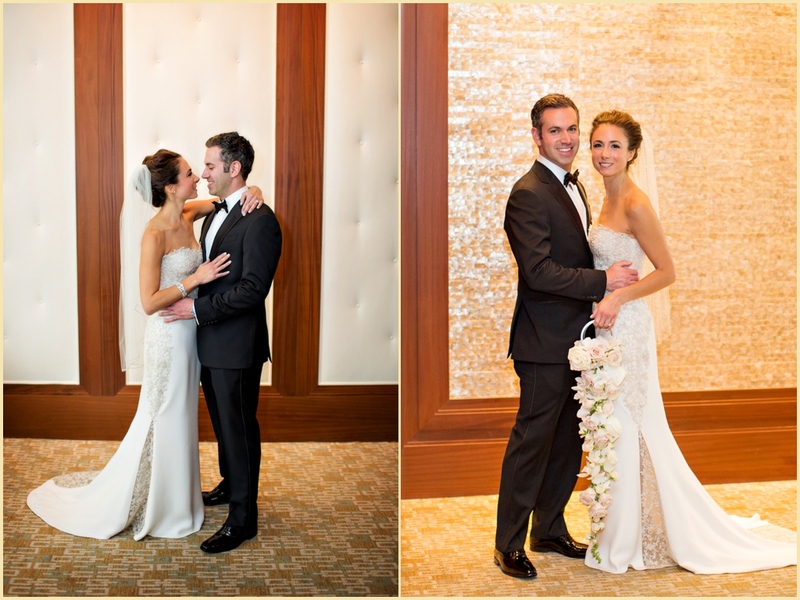 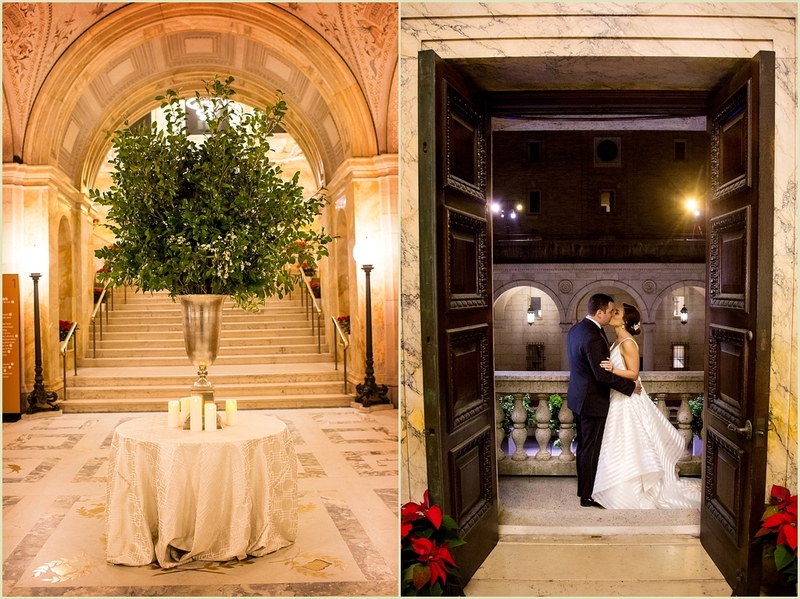 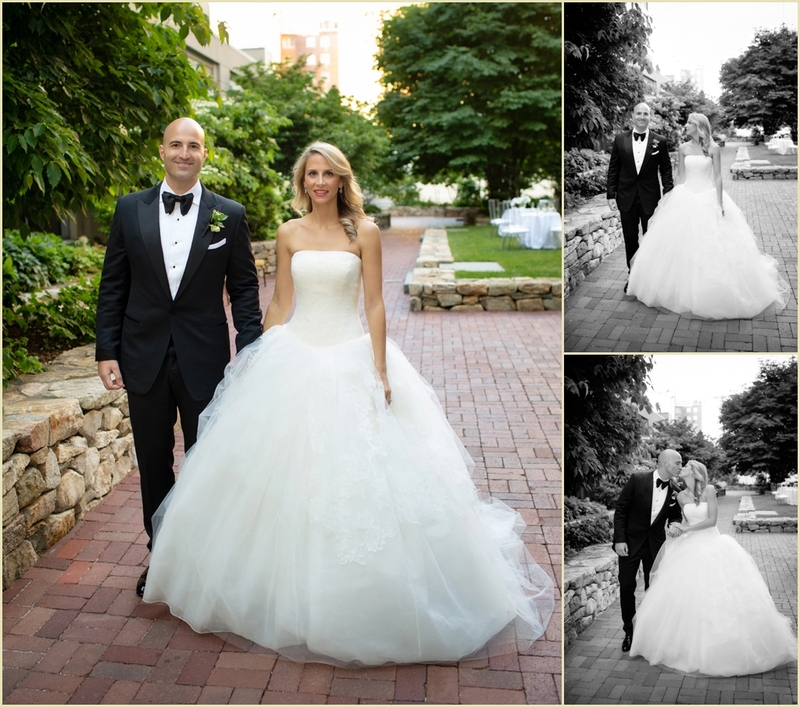 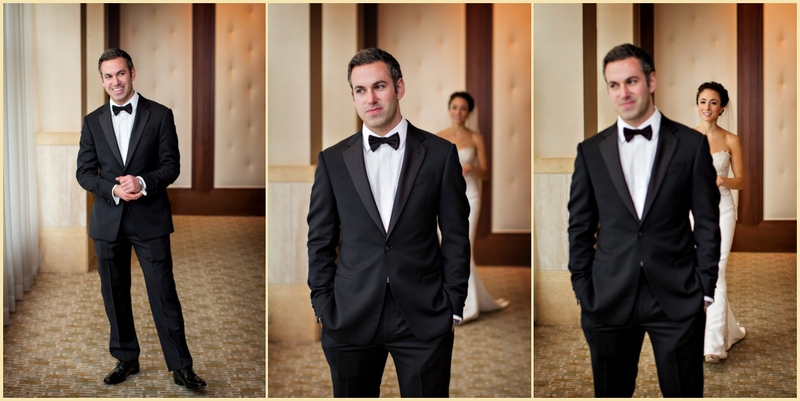 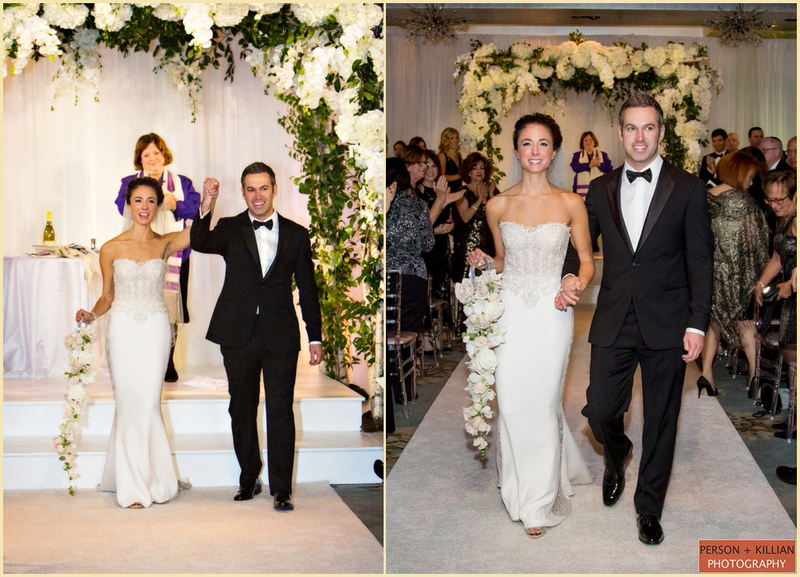 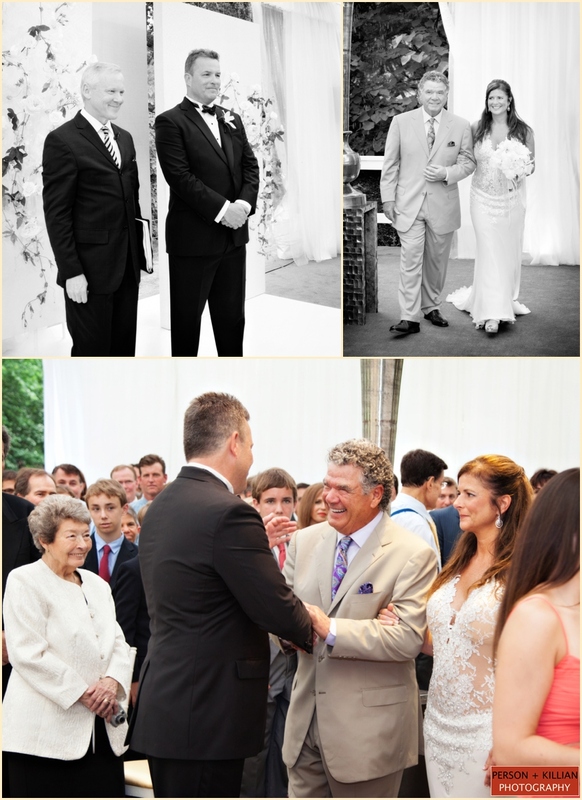 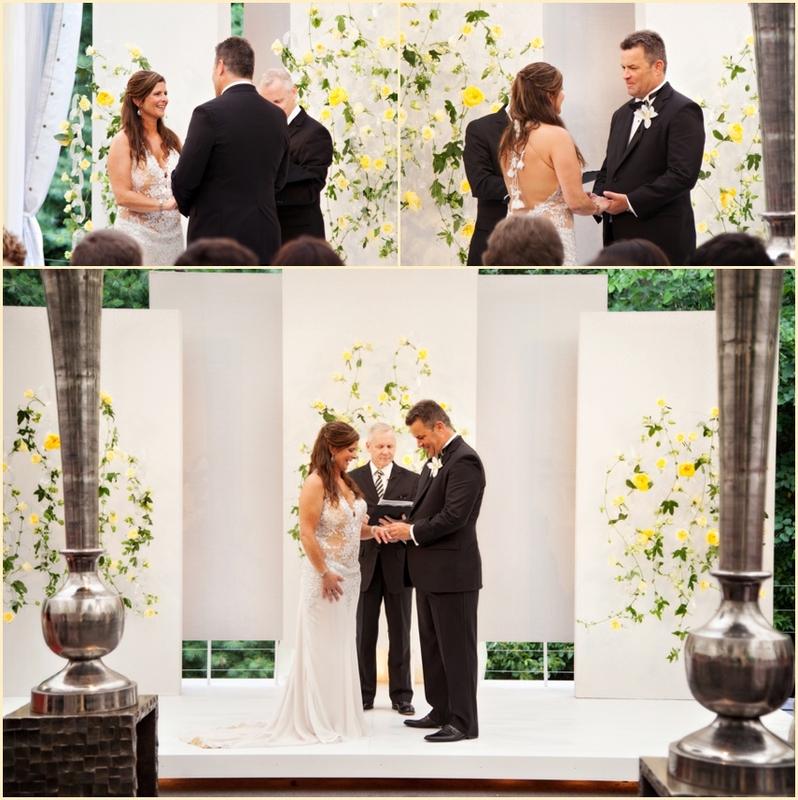 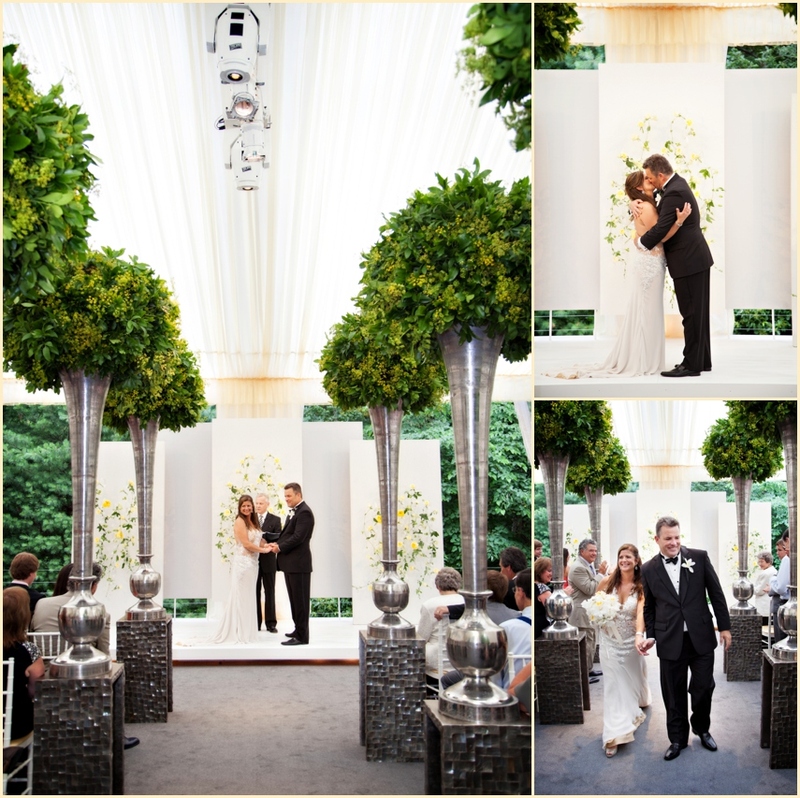 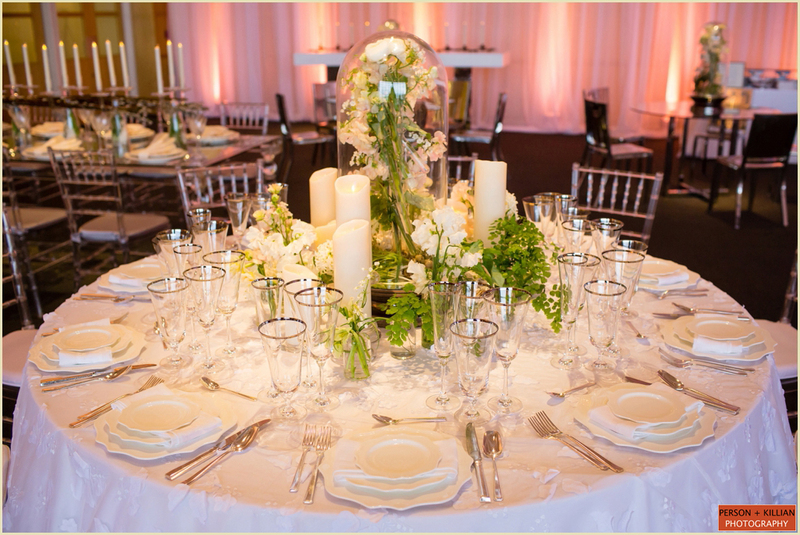 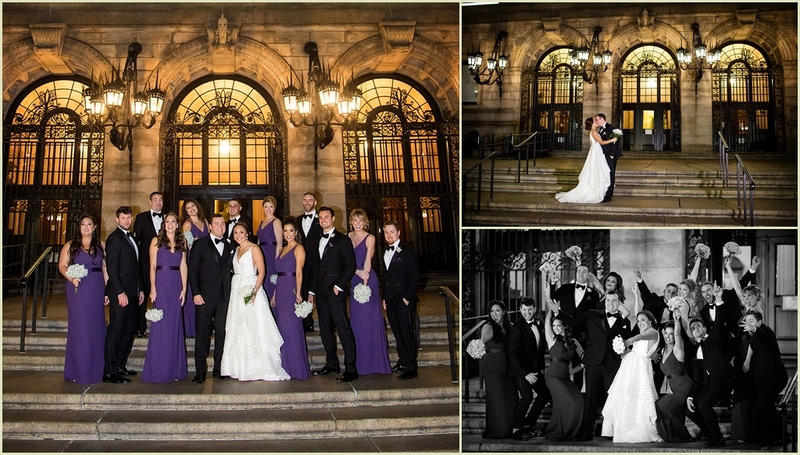 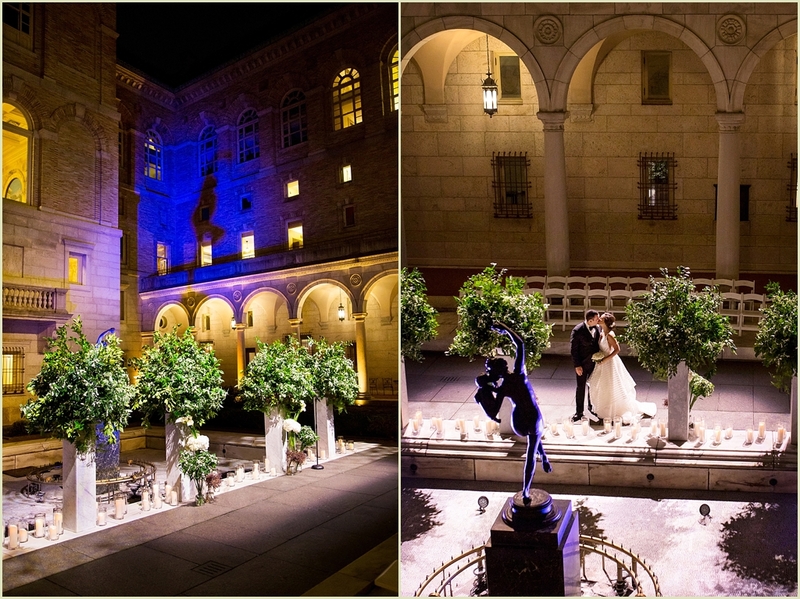 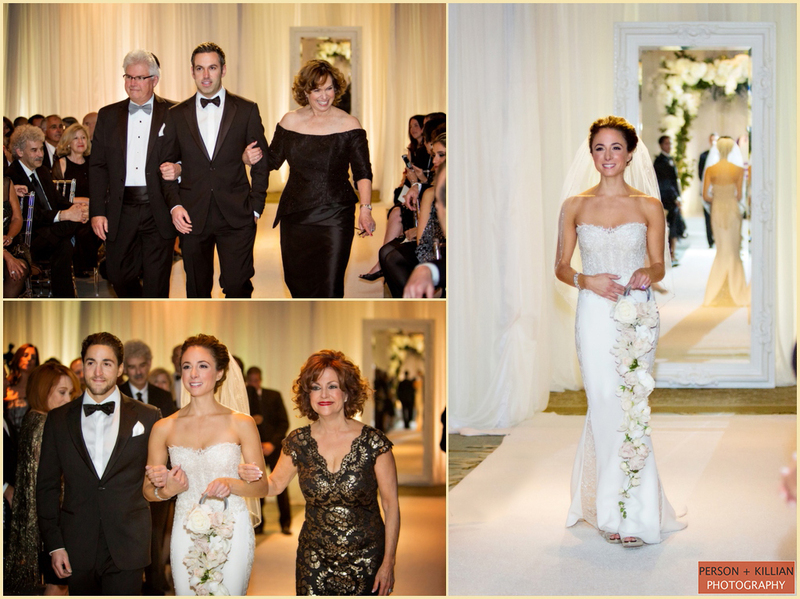 We were so happy to a part of this gorgeous Four Seasons Boston wedding. 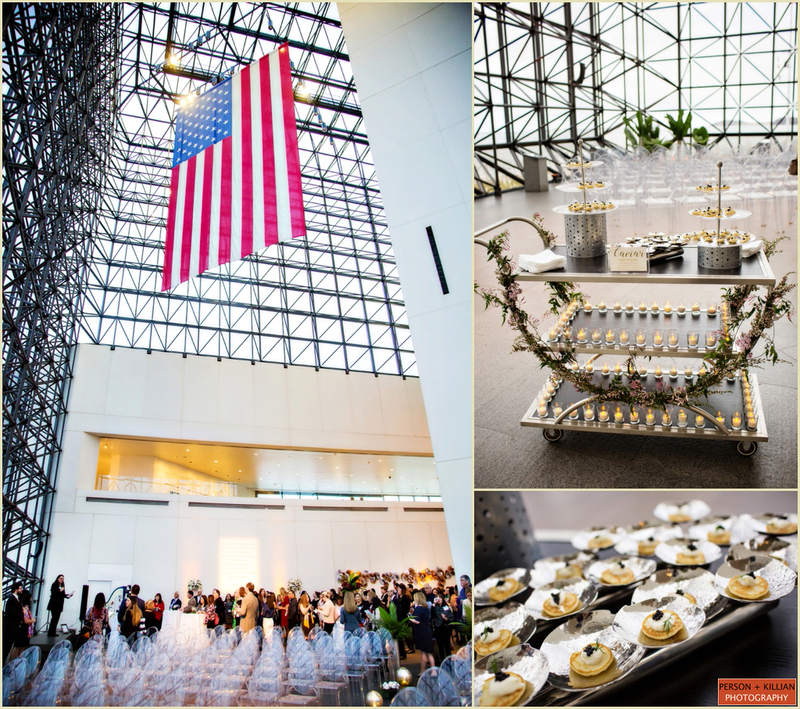 Special thanks to Phillip Deschamps and the Four Seasons Boston team, as well as the team at Janie Haas Events for such a wonderful event. 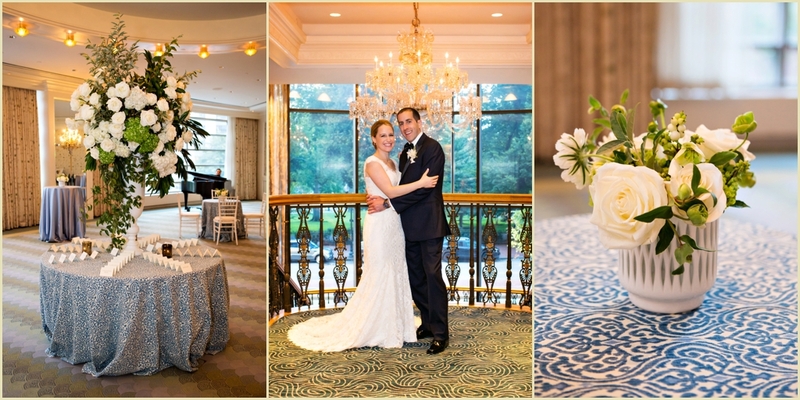 Congratulations Lindsey + Luis!